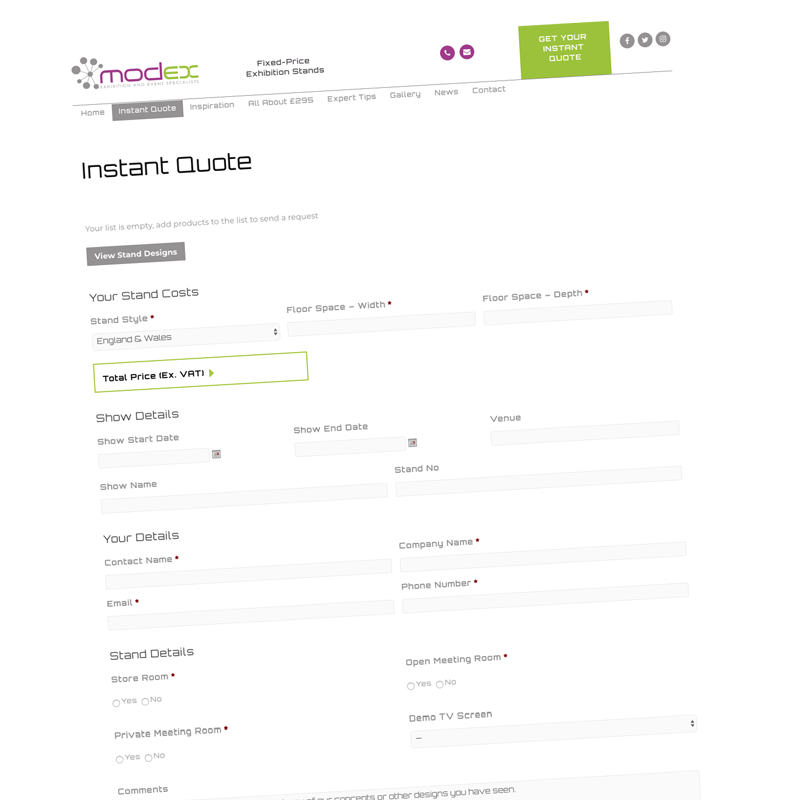 Our Inspiration page highlights just some of the designs we have produced over the last twelve months and has been designed to show you what can be done in your own space. 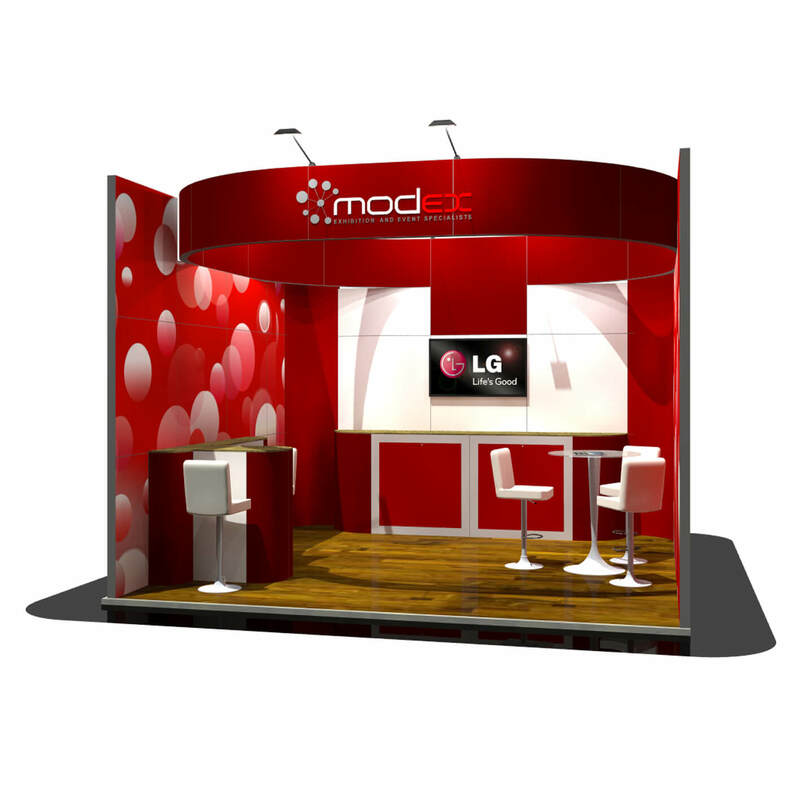 Take a look at the following stand designs and see how they can be customised for your specific business needs. 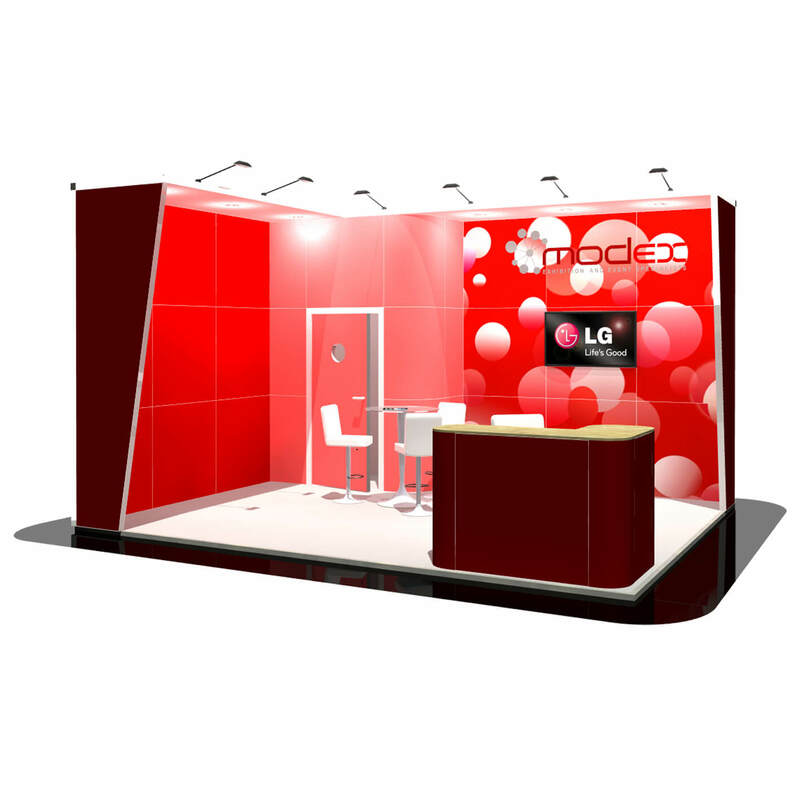 From the small and effective, to the large and show-stopping, here are a number of different booth layouts to fit any space. 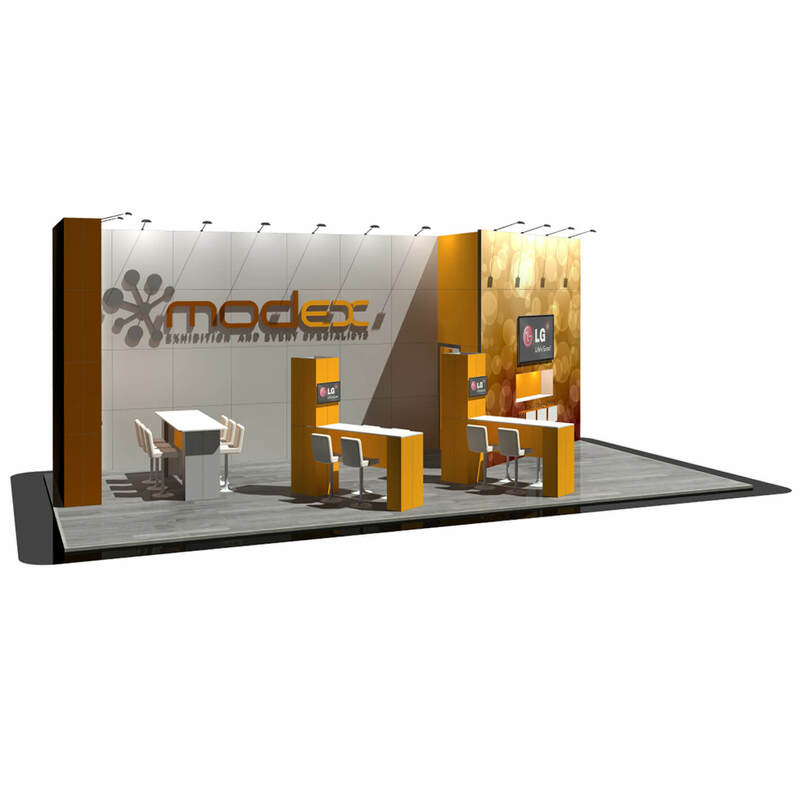 Whether you’re looking for a stand design that showcases your products, allows space for customer engagement or graphics and AV that catch a passer-by’s attention, MODEX offers an extensive service on all design elements to make sure you stand out. 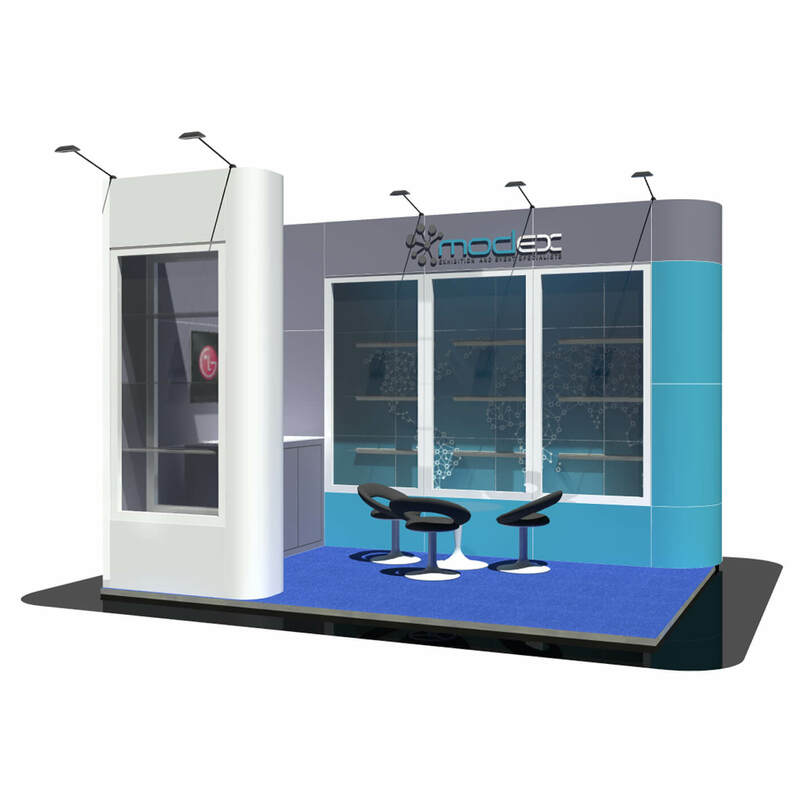 A three by two exhibition booth featuring recessed product display with peel back acrylic panels as well as a screen and lockable cupboard. 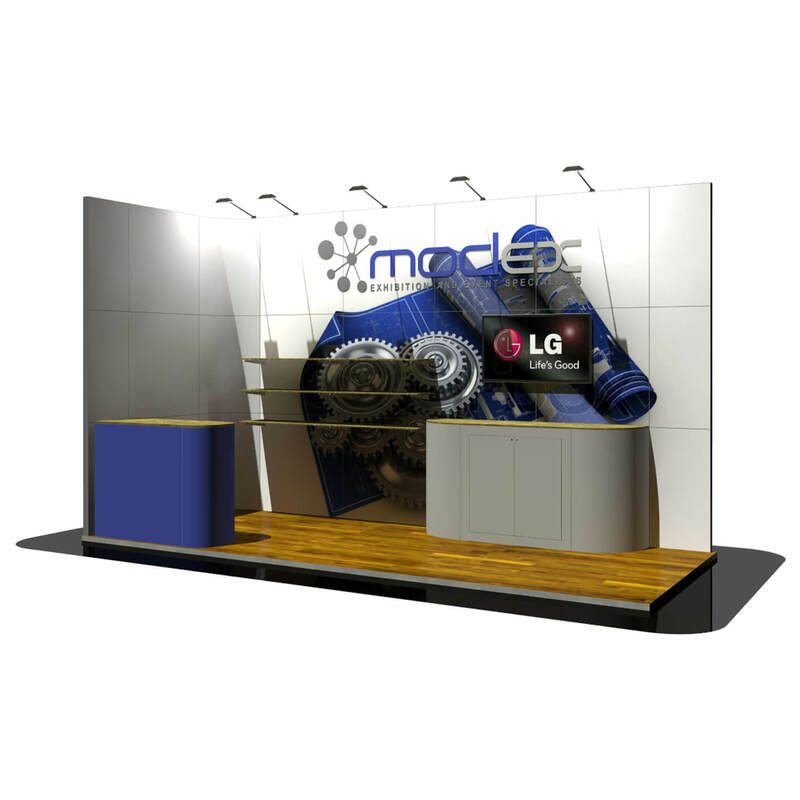 A three by two exhibition stand designed with an under lit header section, shelving for product display as well and a lockable cupboard and screen. 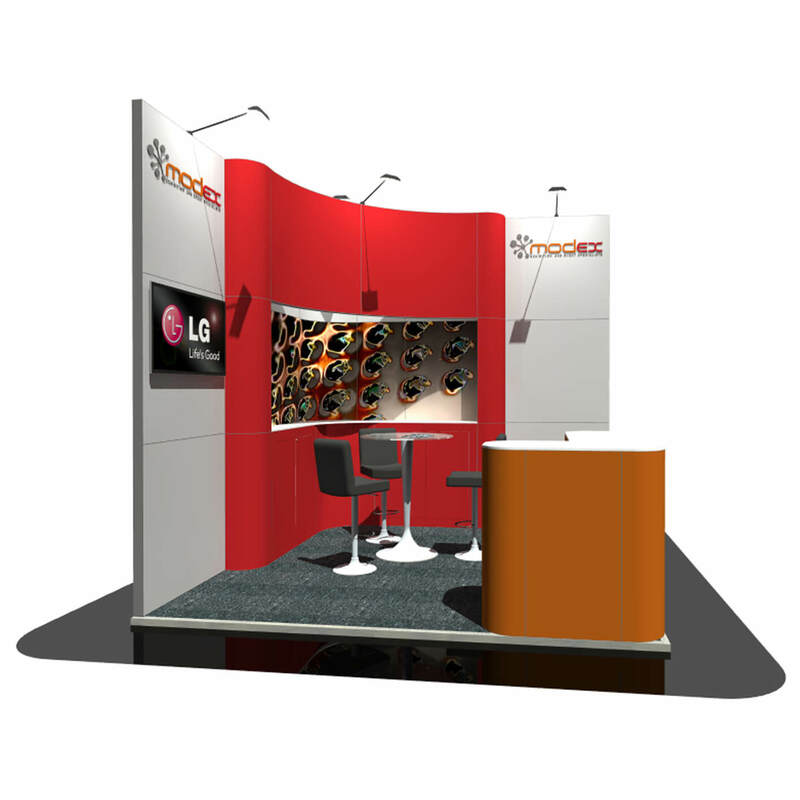 A three by two exhibition stand featuring a curved header section ideal for brand promotion. This three by two design features a front counter to interact with passers-by as well as an under lit header section. 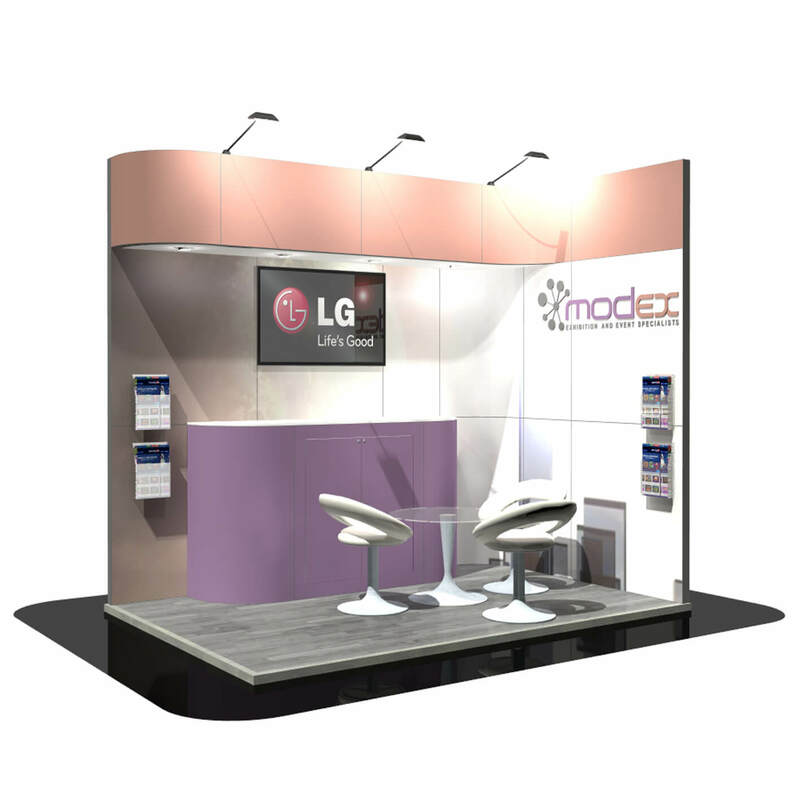 Designed to fit within a shell scheme, this three by two exhibition design incorporates an under lit header section, display screen as well as a lockable cupboard. 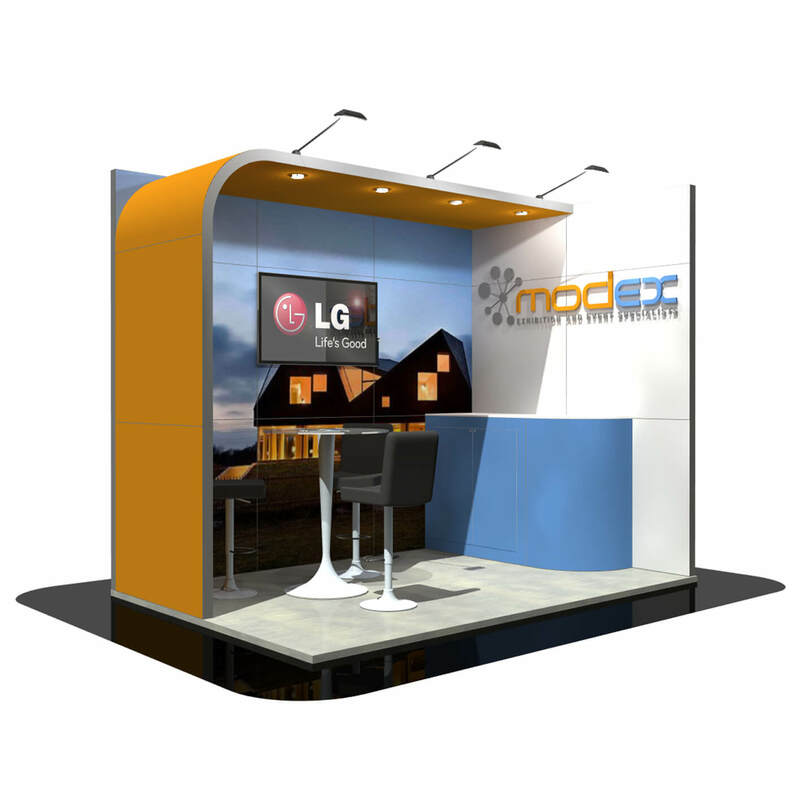 A stunning arch creates an interesting feature to the 3 x 2 stand. 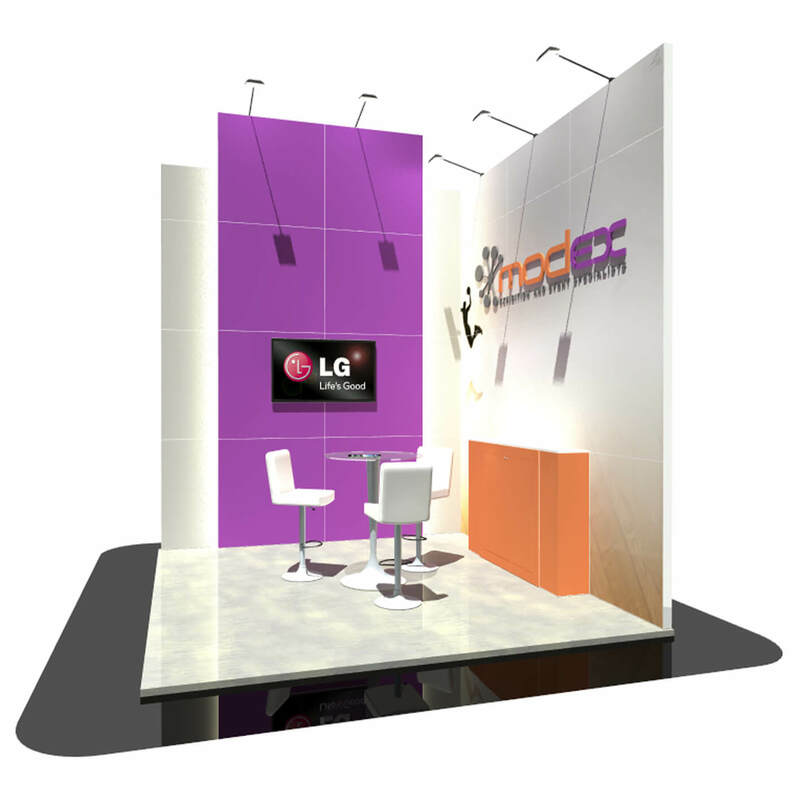 A simple 3 by 2 design with extended counters to display products and interact with visitors. The arch on this 3 x 2 design helps define the space. The back cupboard incorporates a glass fronted fridge. 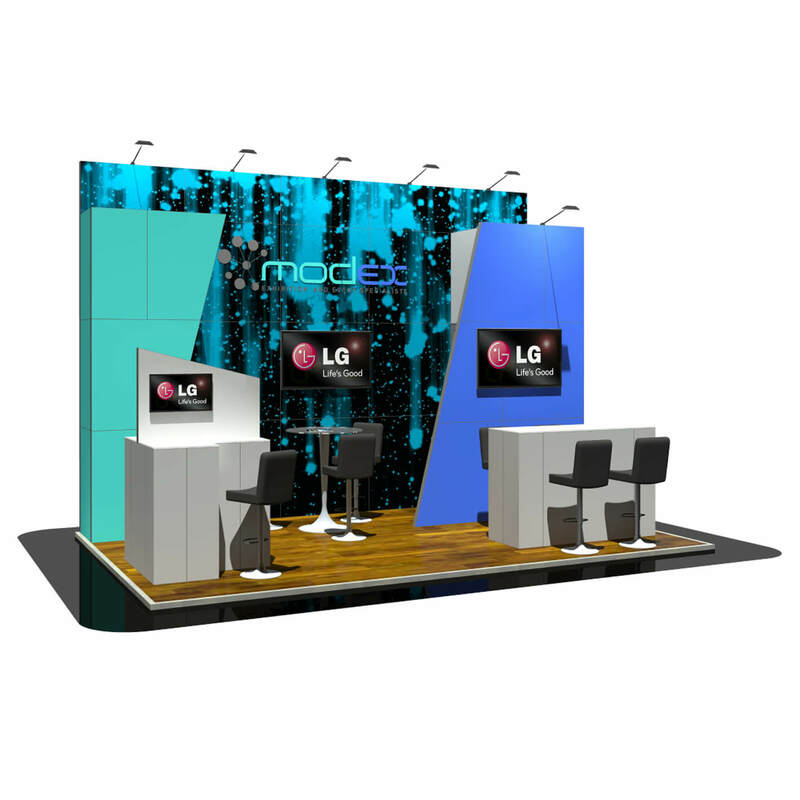 Overhead branding, a curved bar and display screen all feature on this three x three example. 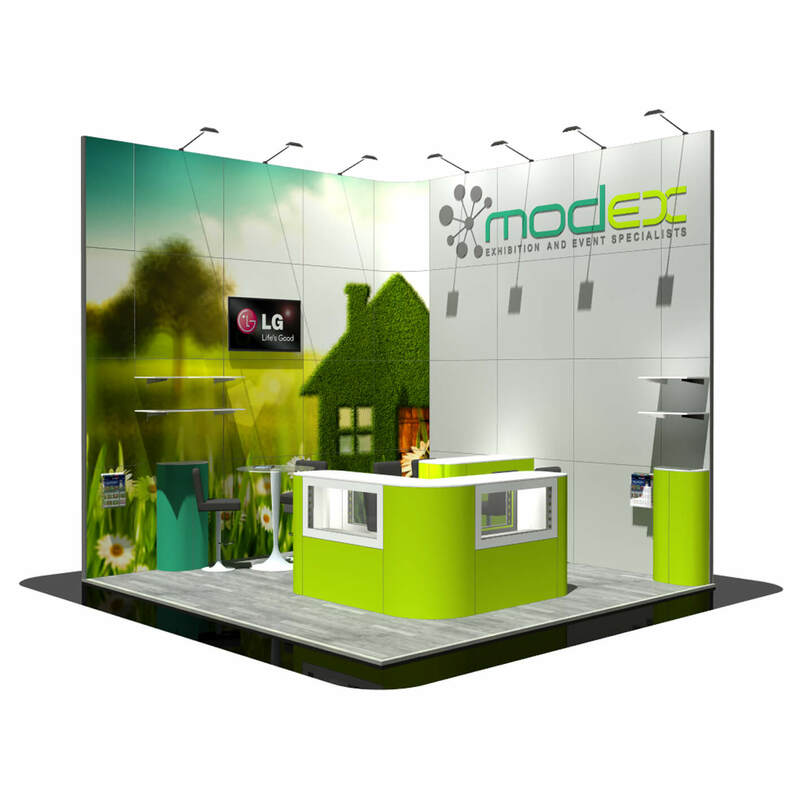 A nice clean and simple exhibition design. 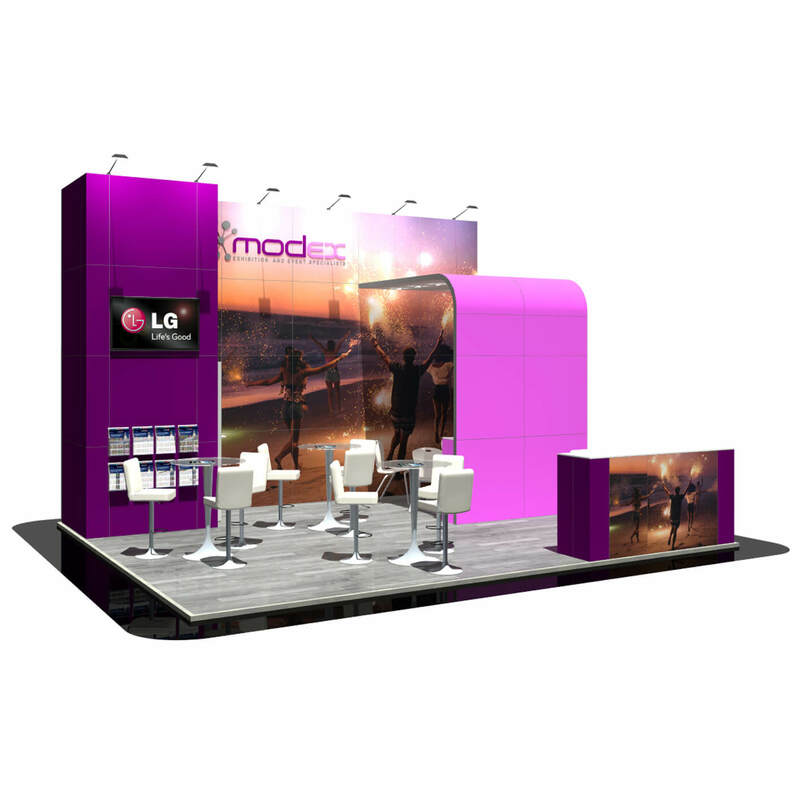 Let the graphics do the talking on this 3×3 stand. Four metres high, prominent branding and lots of lighting. This three by three booth also incorporates a fridge locked away in a cupboard. 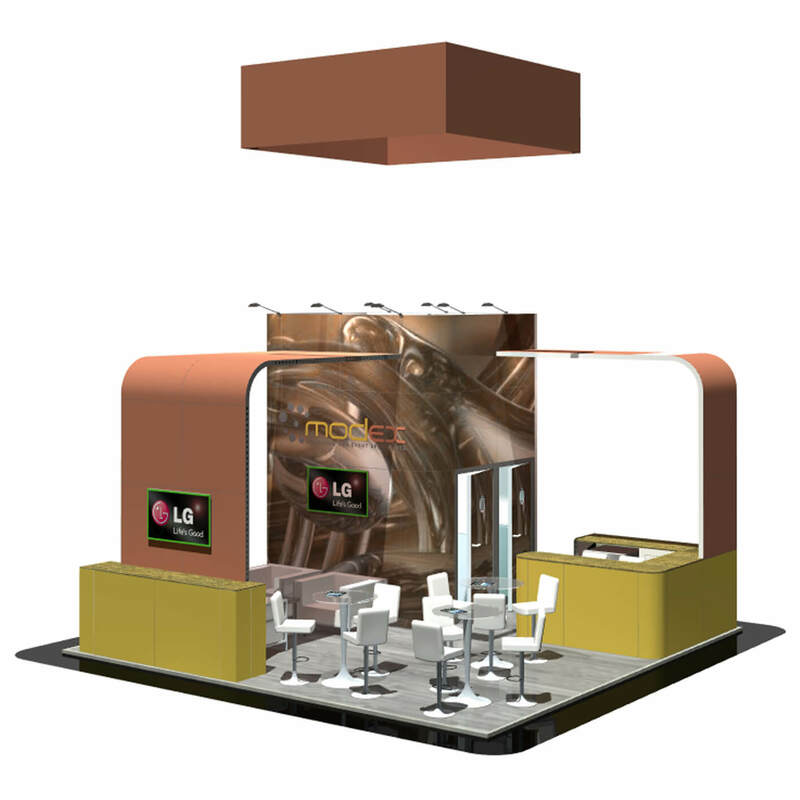 A 3 x 3 trade booth with a corner counter at the front of the stand and low seating at the back for more formal chats. 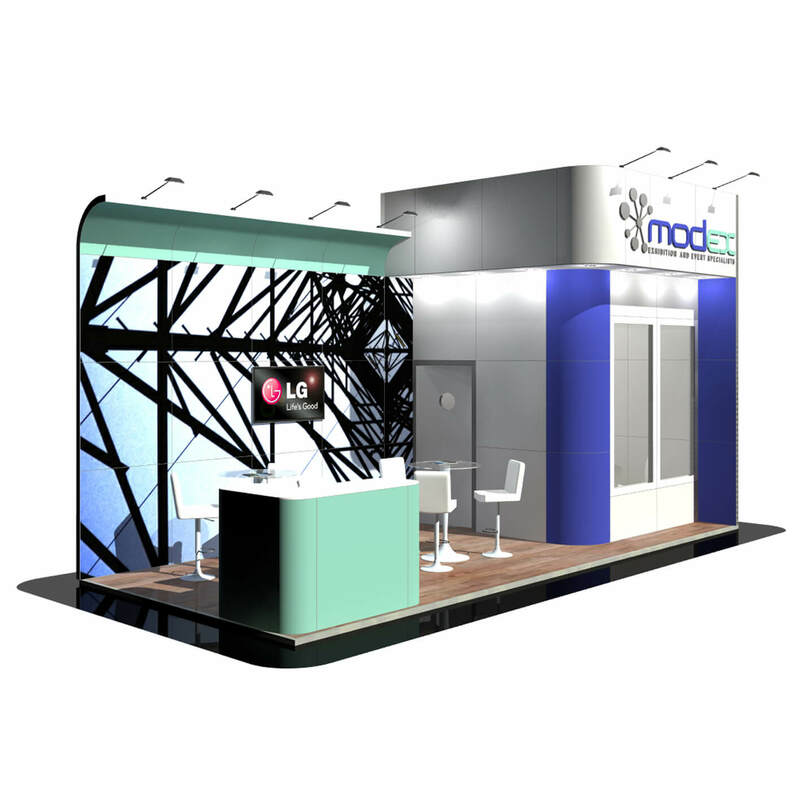 A header section dominates this three x three stand design. Supported in part by the walling on the right-hand side, which also creates a semi private workspace behind. 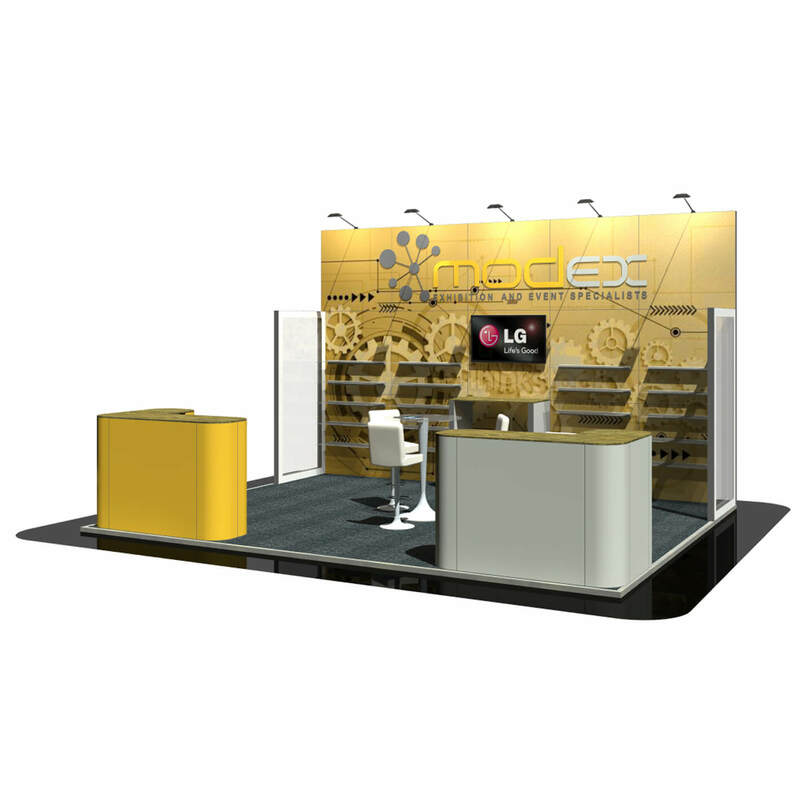 The protruding corner section on this 3 x 3 exhibition stand not only provides excellent branding exposure, but a sizeable display counter for products and lockable storage underneath. The high up flat angled header is perfect for your company logo. This three by thee design is open and inviting for stand visitors. Large lockable corner cupboard. 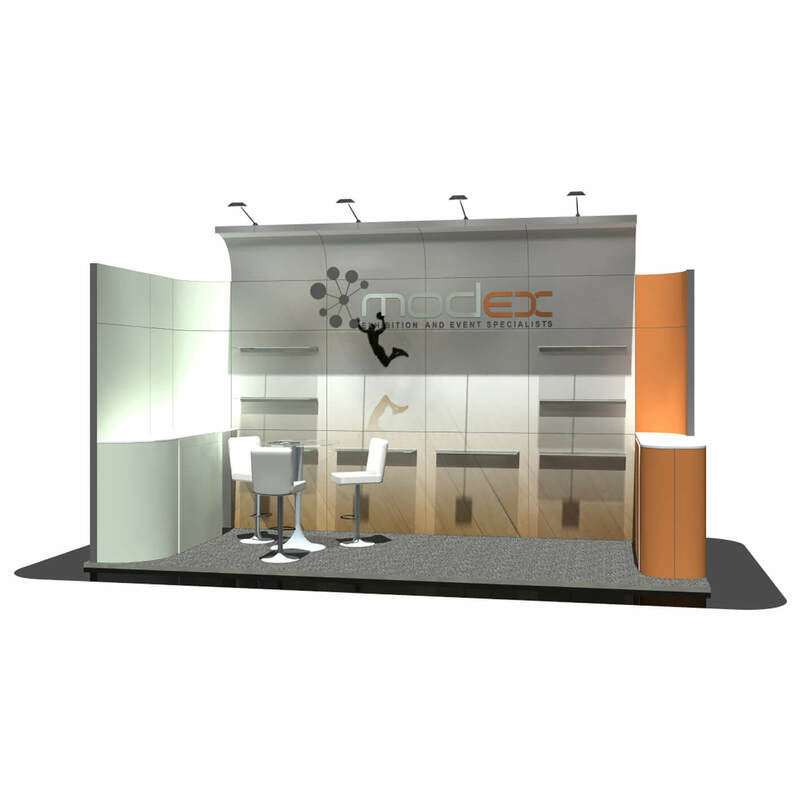 A design featuring two workstations or demo areas, both with locking storage beneath. A three by three stand enclosed on three sides. Design to fit within shell scheme, the design features an overhead ring for impact and branding. A 3×3 design with an eye catching 4 metre high column, edge lit with LED lighting – what better way to promote your business. 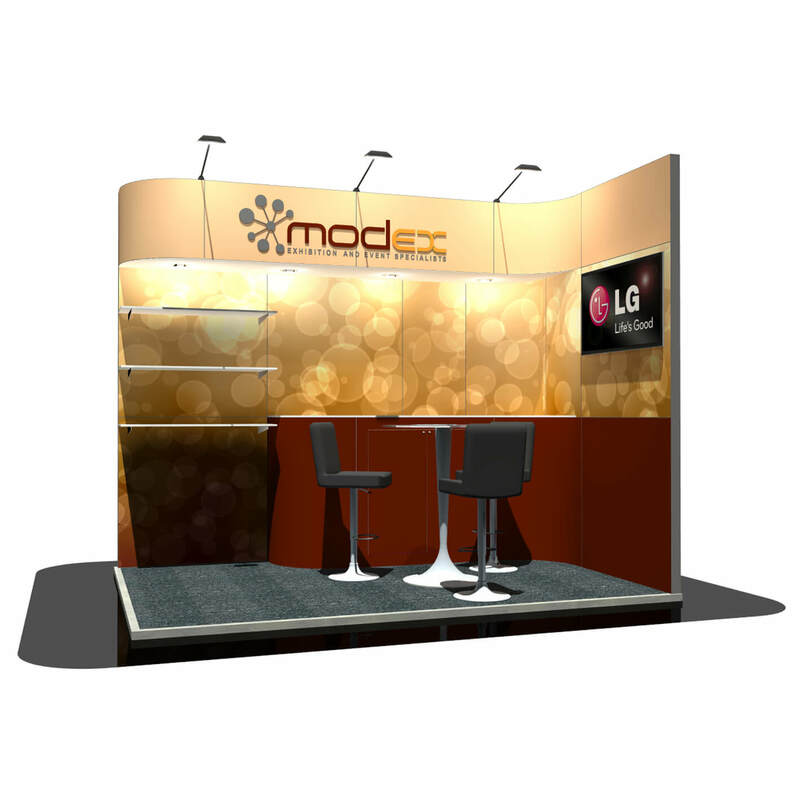 This four x two stand has an overhanging plinth – edge lit with LED lighting and spotlights underneath for added impact. 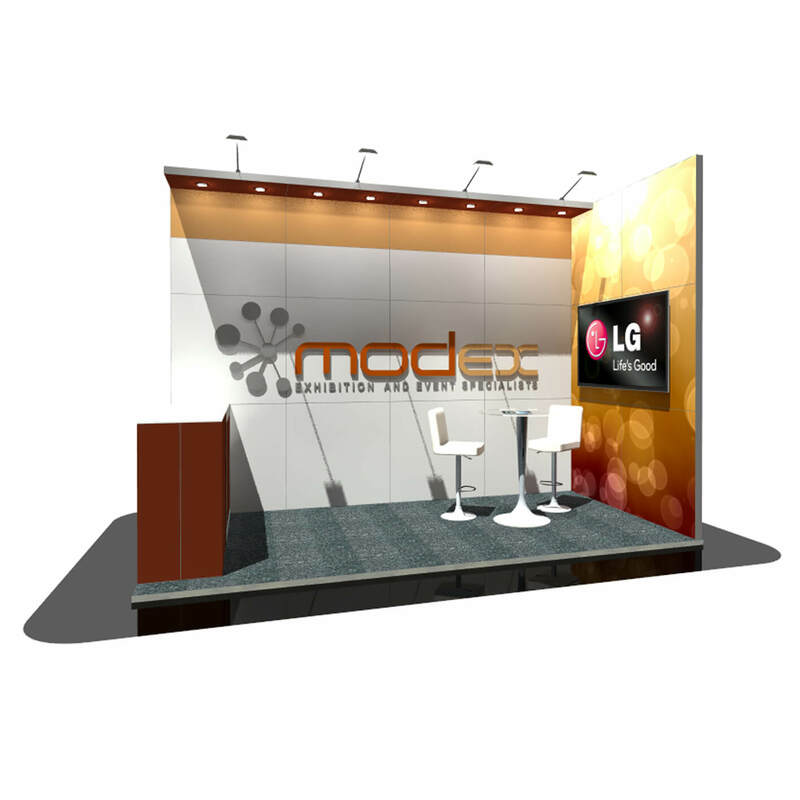 Promote your company with a rolling video displayed on the 60 inch screen. To the left of the stand is a large storage cupboard. 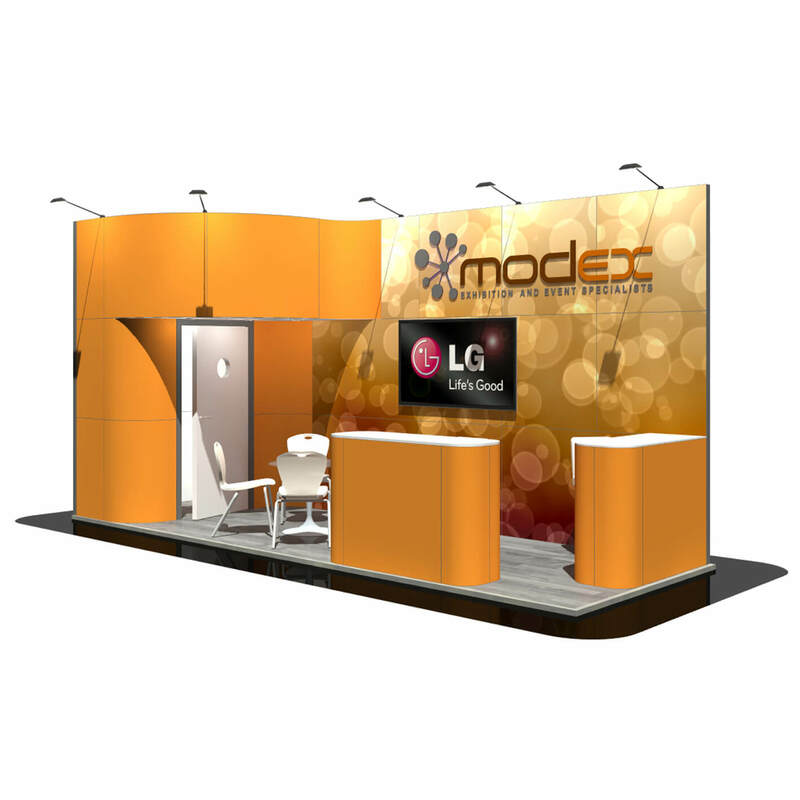 A 4×2 stand with a protruding back wall to the left – this contains a lockable cupboard underneath a fully lit display cabinet which will make any product stand out to the crowd. Along with a centre counter to sit and network with potential clients. 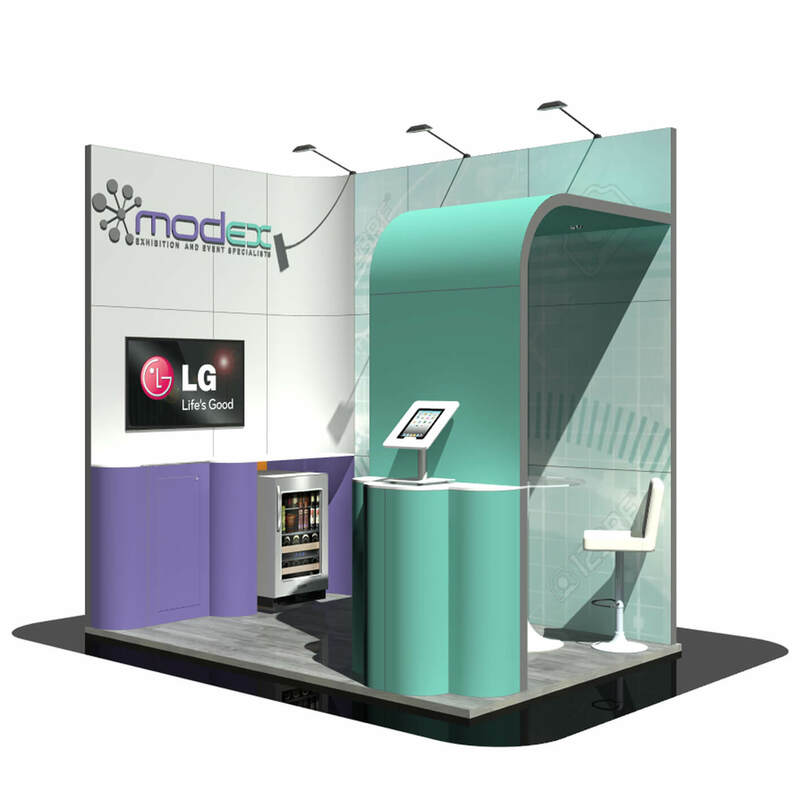 2 display screens positioned above a large cupboard on the back wall of this four x two stand – catch clients eyes with your rolling video to promote your business. 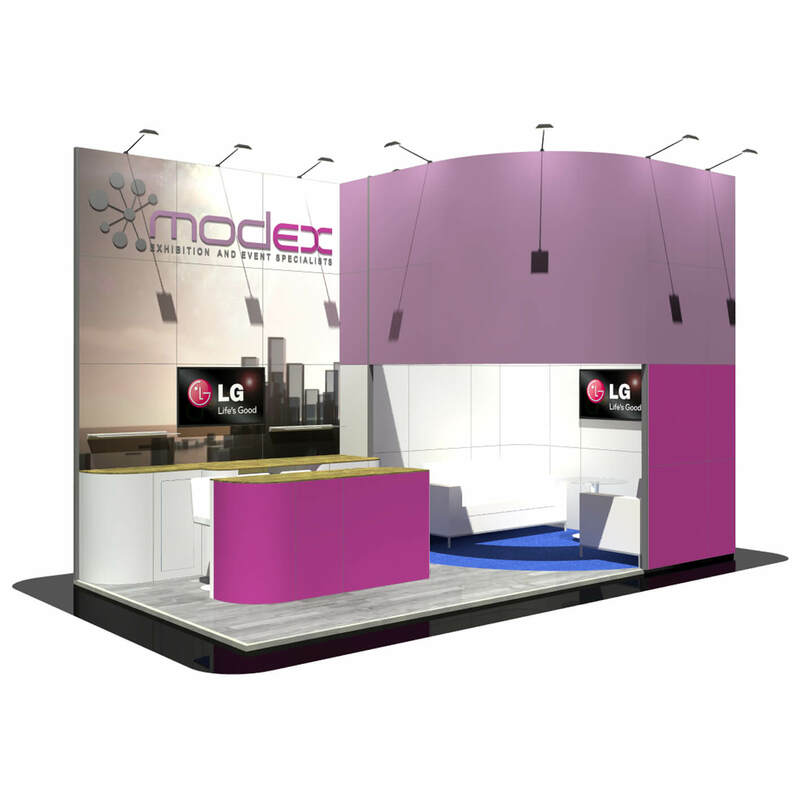 The whole stand has LED edge lighting along the top walls and 2 large counters at the front making the stand more enclosed. 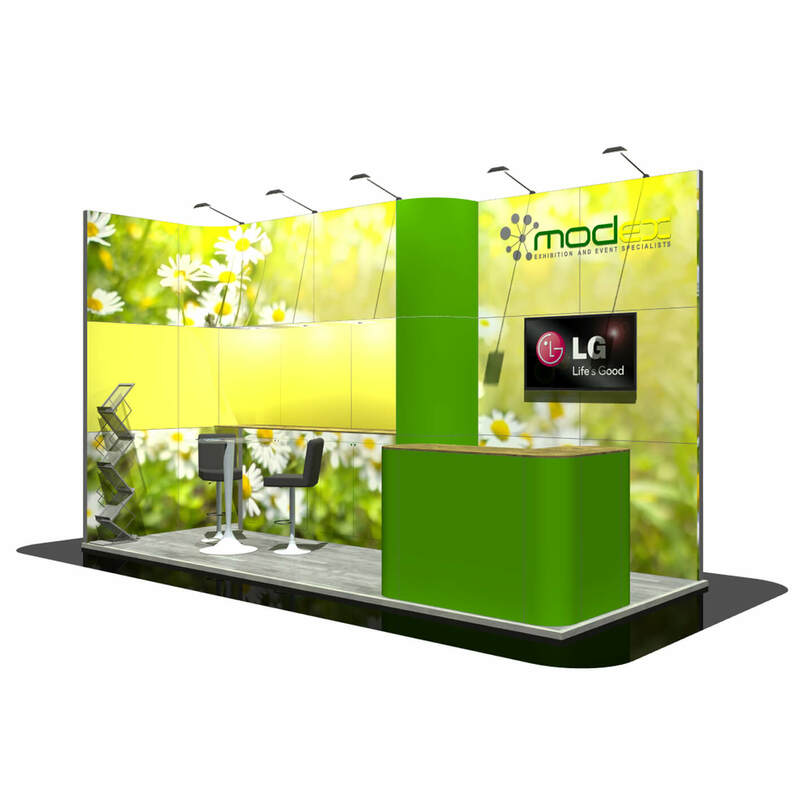 The main wall of this 4 by 2 stand has plenty of advertising space to promote your company including a 40 Inch display screen. 2 large cupboards for all your essentials and a compact poser table for discussion to take place. 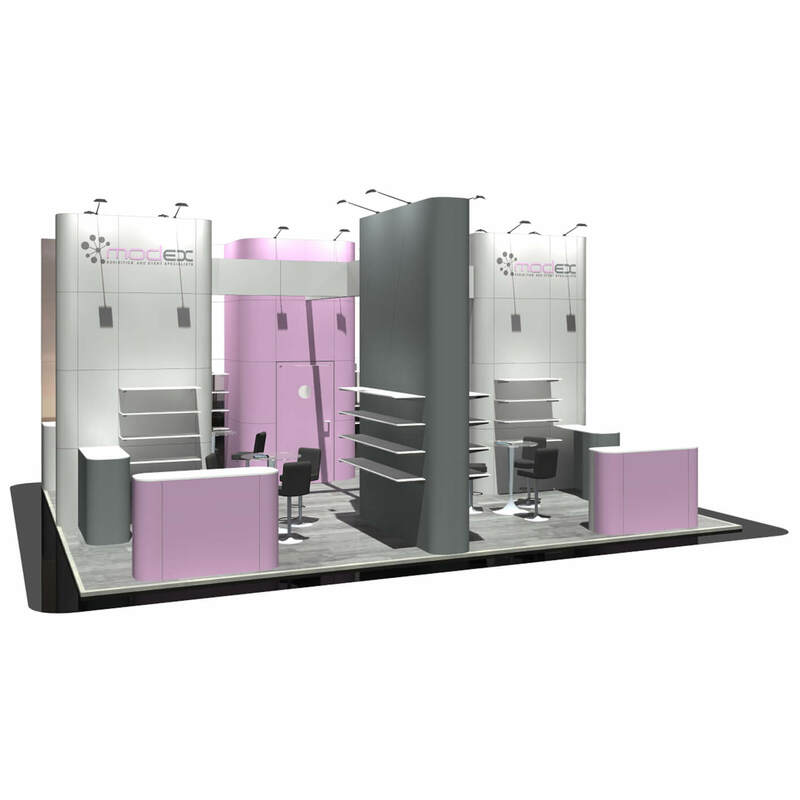 A four by two stand with added shelving to hold all of your products keeping them in full view, incorporating a low level shelf running along the whole of the back wall. 1 large lockable cupboard at the front where you can meet and greet clients. 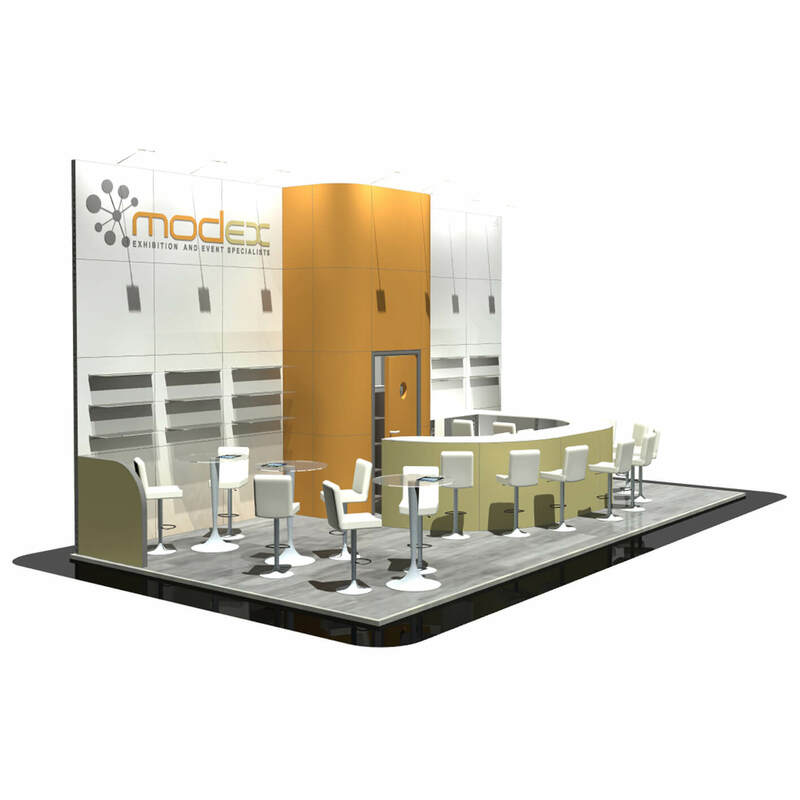 A corner ‘Bar Style’ counter set to the right with a centre table where you can invite potential clients and promote your business. 3 large shelves and 2 locking cupboards complete this 4×3 stand. 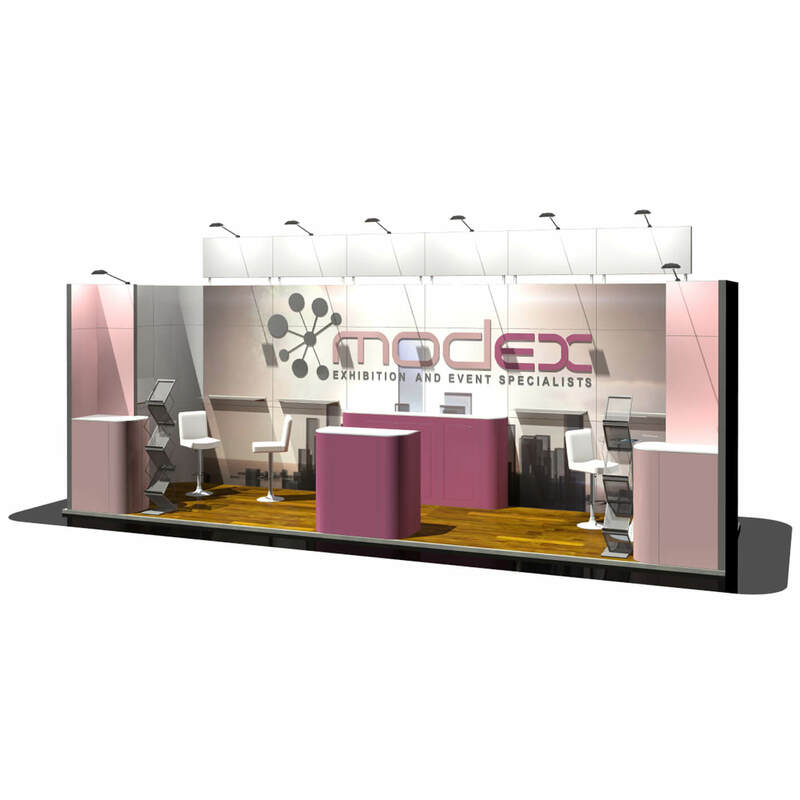 This four by three stand consists of a metre wide protruding wall to hide your media station, tiered cupboards to the front along with a table to sit and chat. 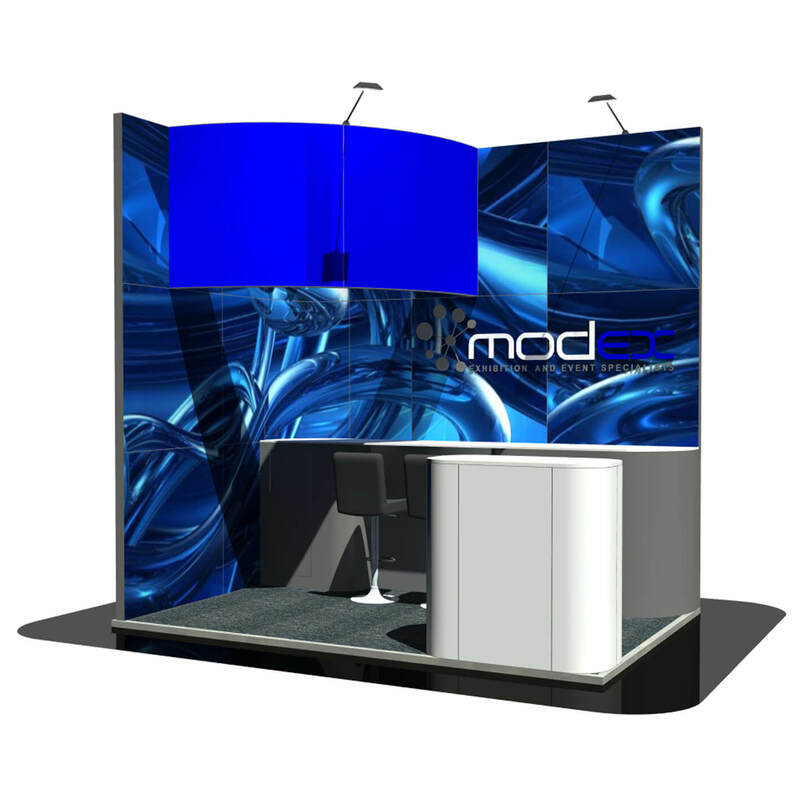 Plenty of display shelving on the main wall where you can add branding graphics to make you stand out at a show. Fully lit internal shelves with acrylic panels to enclose your promotional products are the main feature of this 4 by 3 stand. Includes a lockable cupboard which sits underneath a display screen and low level seating for formal chats. 3 continuous length shelves for a striking display with counter tops and locking cupboards below make this 4 metre x 3 metre stand look the part. The space above the top shelf is the perfect position for company branding. 4×3 stand with a large protruding header strip along with edge lighting, which creates a recess below for 1 lockable cupboard and 2 counter tops set into it for a neat and tidy look. 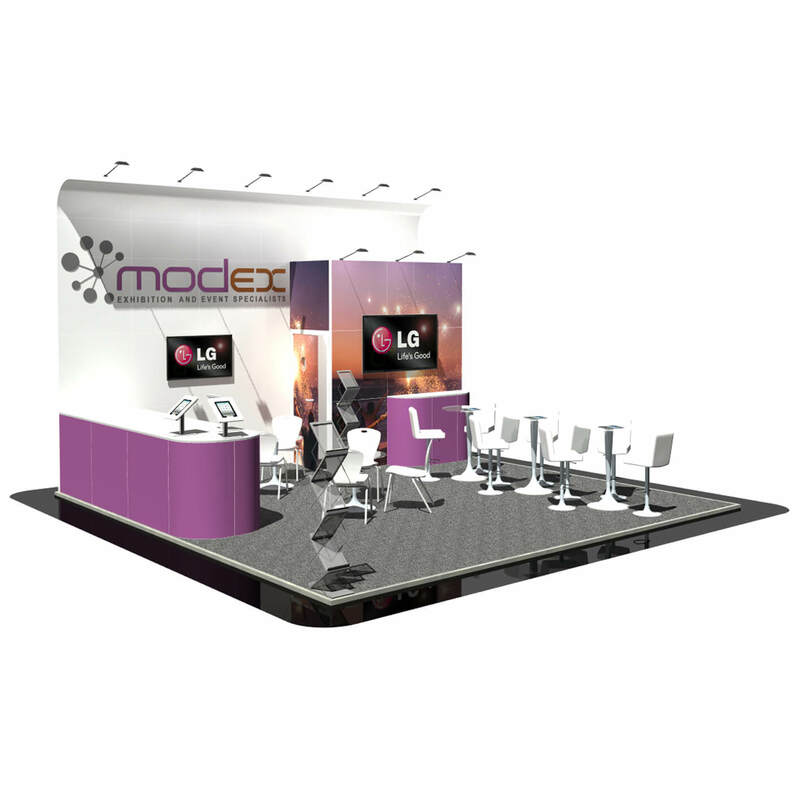 Seating for chats and a freestanding display unit to hold merchandise. 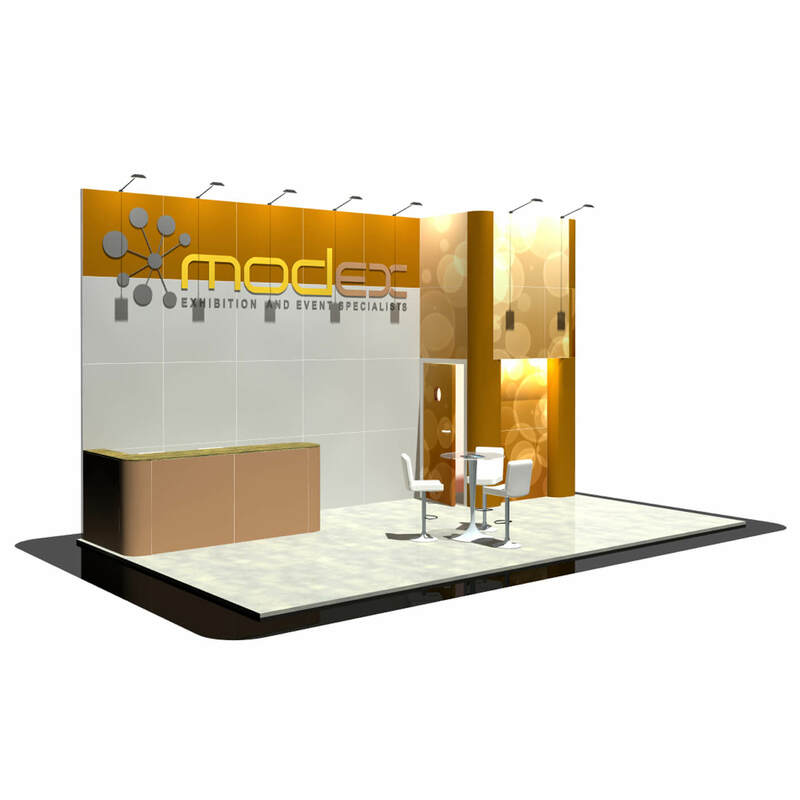 This design has 3 overhead LED lit corners including spot lights with counters and cupboards below. 1 display screen, ipad stand and a table and chair set complete the four by three stand. 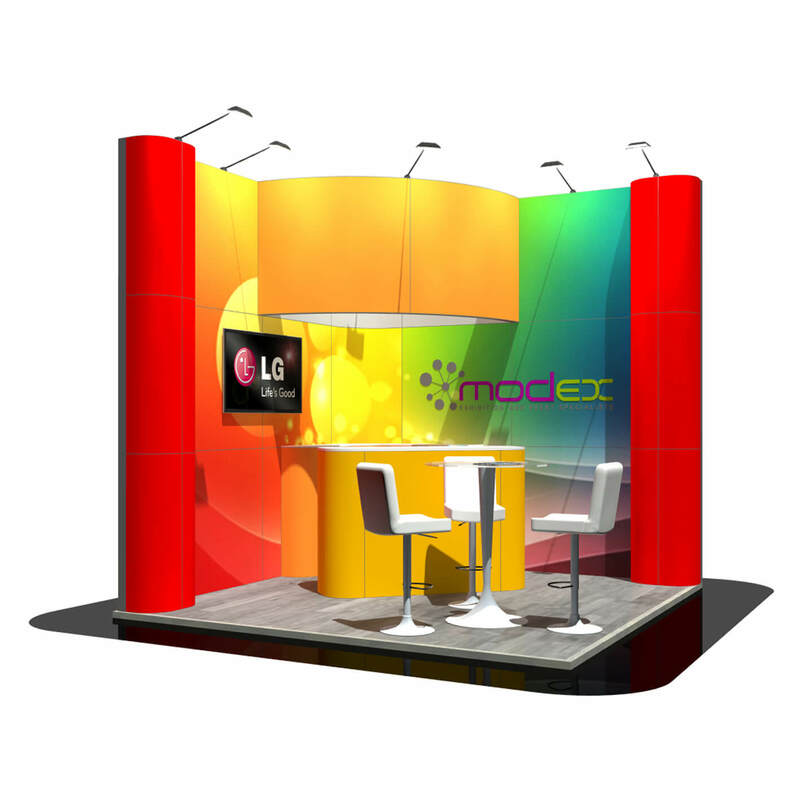 A 4 by 3, 3 sided exhibition stand featuring a curved header section with overhead LED lighting. 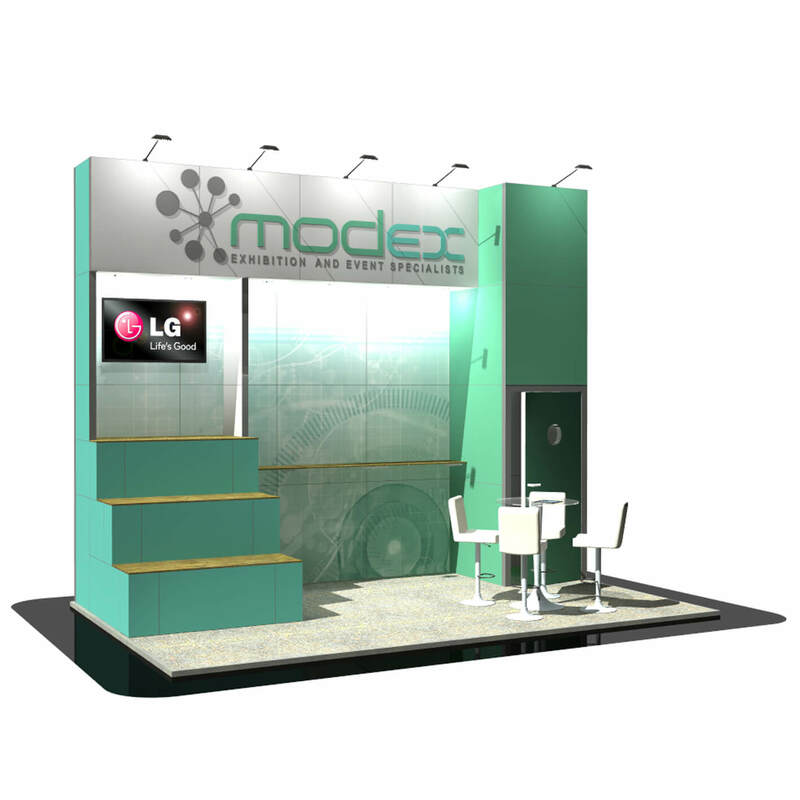 The backwall is ideal for brand promotion with a double cupboard for storage. 2 sets of table and chairs make this a perfect formal chat area. 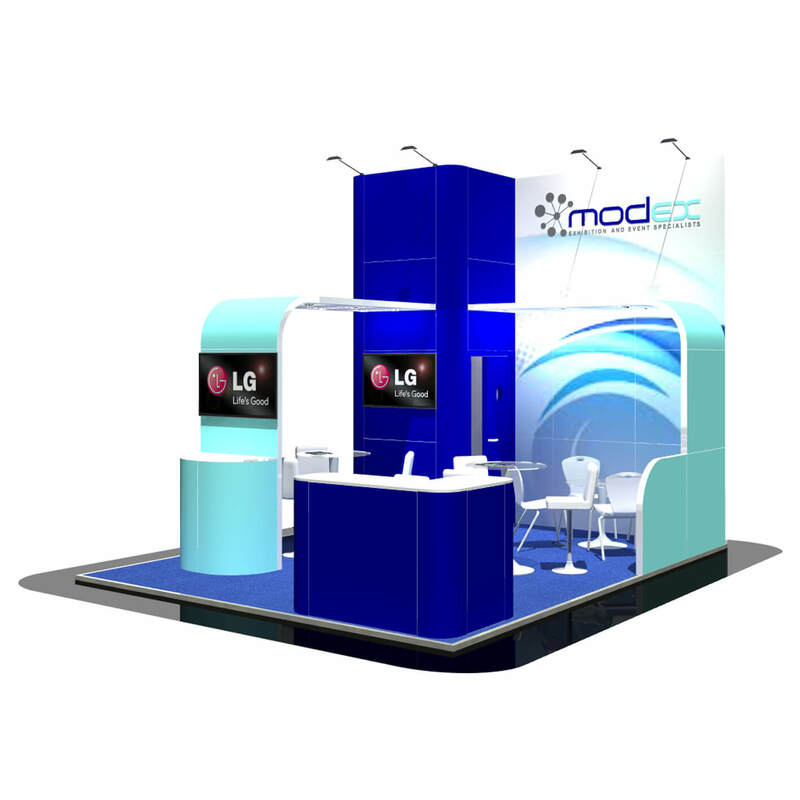 A 4×4 exhibition stand, designed with an overhead section placed in the corner including LED lit edge lighting. 4 overhead lit standing stations, freestanding literature racks and a corner counter with a lockable cupboard completes this striking stand. 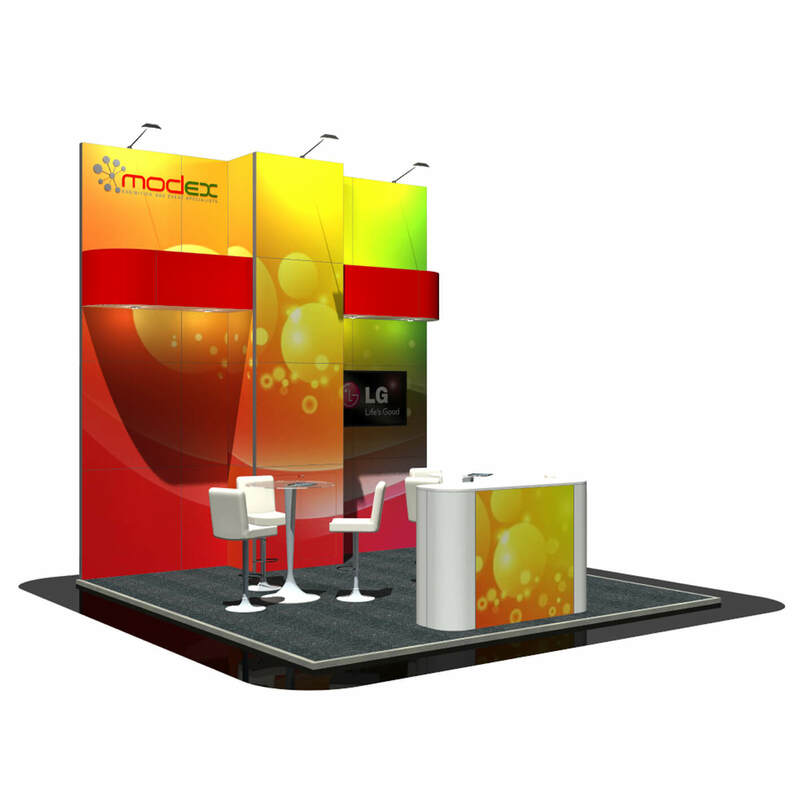 A four by four stand with a large wall to print graphics across leading to several shelves for displaying your products. 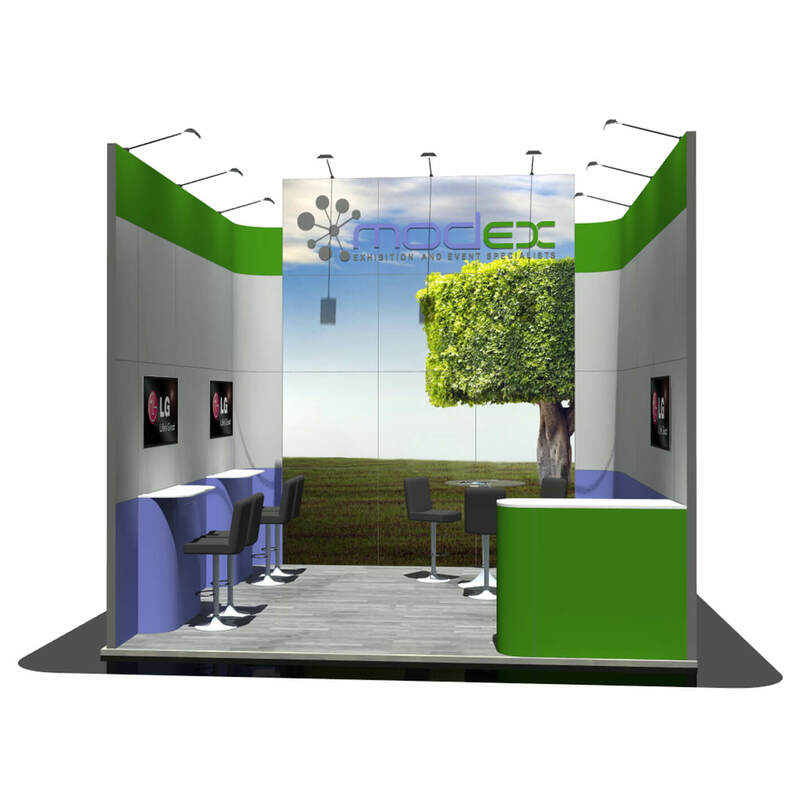 2 large cupboards with plenty of counter top space for promotional material. 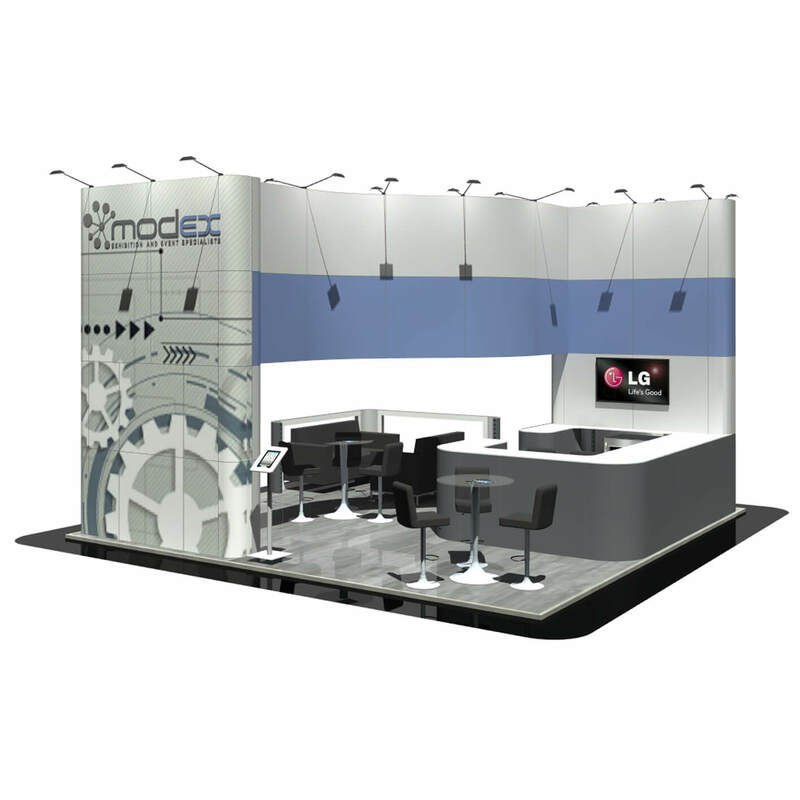 The centre part of the stand includes a table and chair set for networking. A 4 by 4 stand enclosed on three sides. Design to fit within shell scheme. 3 areas of seating and a front counter with locking cupboard. Add your graphics for added impact across the 3 walls. A 4×4 design including a ‘Bar Style’ counter on 1 wall with overhead LED lighting across the top. Additional spot lights illuminate the products displayed on the back wall shelving. Includes a table and chair set for formal chats. This four by four design has a protruding arch with underneath lighting and an added display screen. The main wall displays company branding with a continuous row of locking storage cupboards below. Also includes a ‘Breakfast Style’ counter with stools set into the corner. Standing at 4 metres high, prominent branding and overhead LED lighting. 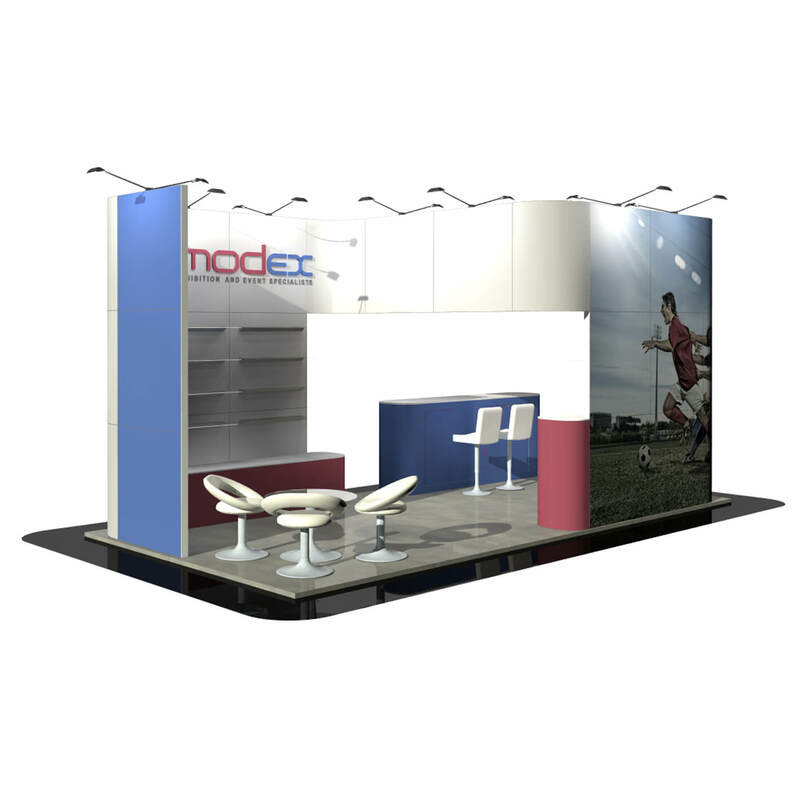 This 4×4 stand includes 2 areas of seating a front display counter and additional shelving for all of your promotional merchandise. 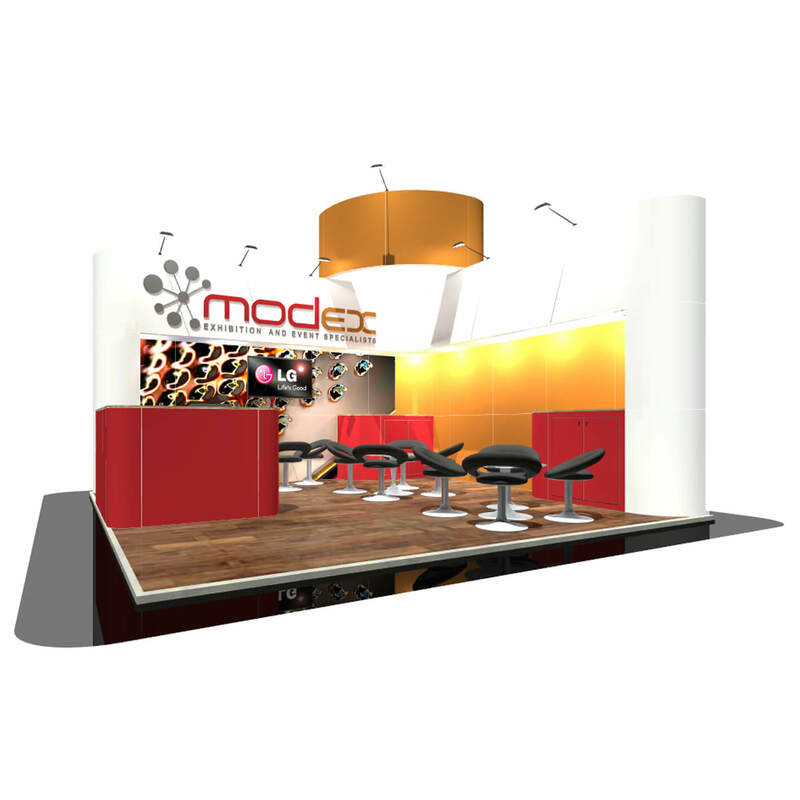 This five by two metre curved top design includes overhead lighting on the main promotional wall. Plenty of shelves to hold products and 2 storage cupboards complete this stand. 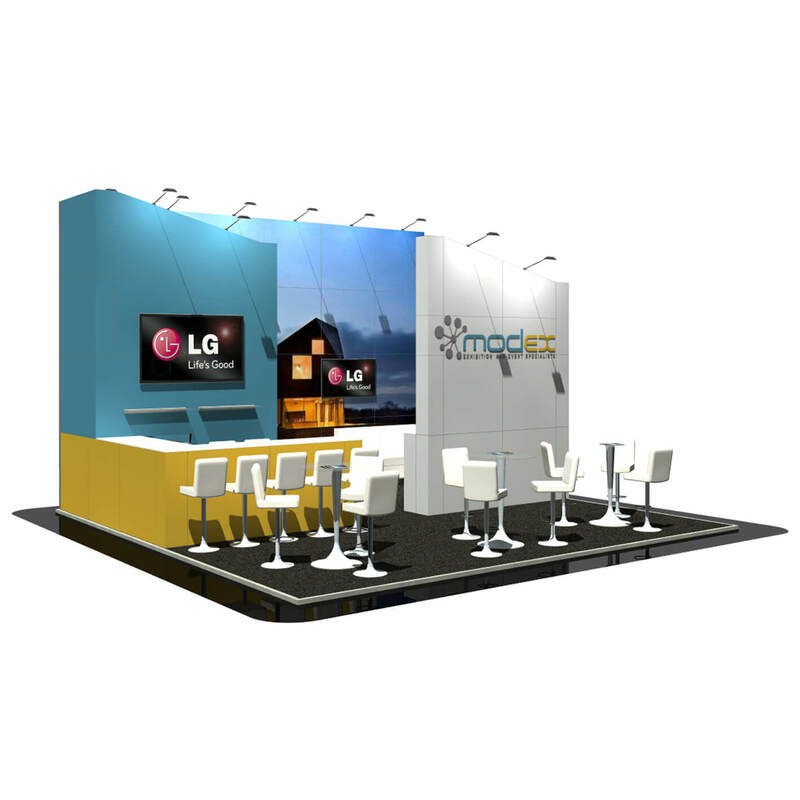 Island stand with branded middle plinth spanning from side to side – fully lit. 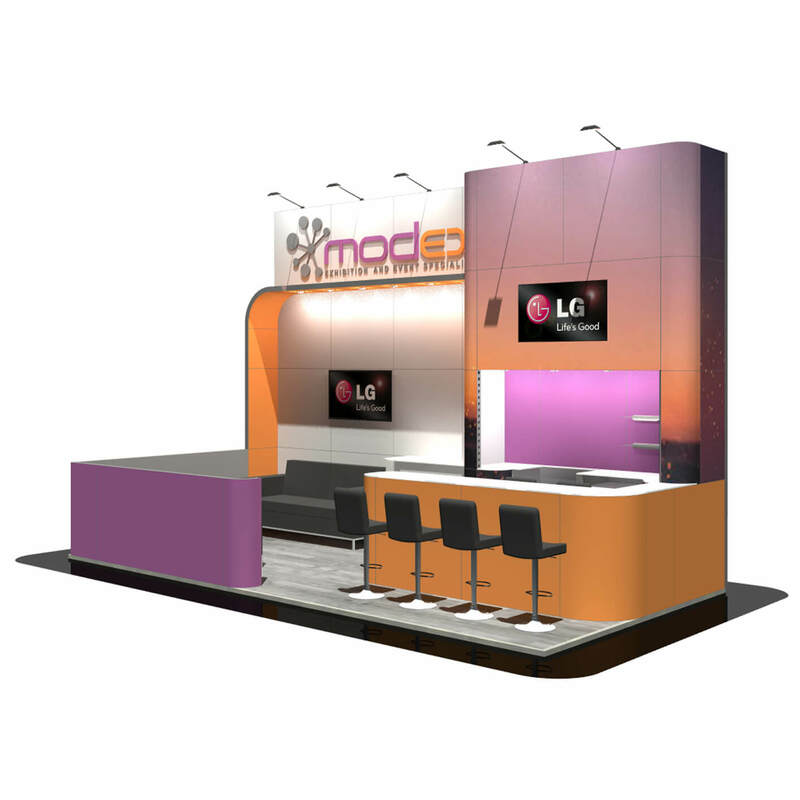 2 large counters on each side of this 5×2 metre stand to meet and greet clients. 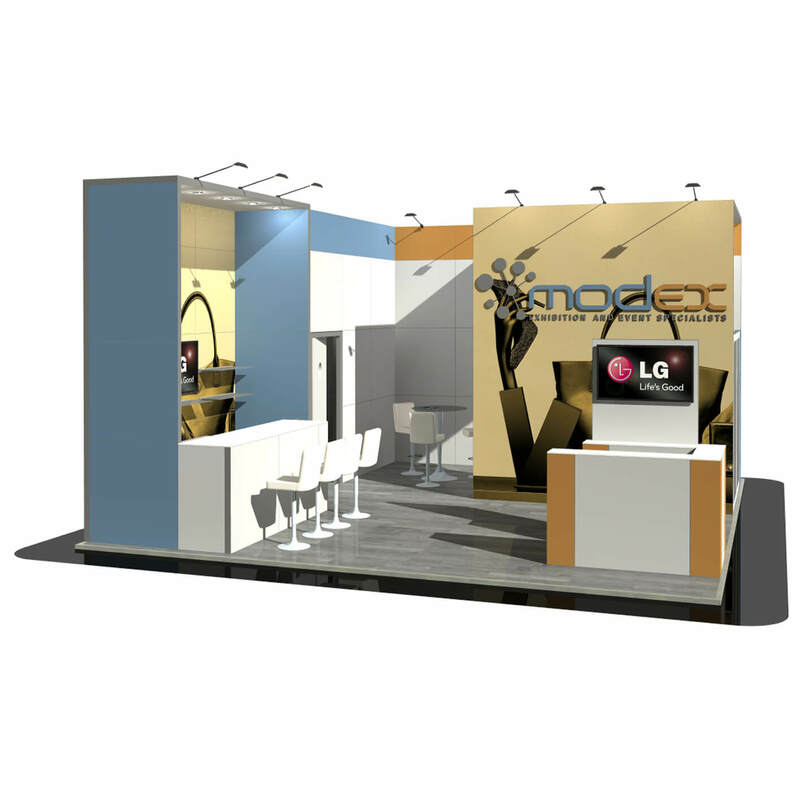 A five x two stand with a large branded area at the back, including a display screen and lockable cupboard below. 1 front counter and shelving provides a place for promotional products. With a 3metre overhanging LED lit back wall, there is plenty of room to add company branding in the space between the product shelves. The side walls include storage cupboards and help to enclose this 5 by 2 stand. 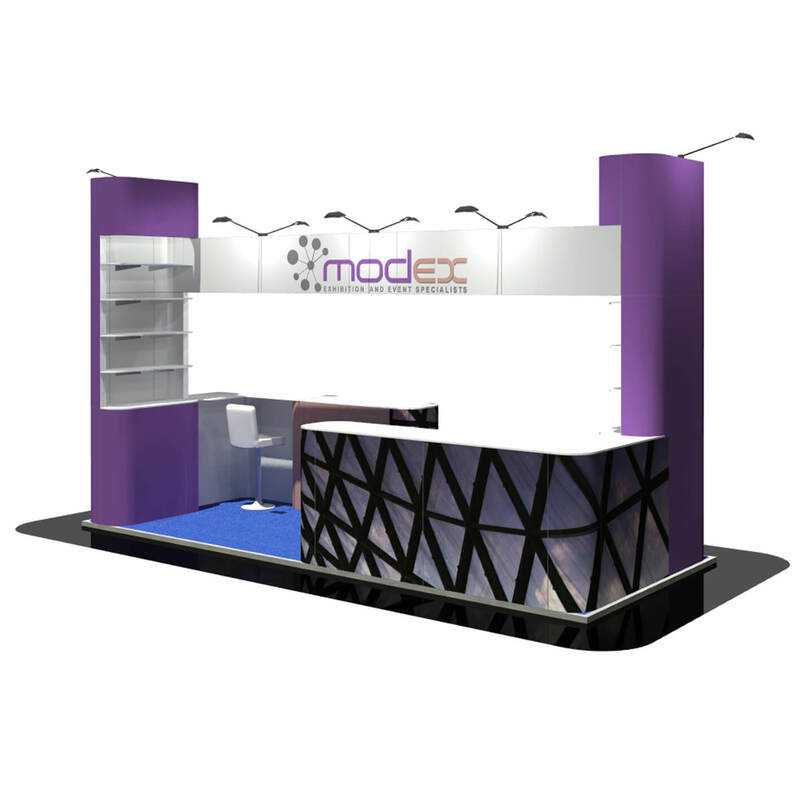 This 5 x 3 metre stand has an overhanging LED and spot lit branded header strip – connecting to a slim store room on the right and a 3 tiered display area on the left also includes Low level shelving and a meeting table. 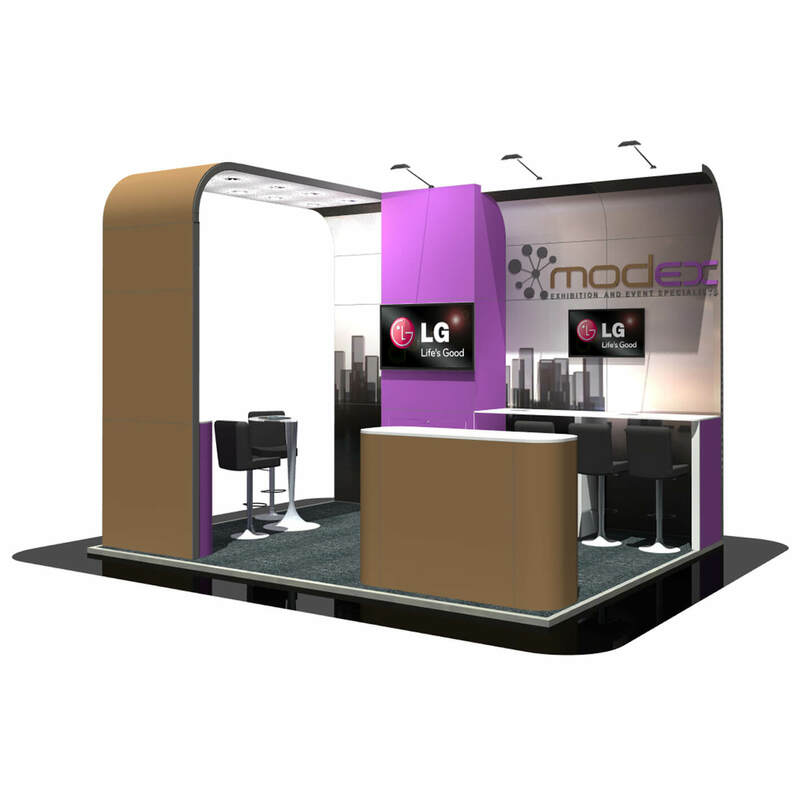 A five by three metre design with 2 angled walls – acting as screens to hide a store cupboard to the right and a drinks station on the left. 2 freestanding cupboards with counter tops and stools, glass table and chairs for customer networking. A 5 by 3 design with a large store room and freestanding locking cupboard. 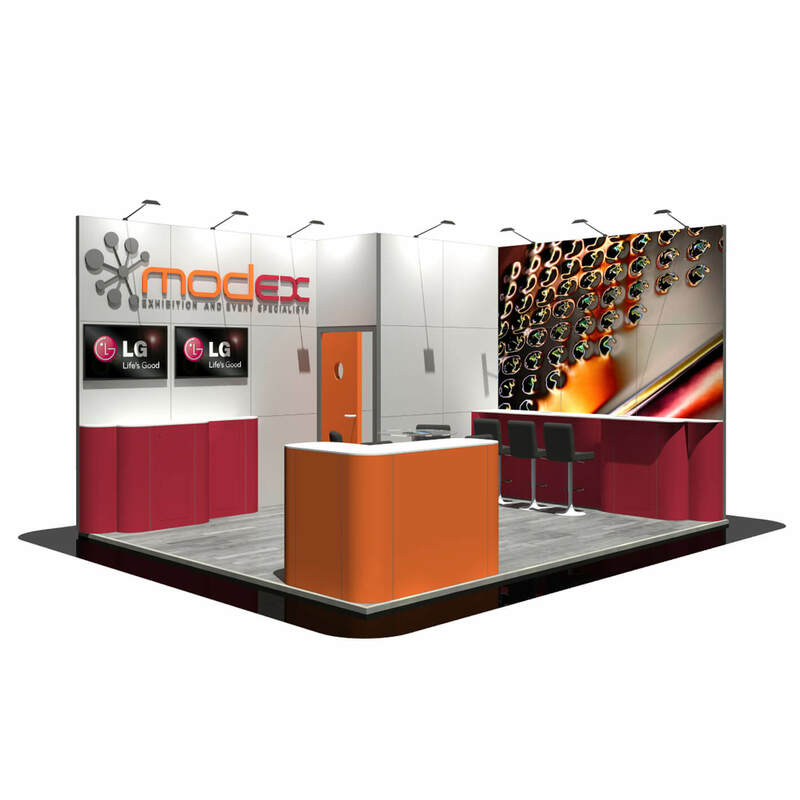 The main wall consists of a protruding wall incorporating a 2 metre video wall and company branding for the ultimate look to your stand. Complete with overhead LED lighting and glass meeting table. 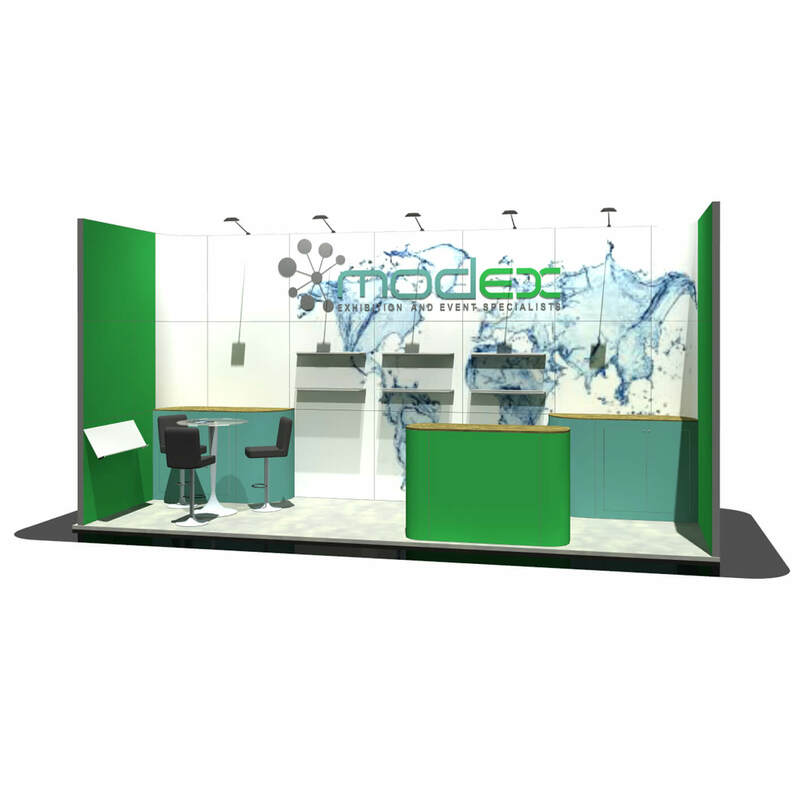 A 3 walled five x three metre stand including 2 lockable cupboards and a fridge located near a drinks station. Low level seating for a relaxed chat. Display screens for advertising your company. 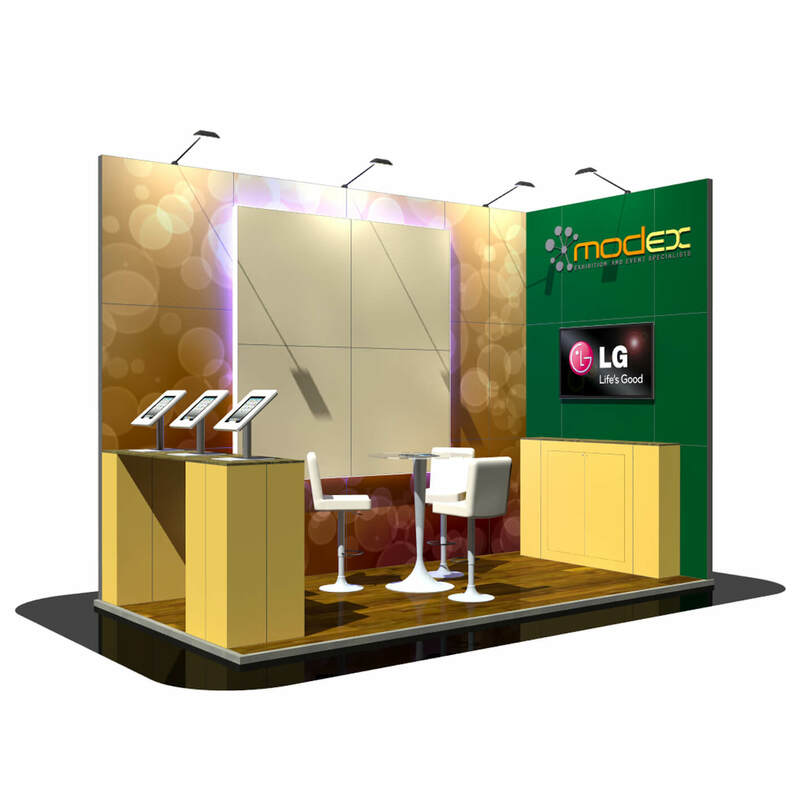 5×3 designed stand with 2 protruding arches incorporating LED lit display cabinets. 2 glass table and chair sets for meeting with potential clients. 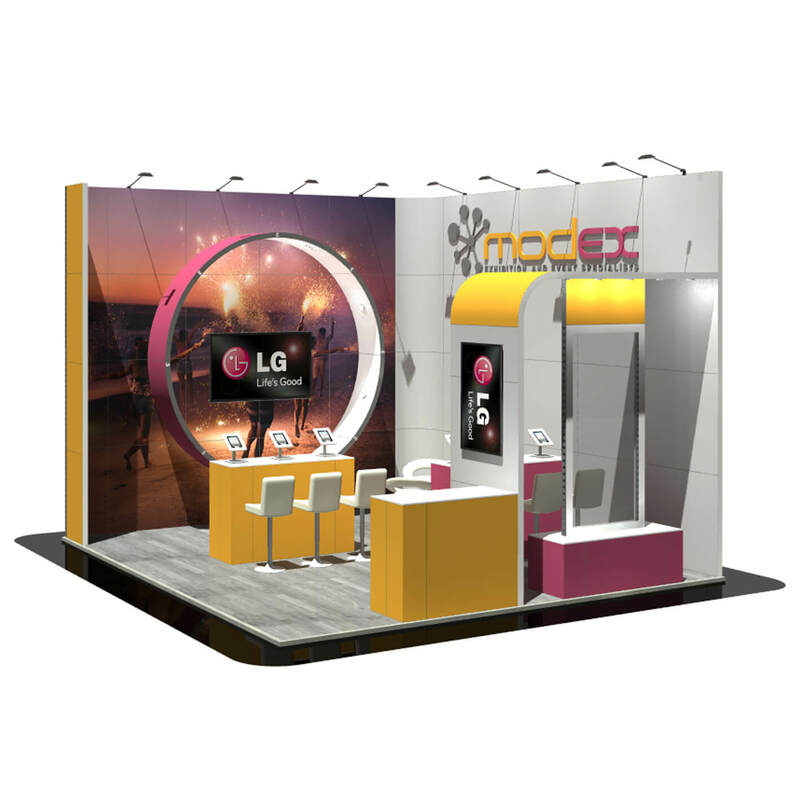 This five x three design standing at 4 metres high, prominent branding fully lit with overhead LED lighting. 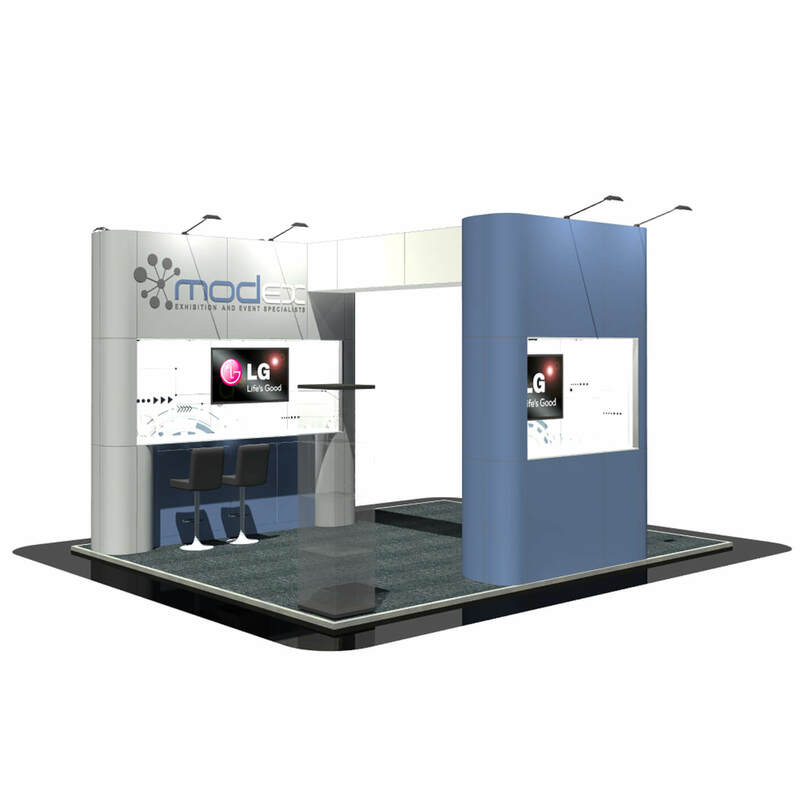 By including your own graphics across the 2 walls, you will certainly make an impact at any show. 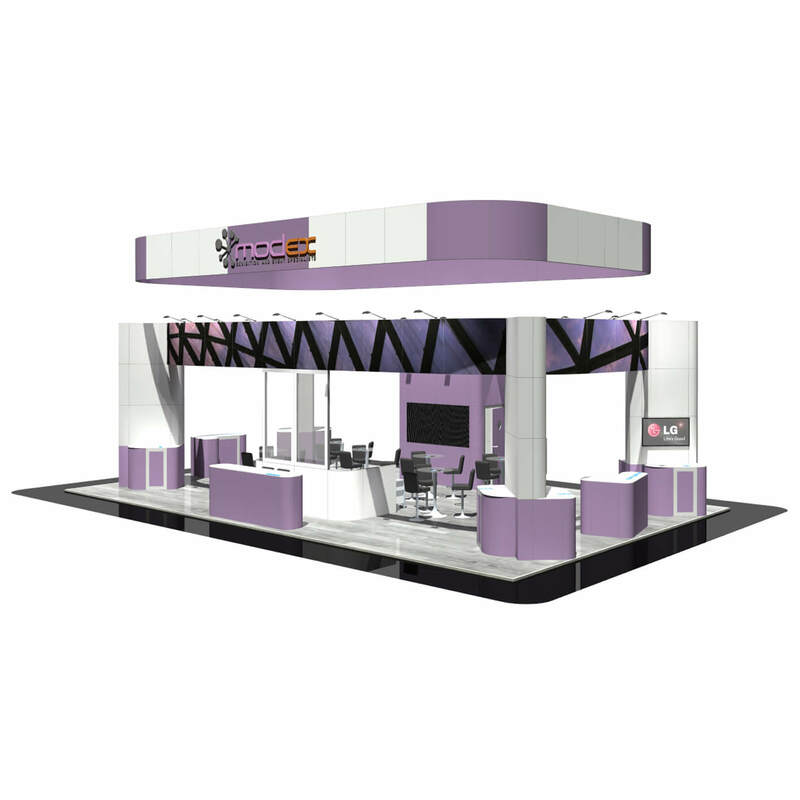 With extended counters at the front, low level seating for more formal chats and a display screen for advertising. 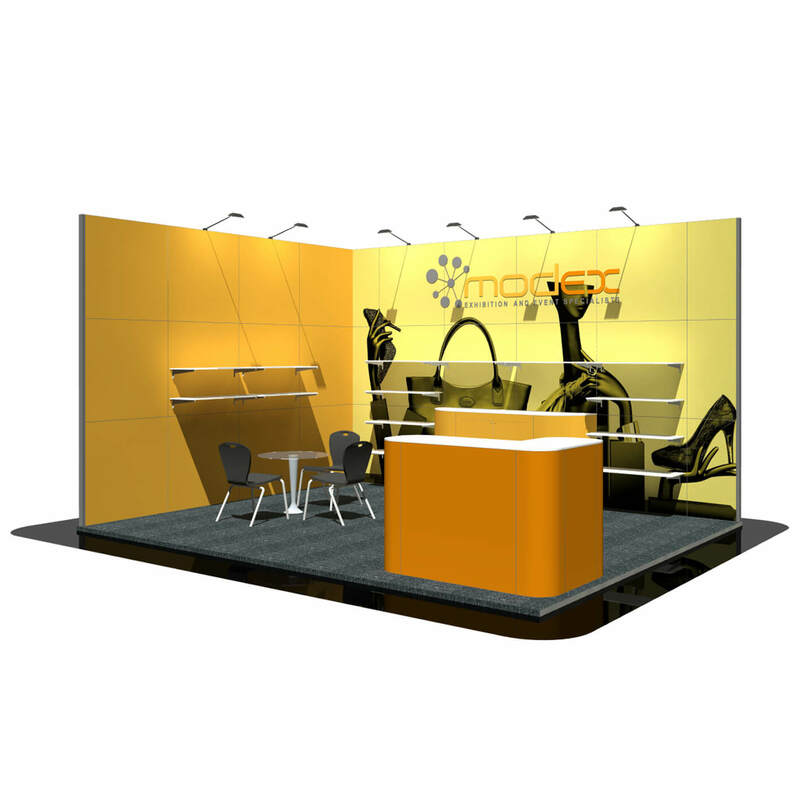 A 5×3 designed stand with display shelving and a double storage cupboard set along the main wall. A freestanding lockable cupboard to the front with a central meeting table. 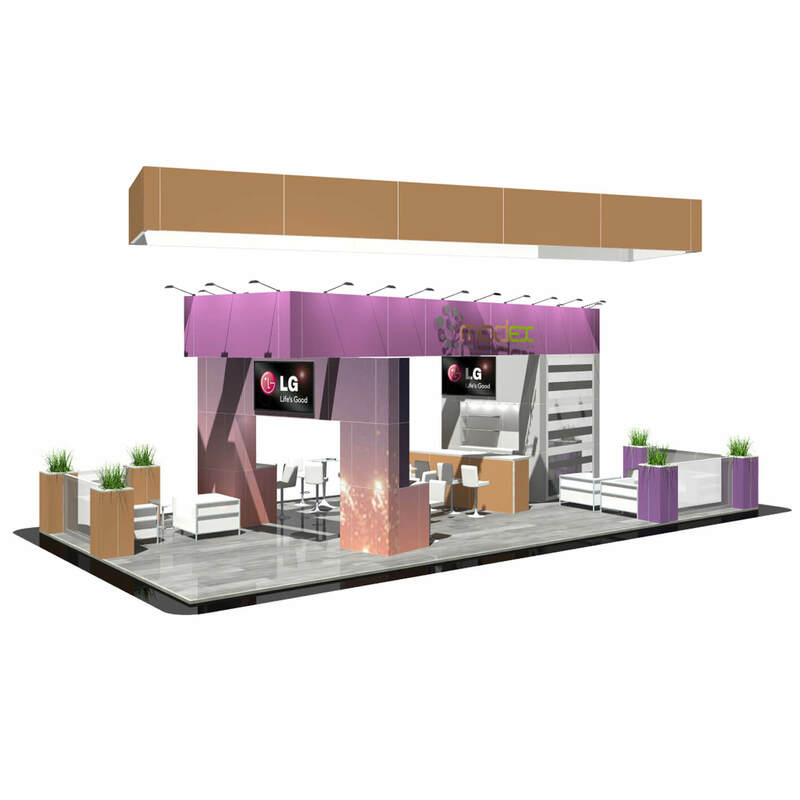 Five by three design with overhead LED lighting, extending arch including spot lights, counter and display screen. A curved counter sits neatly in the corner along with stools to meet and greet clients. 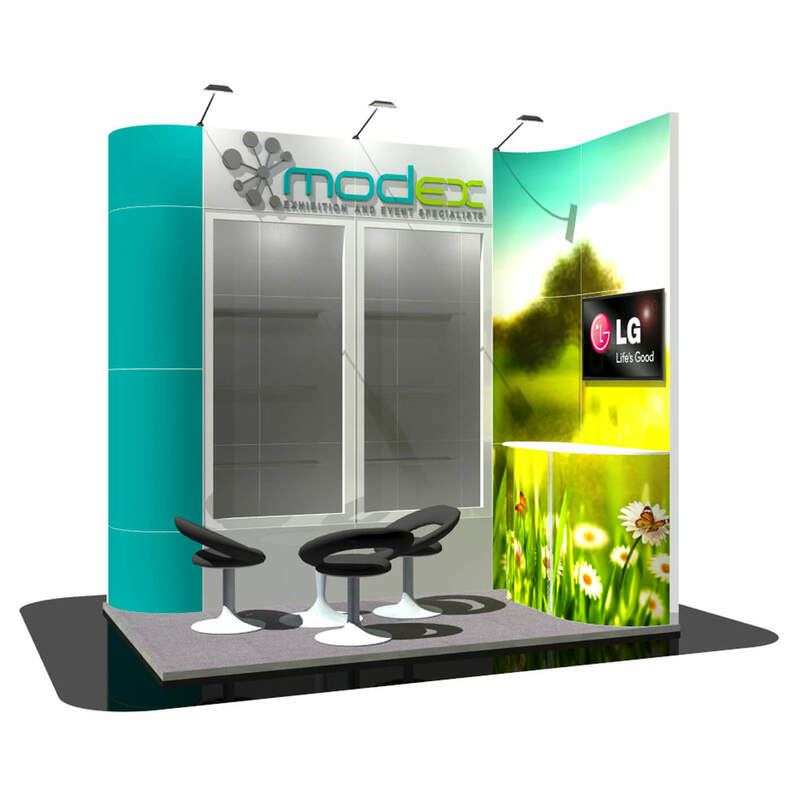 Freestanding literature rack for all your product brochures and a table and chair set for networking. 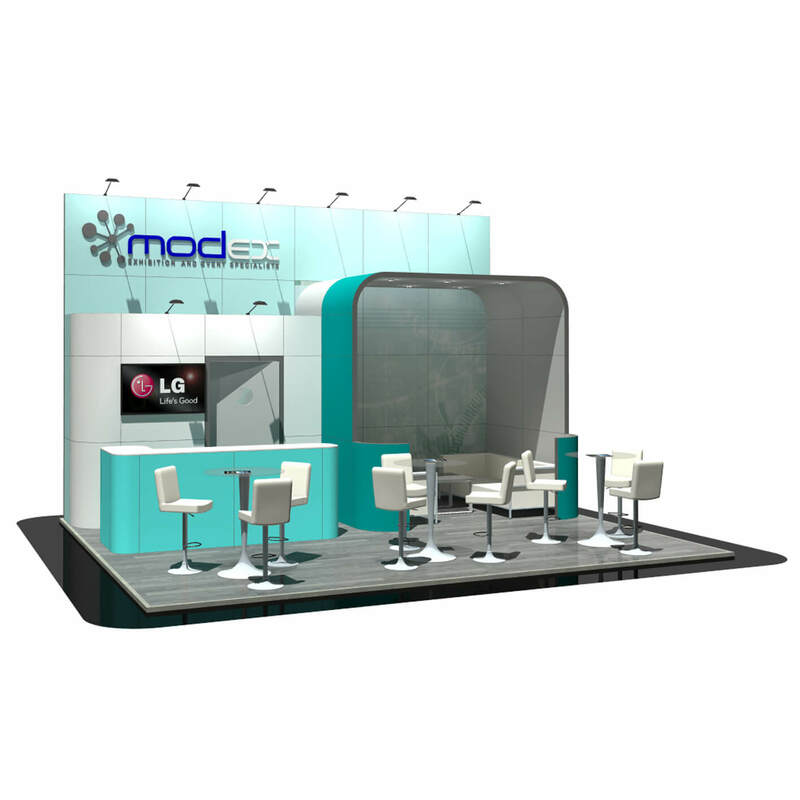 5 by 3 design with angled side walls creating a semi private stand. A large lockable cupboard sits centrally on the back wall with display screen above and overhead LED lighting. 2 counters with lockable cupboards sit at the front of the stand for interacting with passers-by. 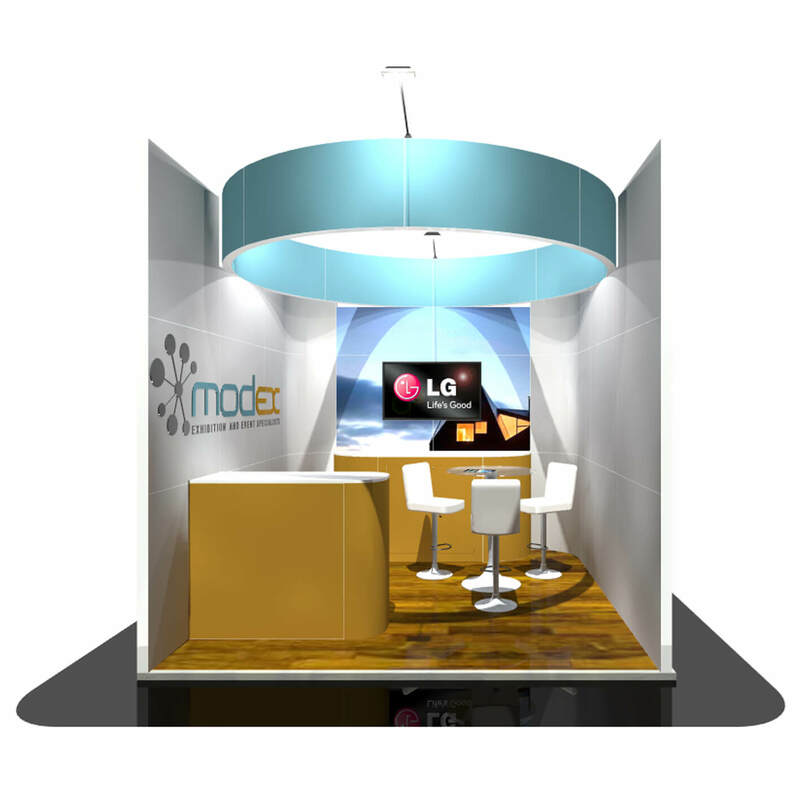 This bar styled enclosed 5 x 3 design has a protruding overhead and under lit header section. Adequate shelving and lockable cupboards for all excess stock along with under counter fridges. 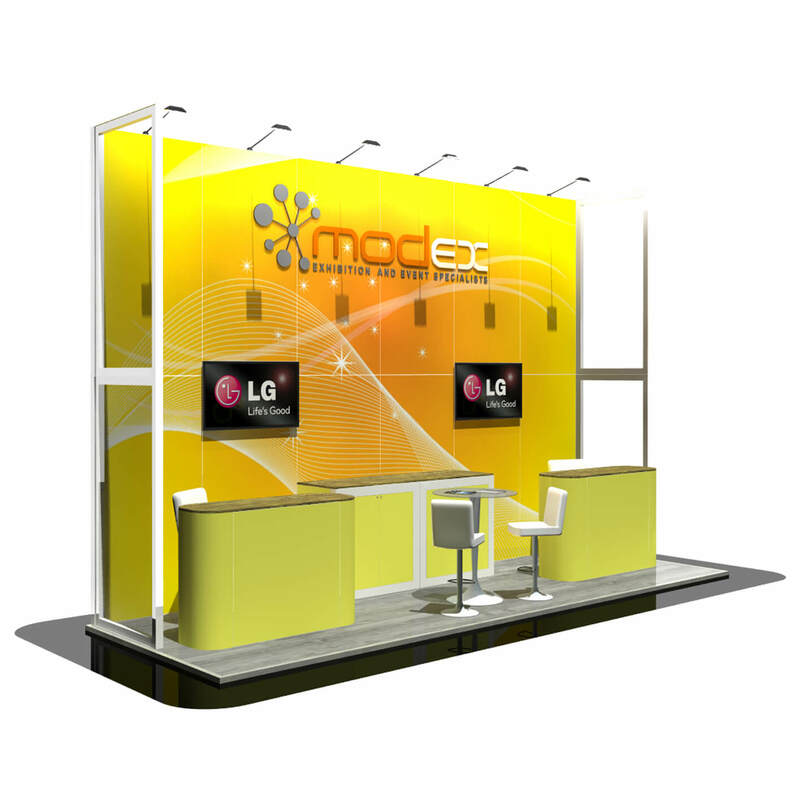 The display screen provides an advertising platform. 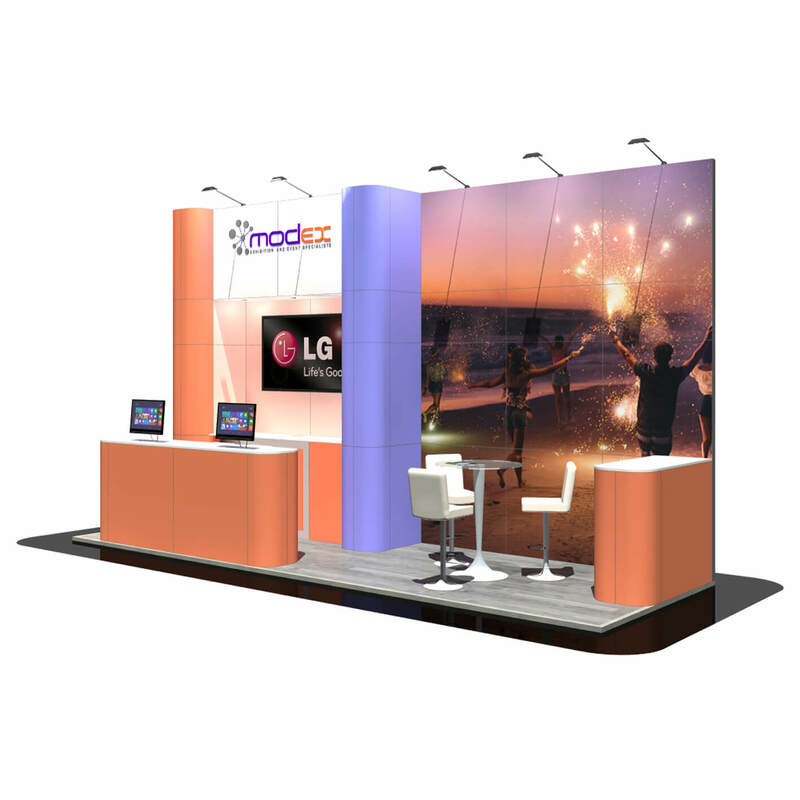 A five x three designed stand with overhead branded ring section, fully lit with LED lighting. 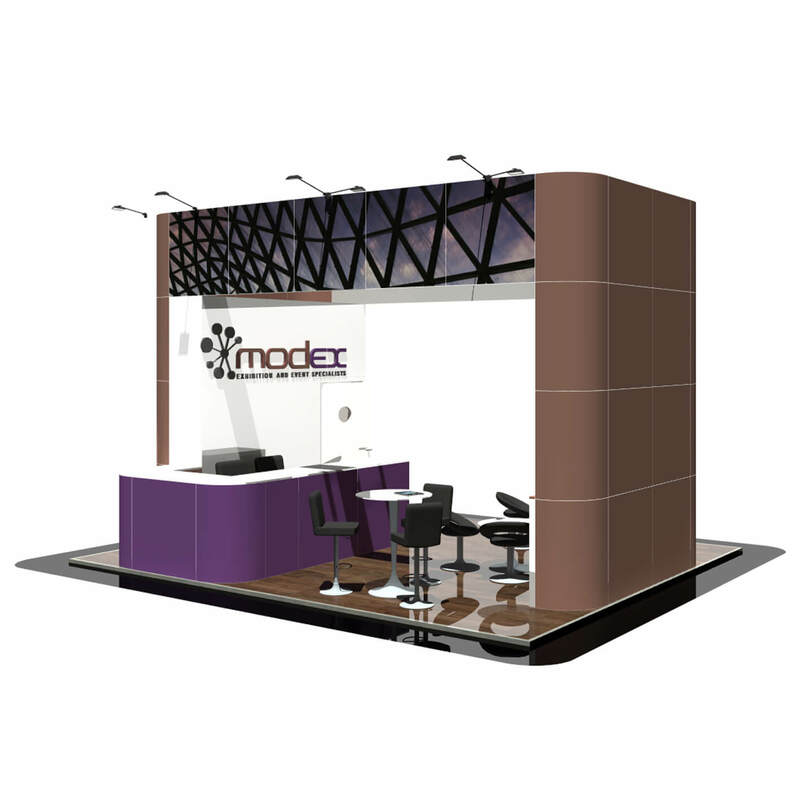 The display cabinet at the front provides extra stability to the stand which also incorporates spotlights for illuminating products. 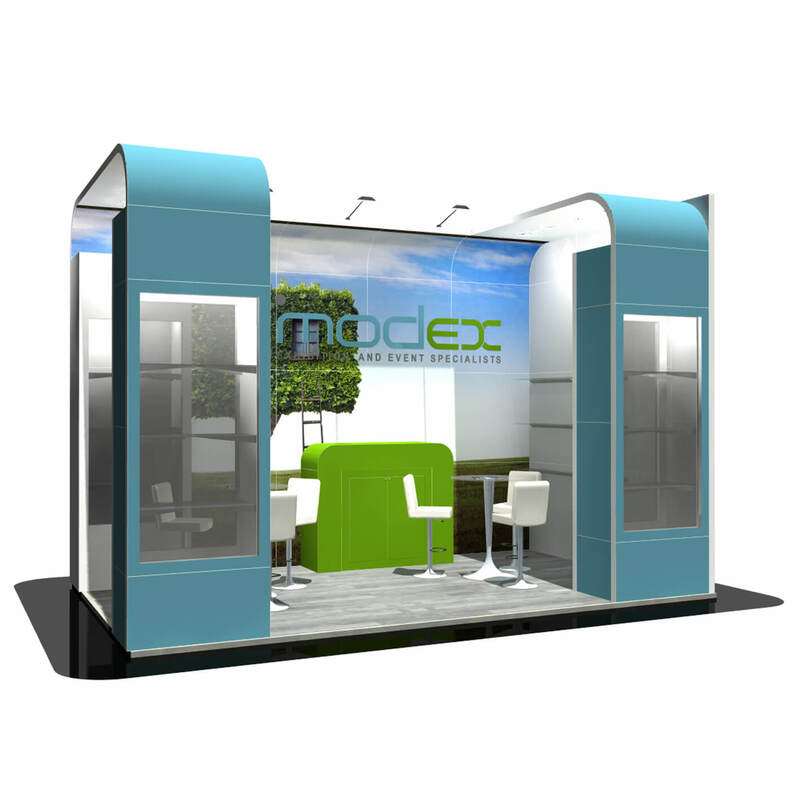 2 large lockable cupboards and 3 meeting tables complete this almost fully enclosed stand. 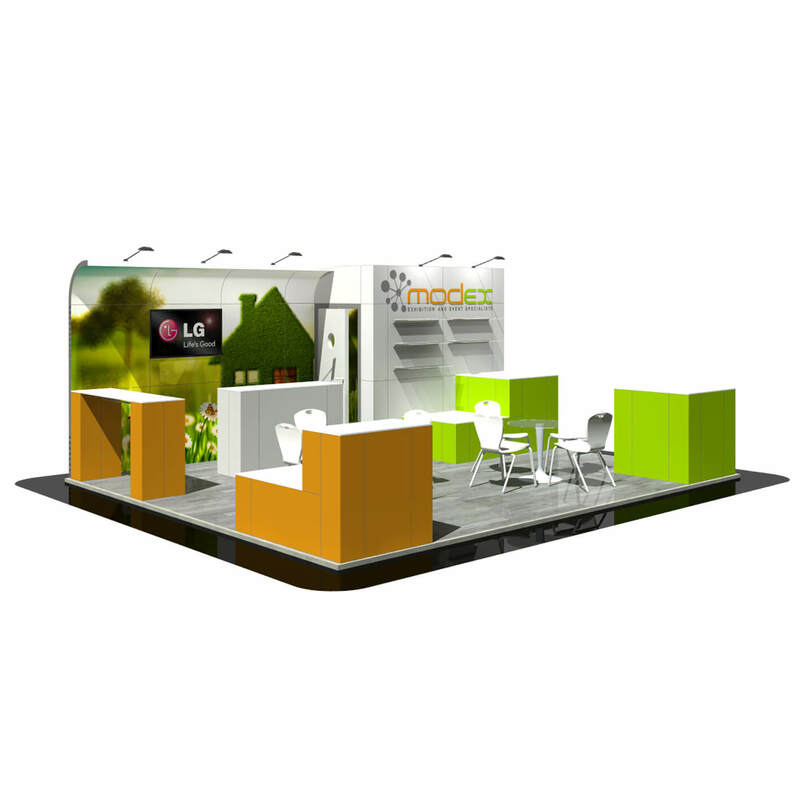 This 5 by 3 design has a lockable store room and large storage cupboard all set at the back of the stand. All fully lit with an overhead LED header section with acrylic panel to the right. Also includes a freestanding display cabinet, meeting table and chairs and 2 lockable front counters to interact with passers-by. 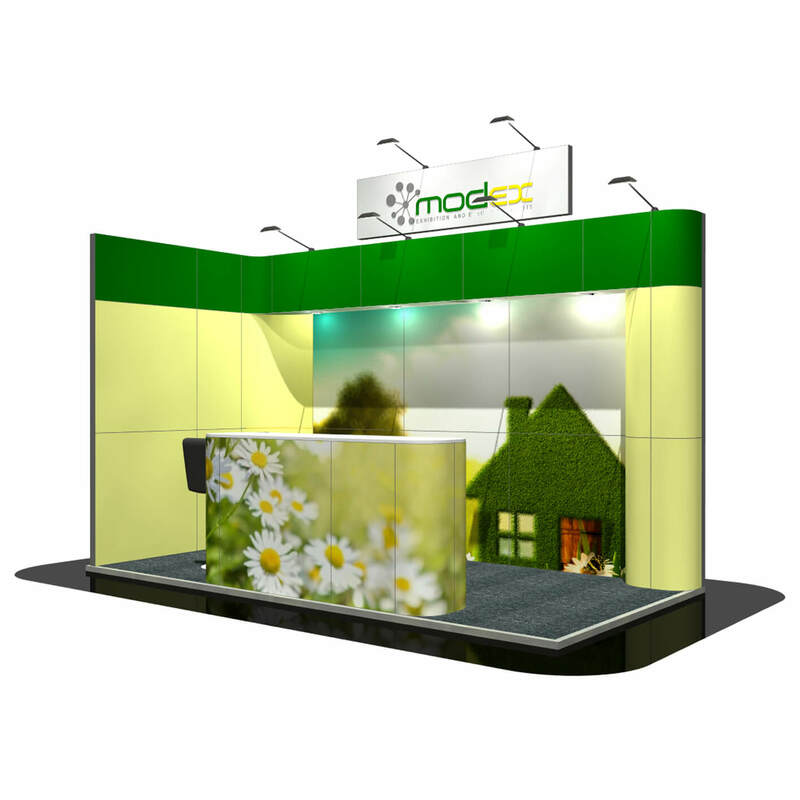 With a neatly positioned store room set into the corner, four lockable cupboards, 2 display screens and 1 table and chair set, this five by four metre stand has a relaxed open feel to any exhibition. Complete with overhead LED lighting. 5×4 design with overhead LED lighting and a neatly positioned store cupboard set into the corner. 2 curved counters positioned at both corners of the stand and large lockable cupboard at the front to interact with passers-by. 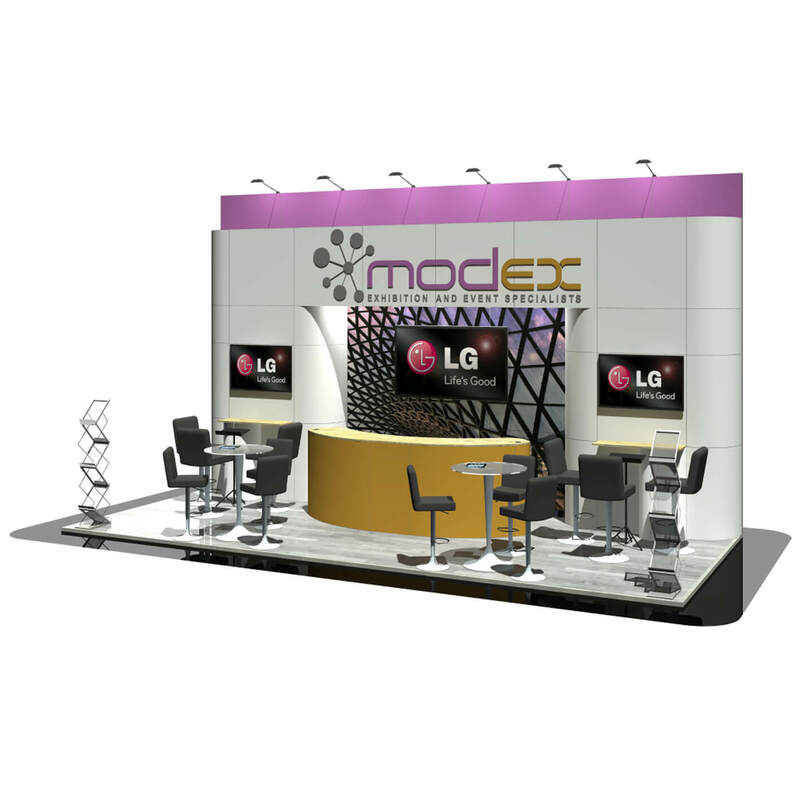 A central table and chair set with 2 display screens complete this stand. 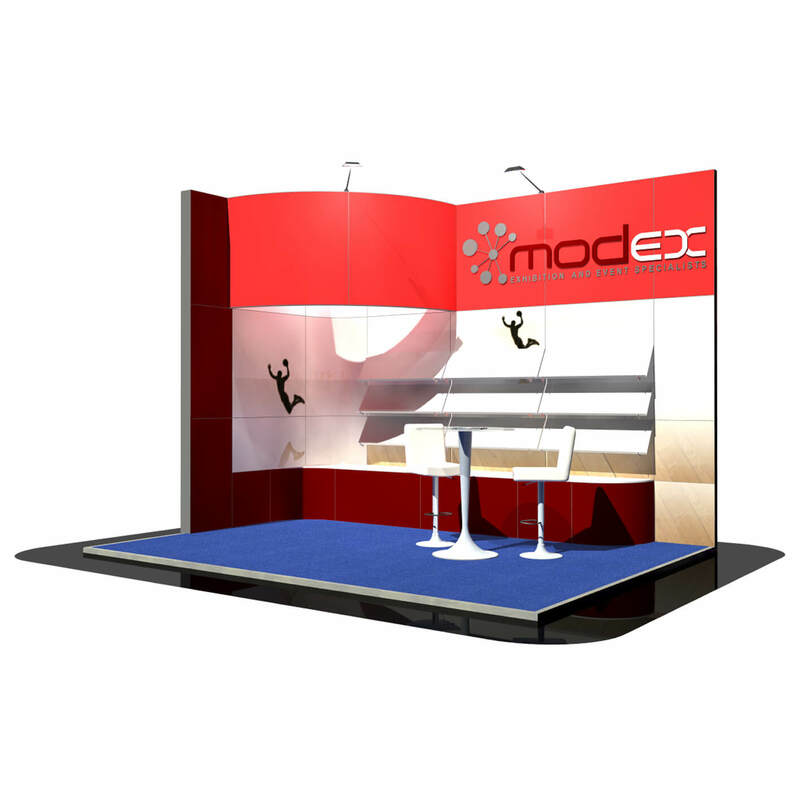 This 12 x 8 stand utilises its space with various seating areas, a fully lit overhead banner and a separate meeting room. A bold twelve by six stand with a diagonal criss-cross design. 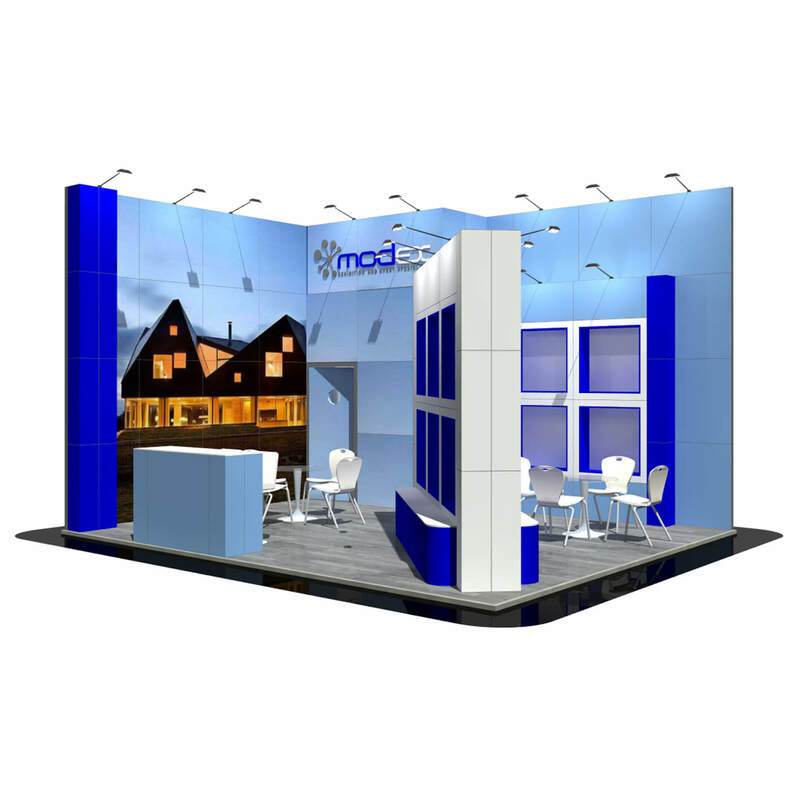 With a hanging banner, acrylic transparent panels and many separate meeting areas for customer engagement. 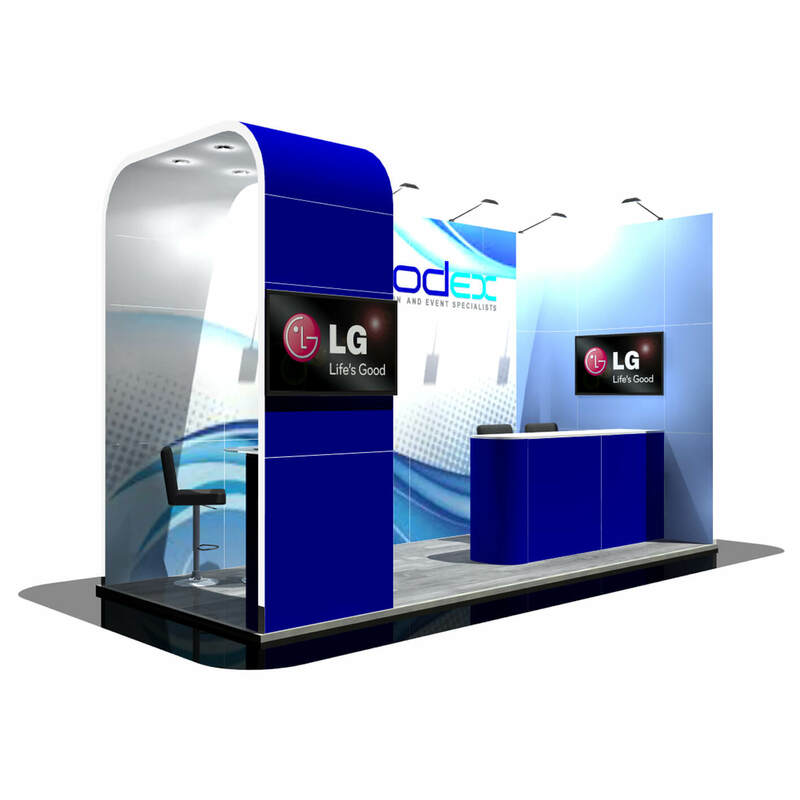 This large and segmented 8 x 7 stand allows for a lot of product showcasing and areas to interact and engage with customers. 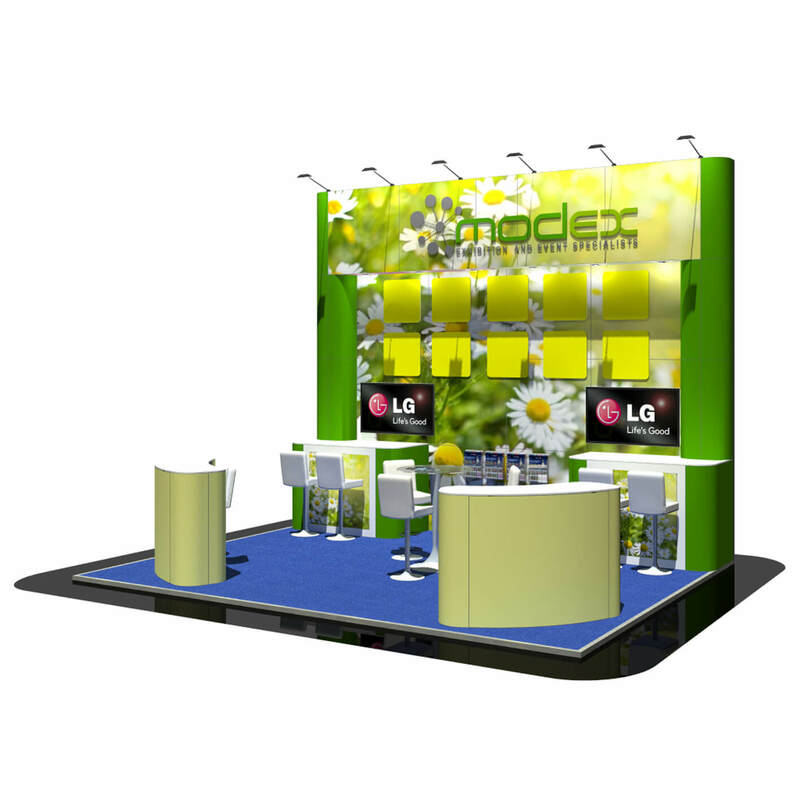 Spotlights and an LED video wall ensure this 8 x 6 stand will catch any passer-by’s eye and be welcomed onto the stand. 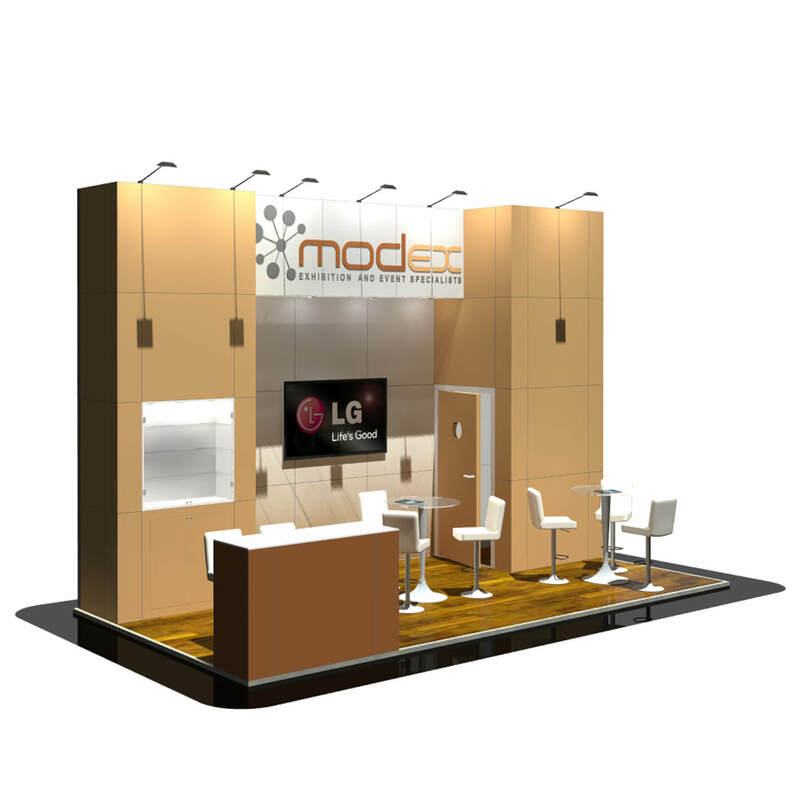 An eight by six island stand fully designed with customer interaction in mind and a huge bar for entertaining clients. Strike up a conversation and show off your business from all angles. 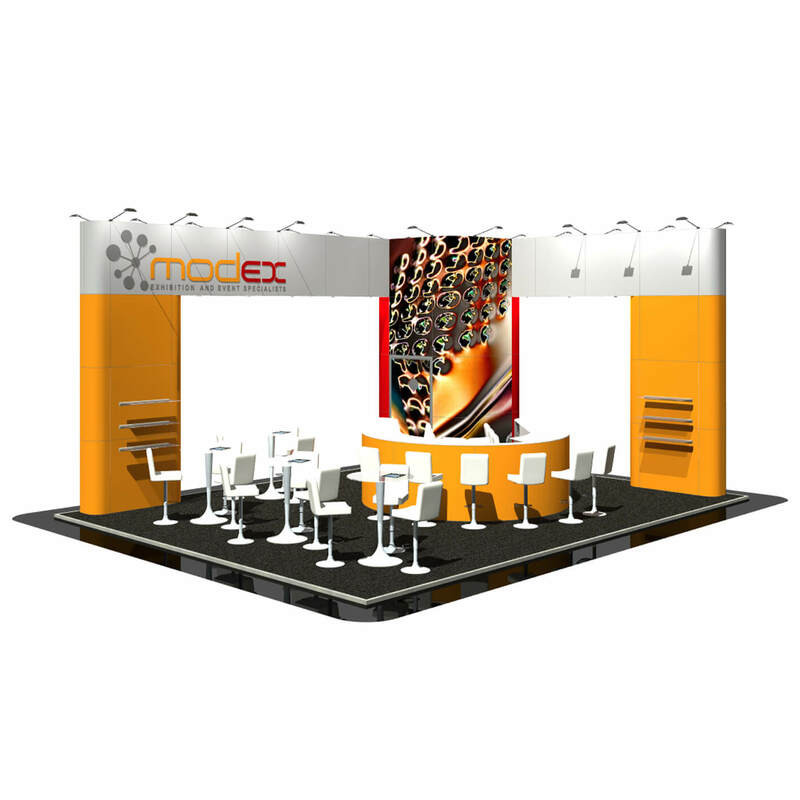 With storage space, spotlights, shelves and multiple seating areas, this 8 x 5 stand utilises many different features for maximum impact. 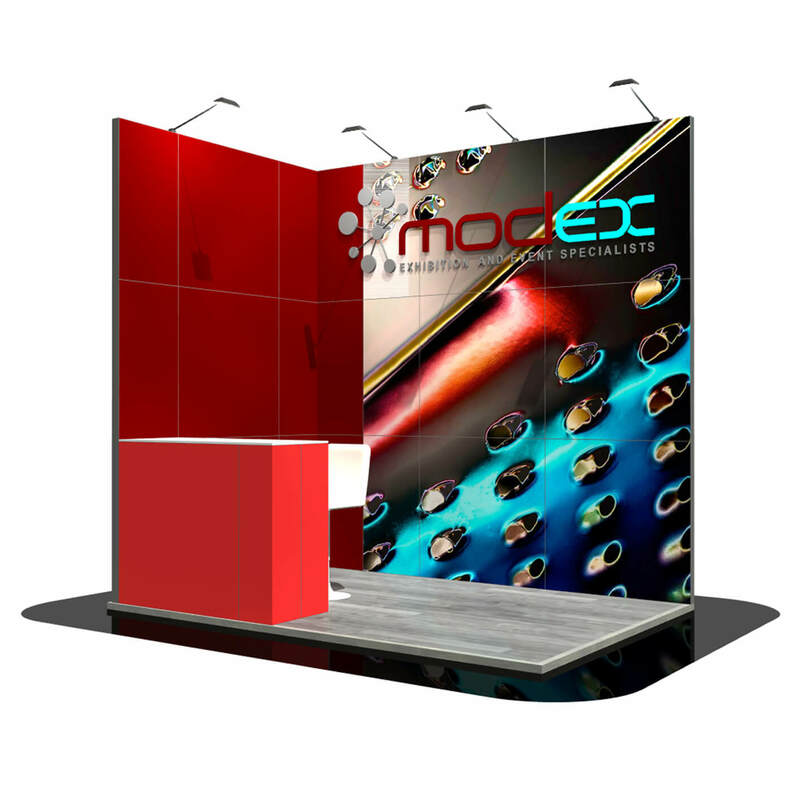 Dedicated to customer interaction and product showcase, this 8 x 4 stand lets the graphics do the talking and welcomes and passer-by on for a conversation at the large bar. 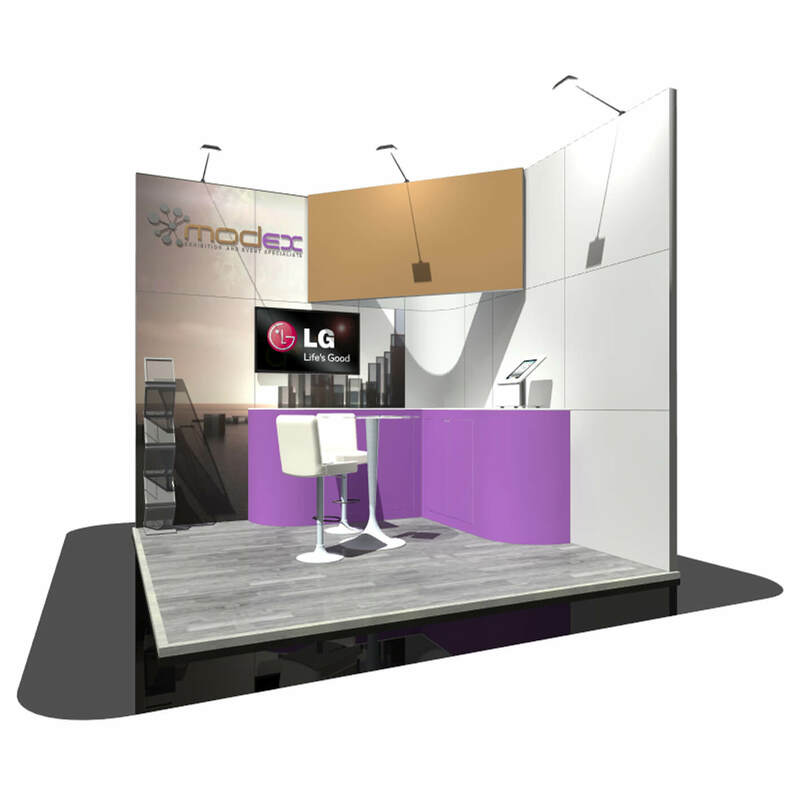 This unique 8 x 3 island design stand focuses on utilising the narrow space for engaging with customers from all angles whilst also having a lockable storage area and a large header section to stand out. 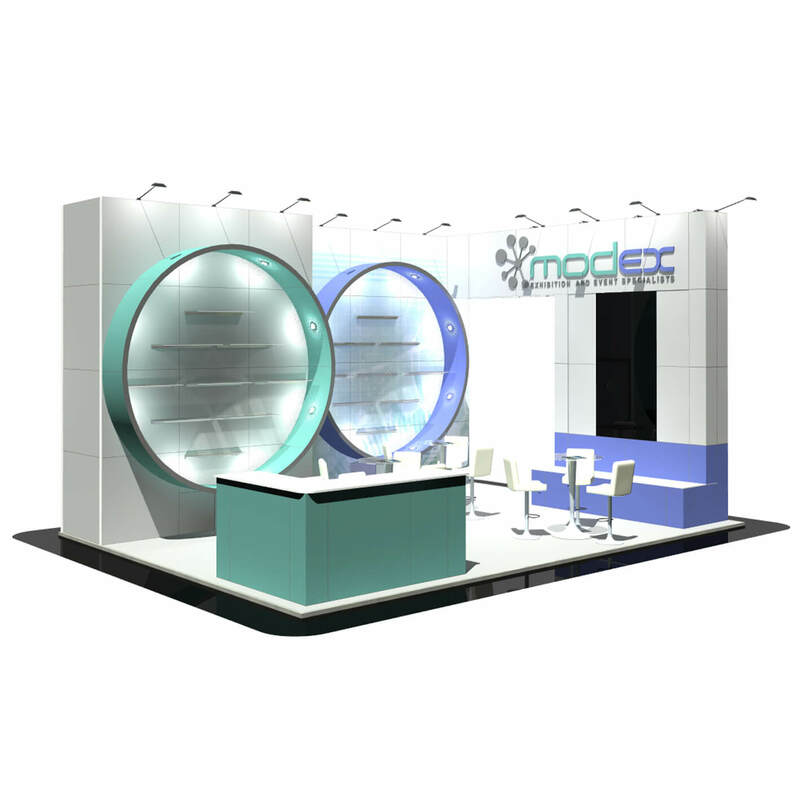 The two circular spotlighted wall features bring this 7 x 5 stand to life and enables stunning product showcasing. Additionally, it has the space to meet and converse and a LED video wall to wow the passer-by. 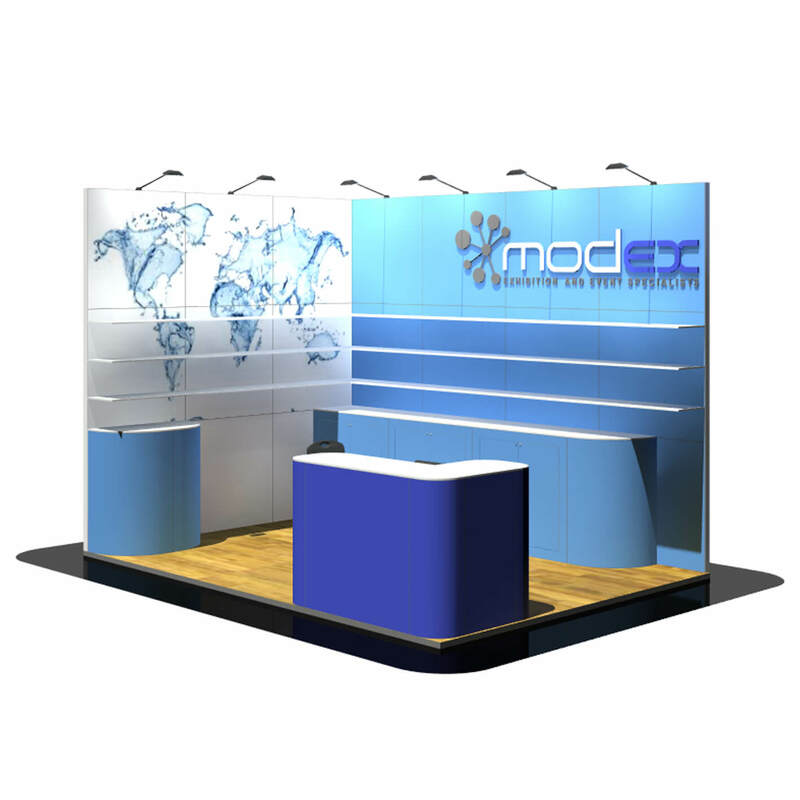 This simple but effective 7 by 4 stand opens itself to the show floor and invites customers on letting the graphics do the talking. 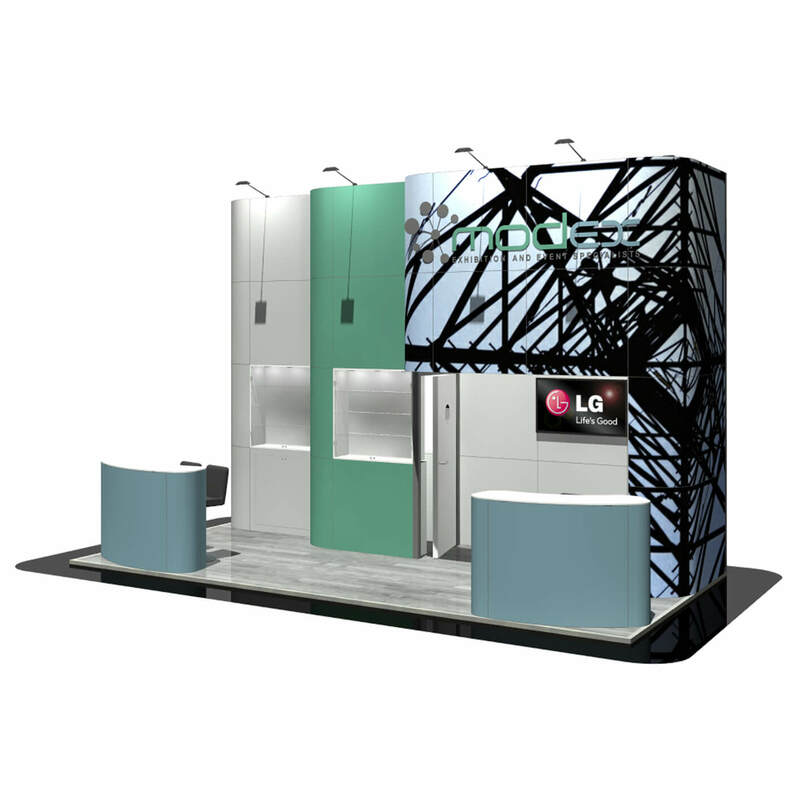 Give it the personal touch with this segmented 7 x 4 stand including a separate lockable storage room and a design that helps your company make a visual impact. 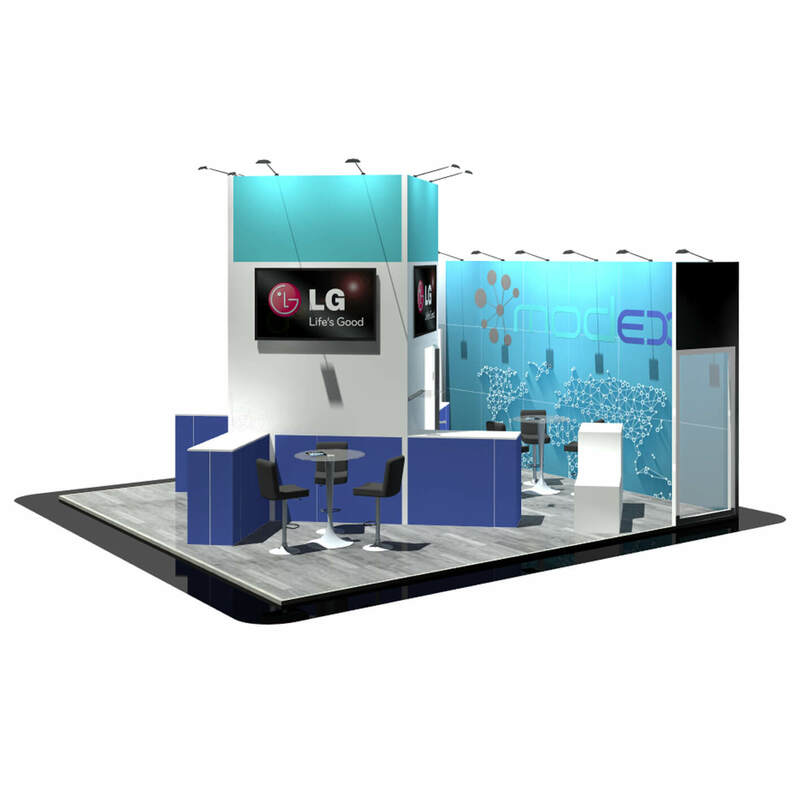 This large and open seven by three stand utilises its graphics, spotlights, central countertop and AV to invite customers onto the stand. 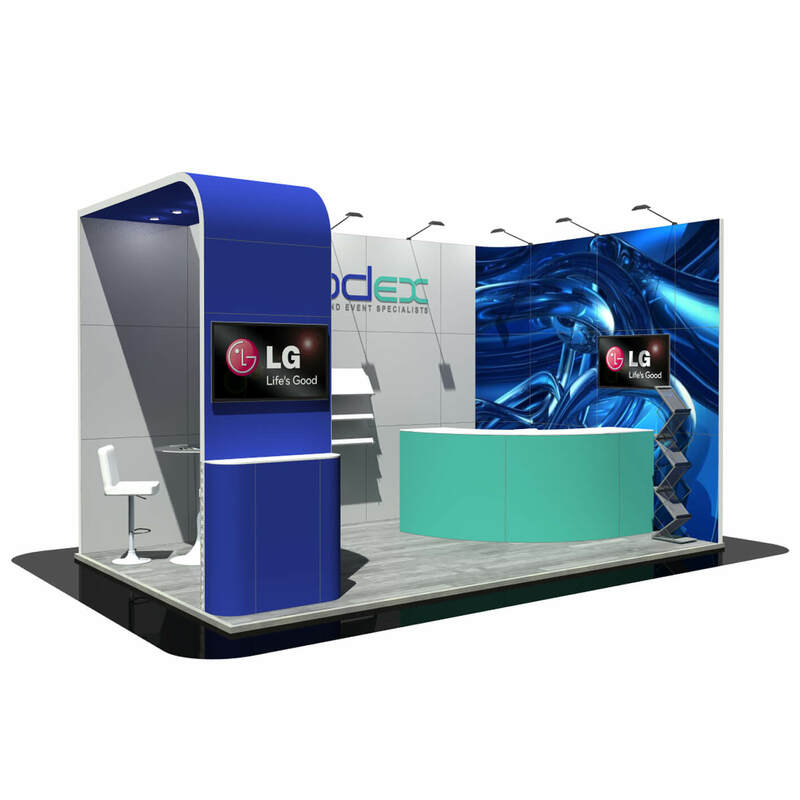 Utilising the narrow space, this 7 x 2 stand uses its raised well-lit header section, three separated pods and seating areas to welcome customers to the stand. 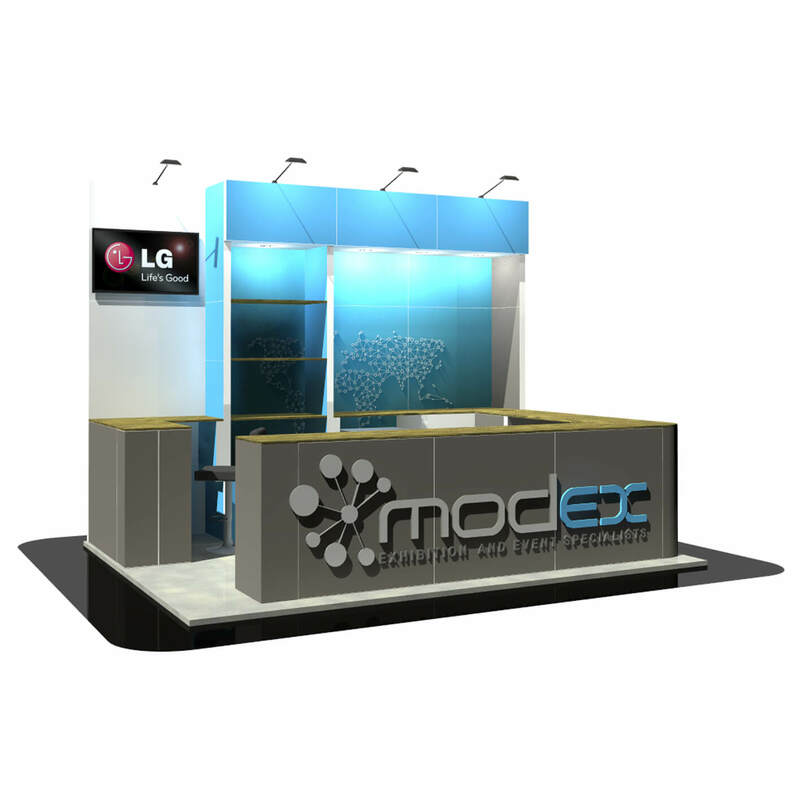 Whether you want to show off your products by the LED video wall or discuss business in more detail under the spotlighted roof section, this 6 x 6 stand has it all to provoke interest in new clients. Make those all-important conversations with customers and the space to do so with this open and effective six by six stand even with iPad stands for further business engagement. 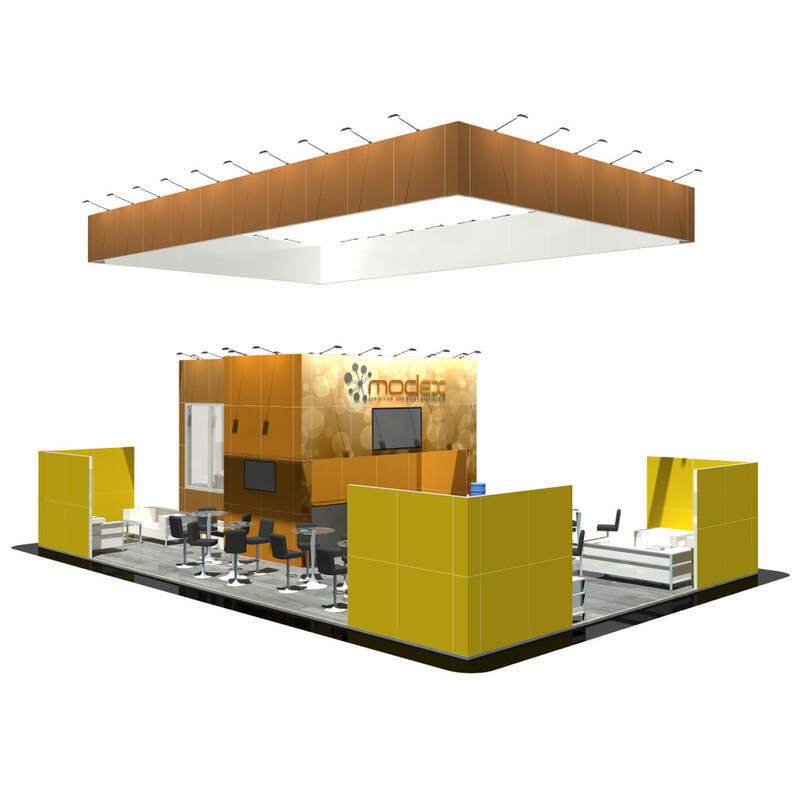 This 6 by 6 stand focuses on customer interaction with its spotlighted seating areas and even a separate meeting room area for those more important conversations. With its unique design this 6 x 6 stand uses a large island section on the stand to captivate the passer-by from all angles. 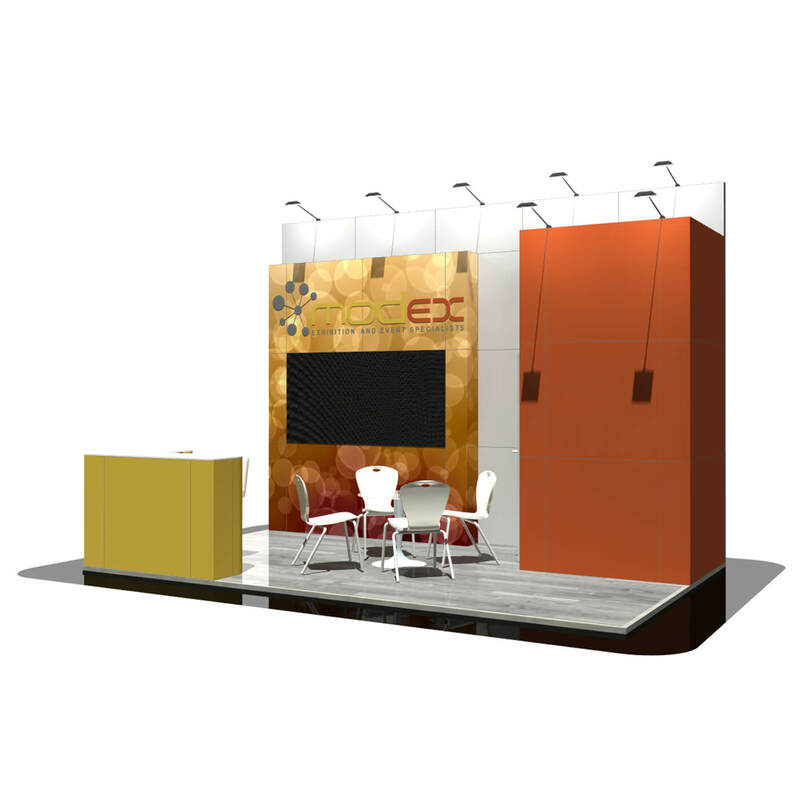 Make an impact with this intriguing 6 by 6 stand design with room to entertain at the bar or converse with potential clients in the separated meeting room area. 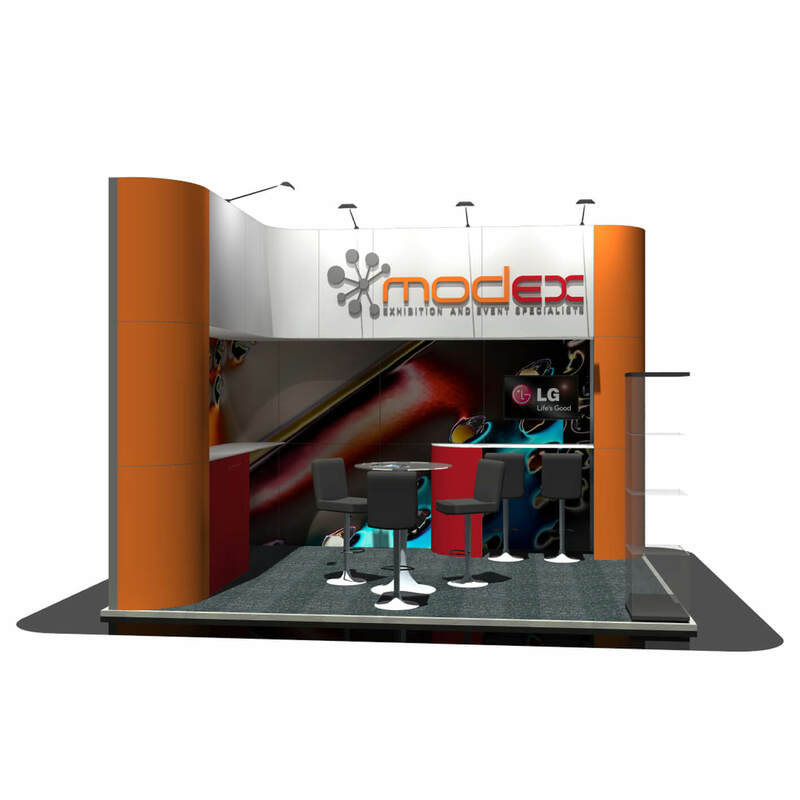 Welcome customers onto this six by six stand from all angles. 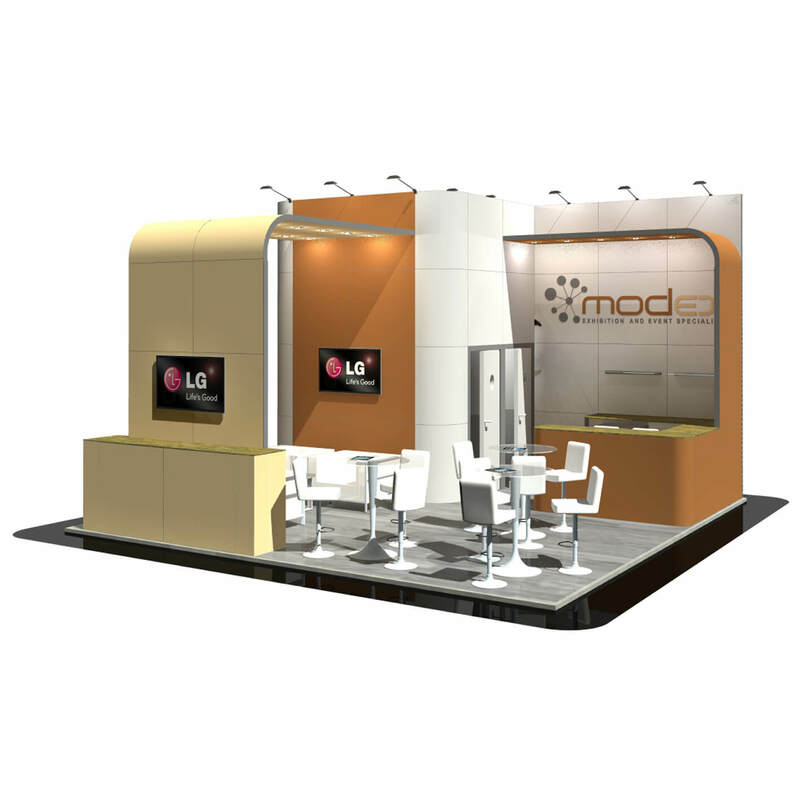 With multiple seating areas and two large columns to intrigue passers-by, this stand maximises impact for any business. 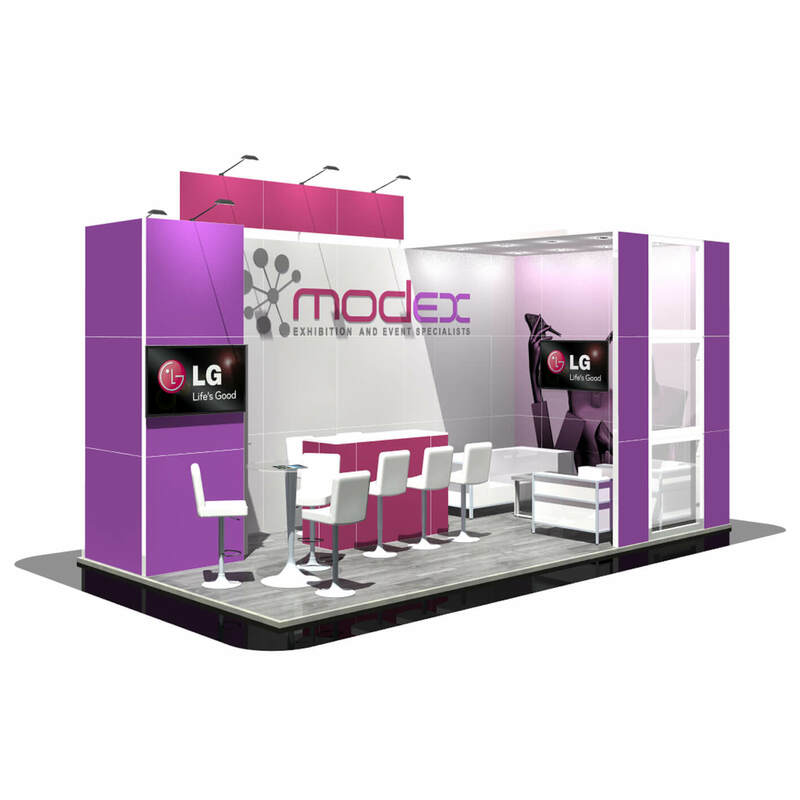 A large and open 6 x 6 island stand that lets the graphics do the talking and allows for customer interaction from all angles. 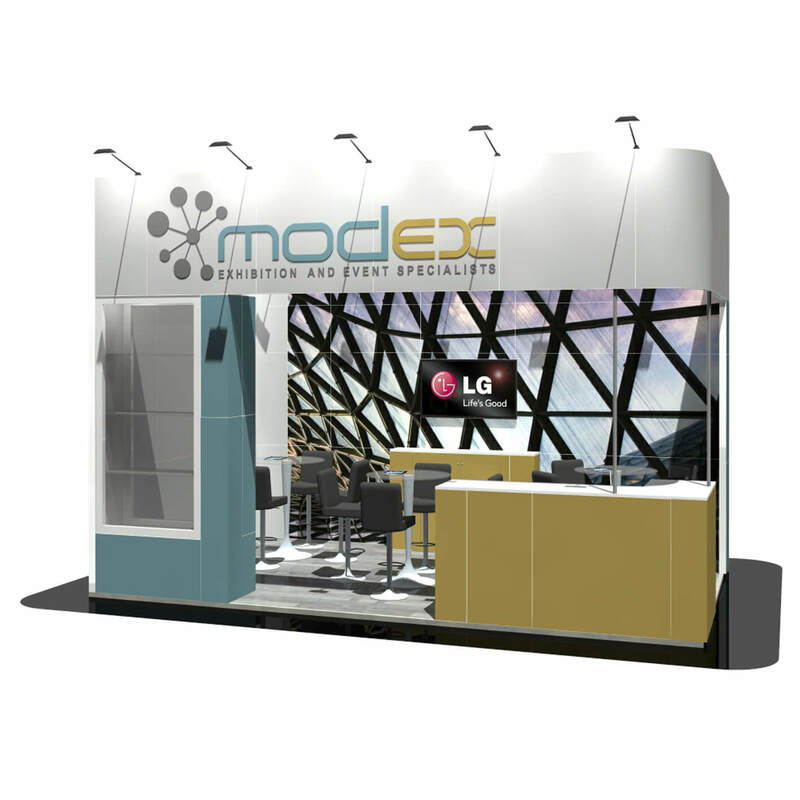 With multiple curved overhead spotlight structures, this six by six island stand makes the most of the space whilst also focusing on elegant design and room for business to customer meetings. 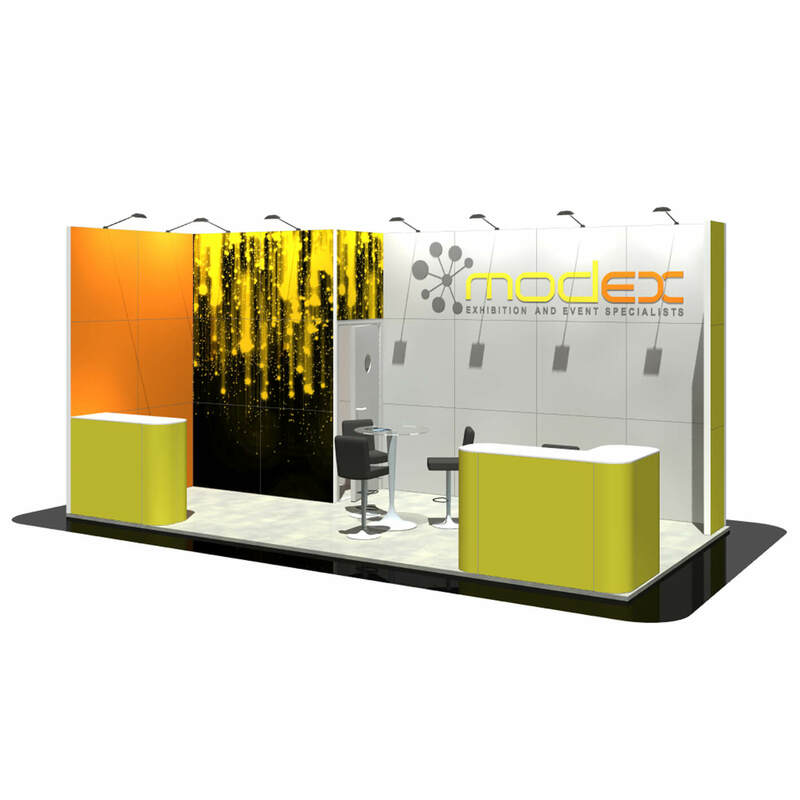 A large hanging banner, spotlighted curved overhead sections and a separate meeting room to maximise impact on this intriguing 6 x 6 stand. 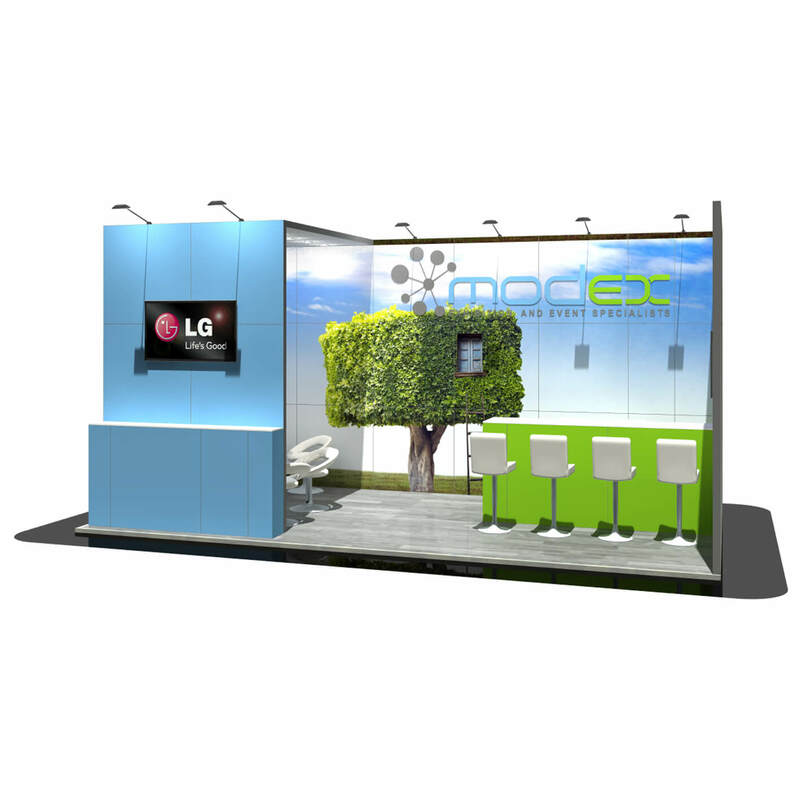 Open two sides this 6 x 3 stand is great for customer interaction and even has its own separate lockable storage room. Entertain customers on this 6 by 3 stand with a dedicated bar area and separate meeting space with a glass balustrade for unique design and additional privacy – all with spotlights to show off your brand. 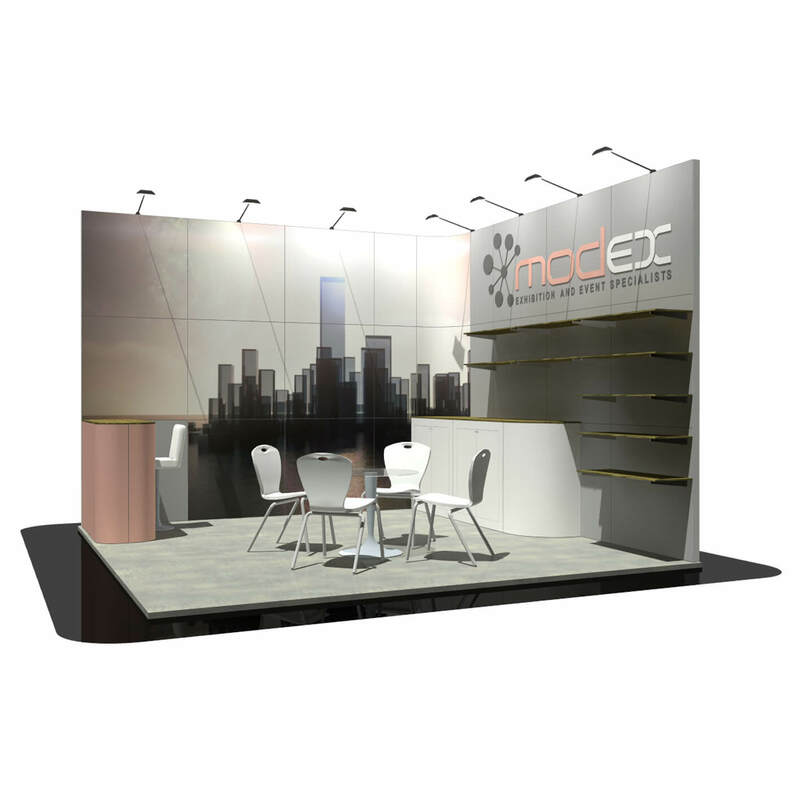 Promote your brand with the raised header section and have those important meetings in a separate spotlighted meeting area with additional acrylic panels on this six by three stand. 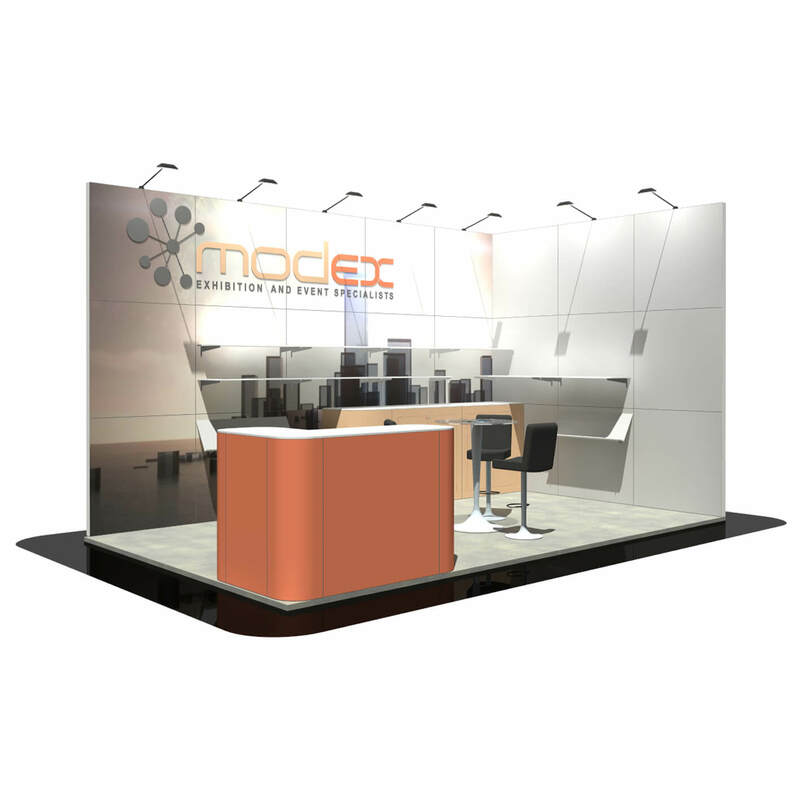 This large and open two side 6 by 3 stand allows for great customer interaction with multiple counter tops and even a separate meeting room area. 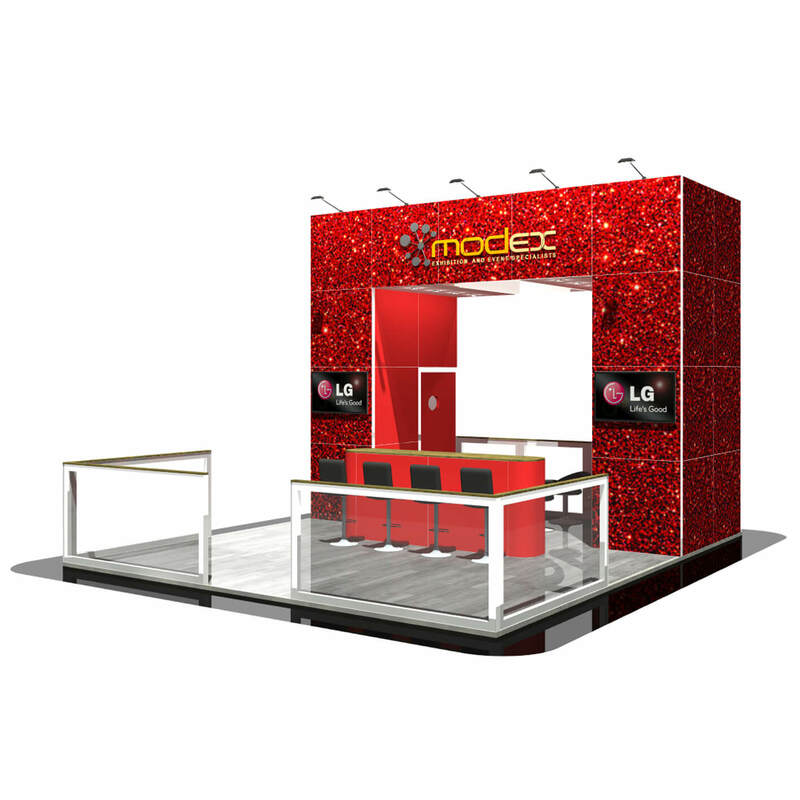 A simple and effective 6 x 3 stand to promote your brand and show off your products with spotlights and a dedicated product showcase feature. 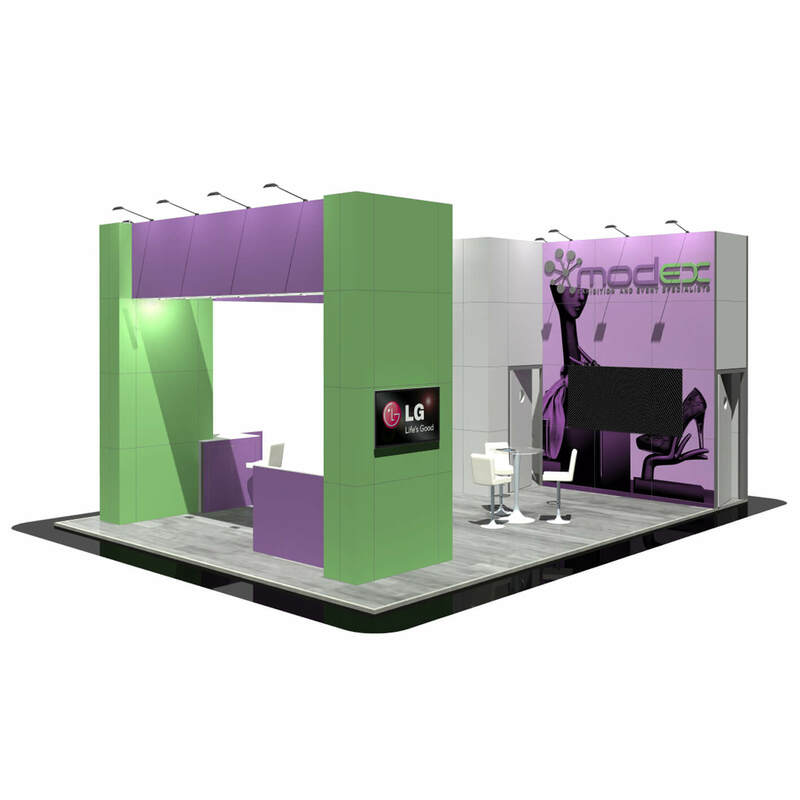 An large and open six by three stand that focuses on showcasing products and interacting with customers. 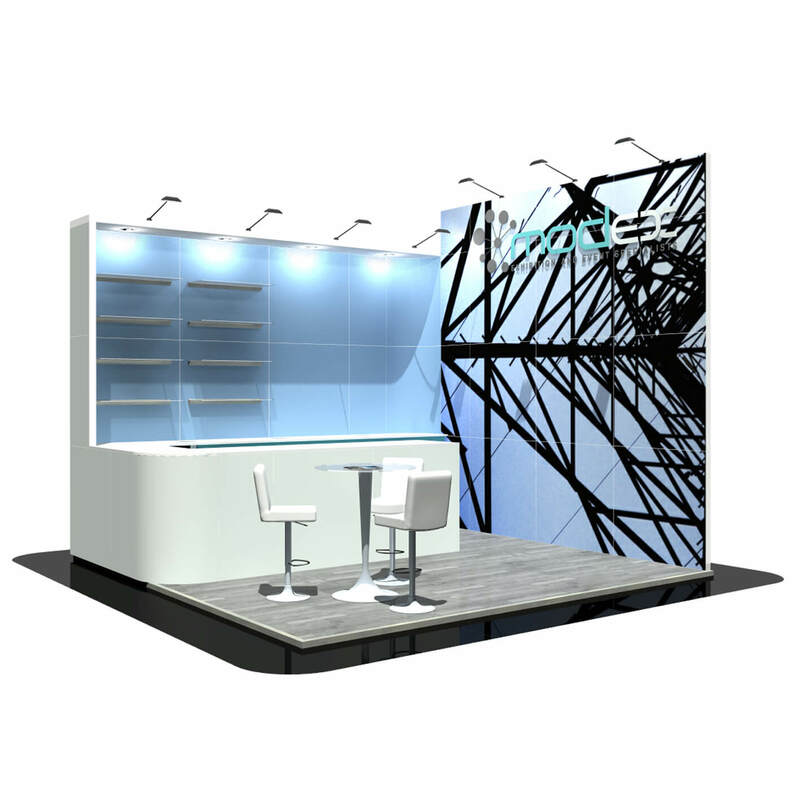 This 6 by 3 island stand utilises the space to engage with customers from all angles and showcase products with its multiple shelving spaces. 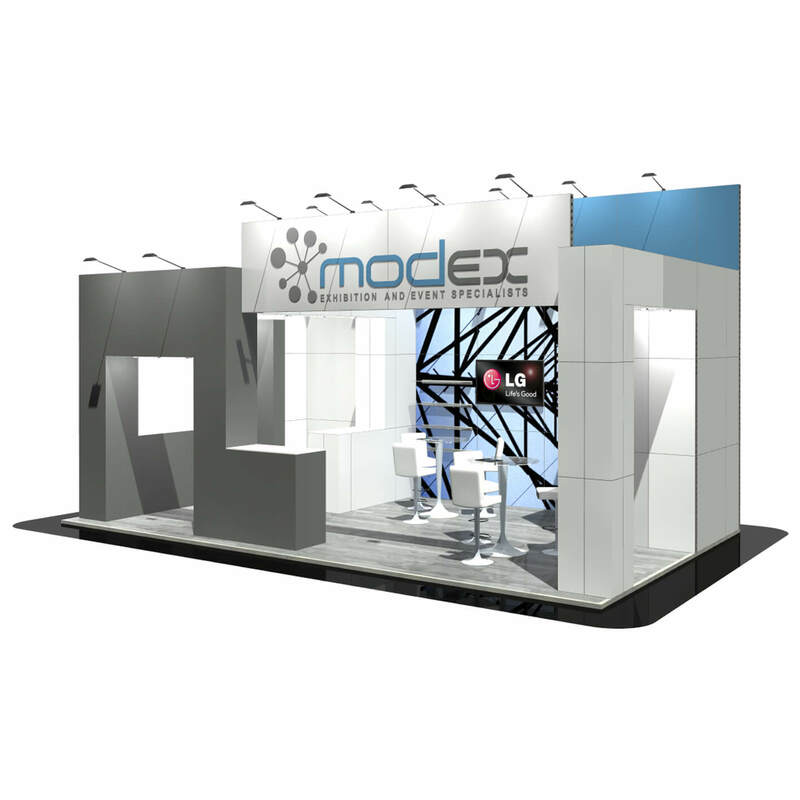 With an elegant halo-style overhead section, this 6 x 3 stand is great for brand promotion with acrylic panels and internal shelving units to showcase products. For more close and personal interactions this intriguing 6 by 3 stand utilises the space for maximum impact with spotlighted overhead sections, multiple glass shelves and lockable storage space. 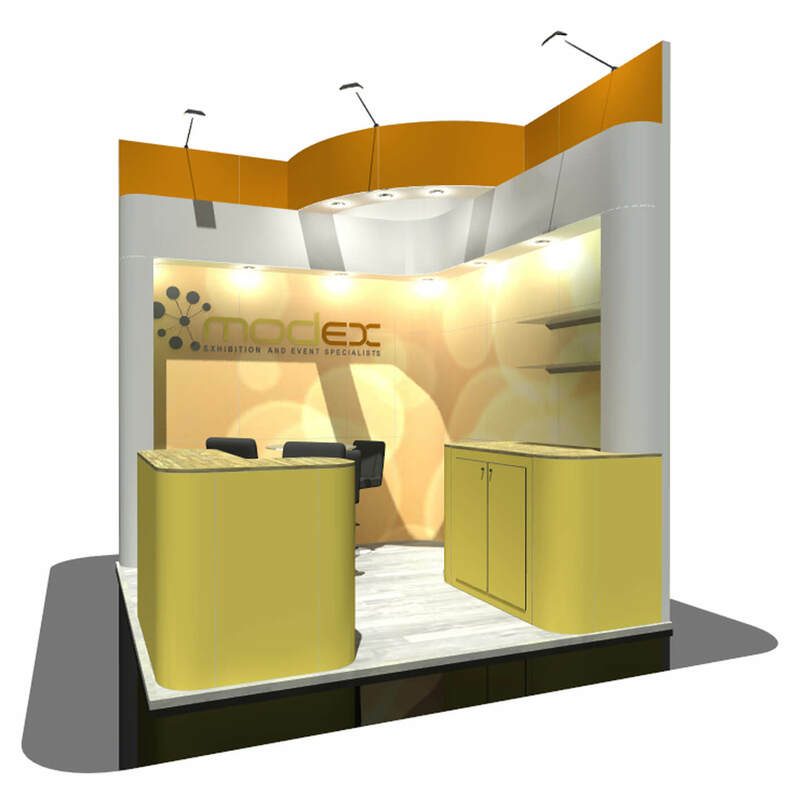 This two-sided six by three stand focuses on business to customer interactions with a separate meeting area with an enclosed overhead spotlight section for that extra personal touch. 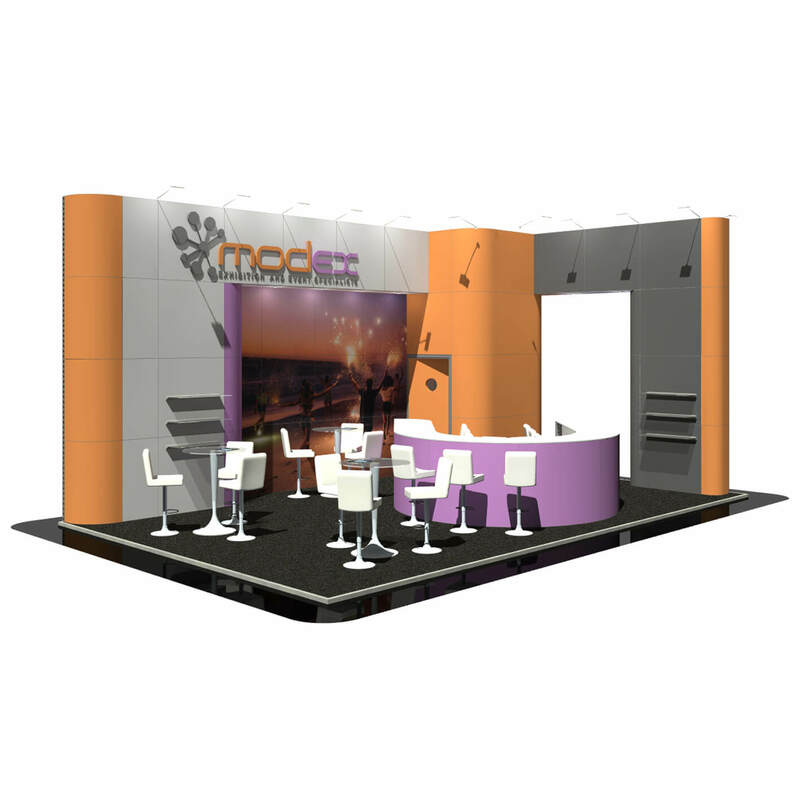 With a number of spotlights, a bar-style counter to entertain customers and even a separate meeting area, this 6 by 3 stand utilises multiple features to maximise brand. 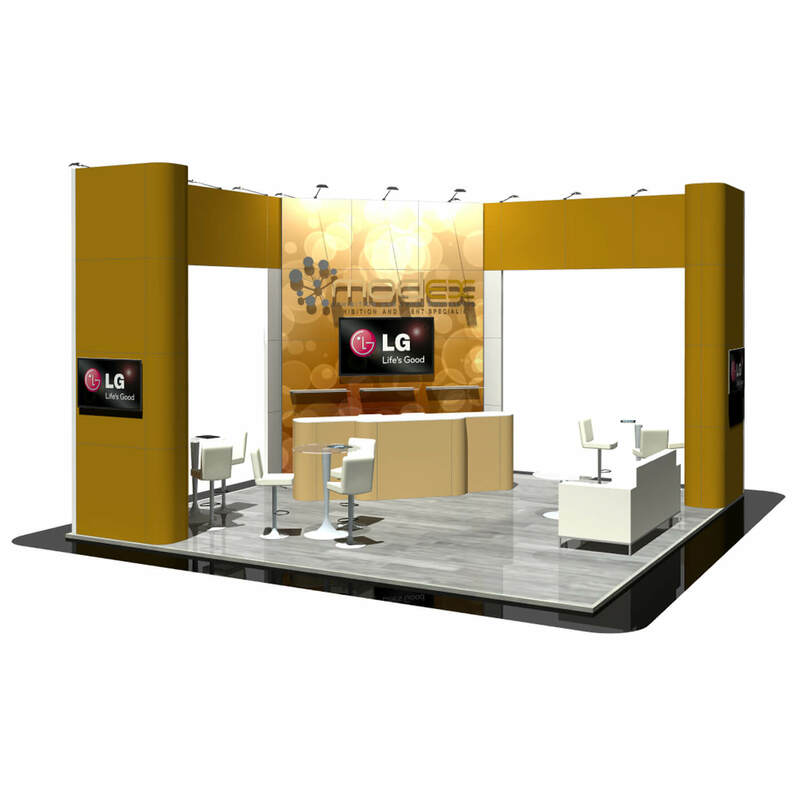 This large open 6 x 3 two-side stand focuses on brand promotion with a design to let the graphics do the talking and a separate meeting area for the more important conversations. 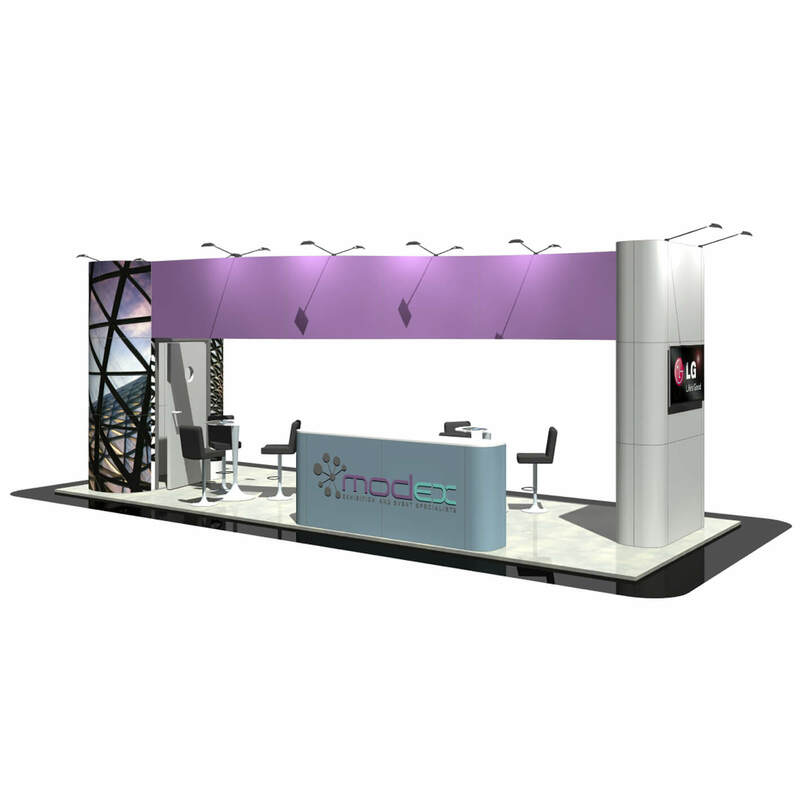 Different furniture to entertain customers and multiple recessed spotlighted sections to show off your product, this six by three stand ensures your brand and products will stand out. 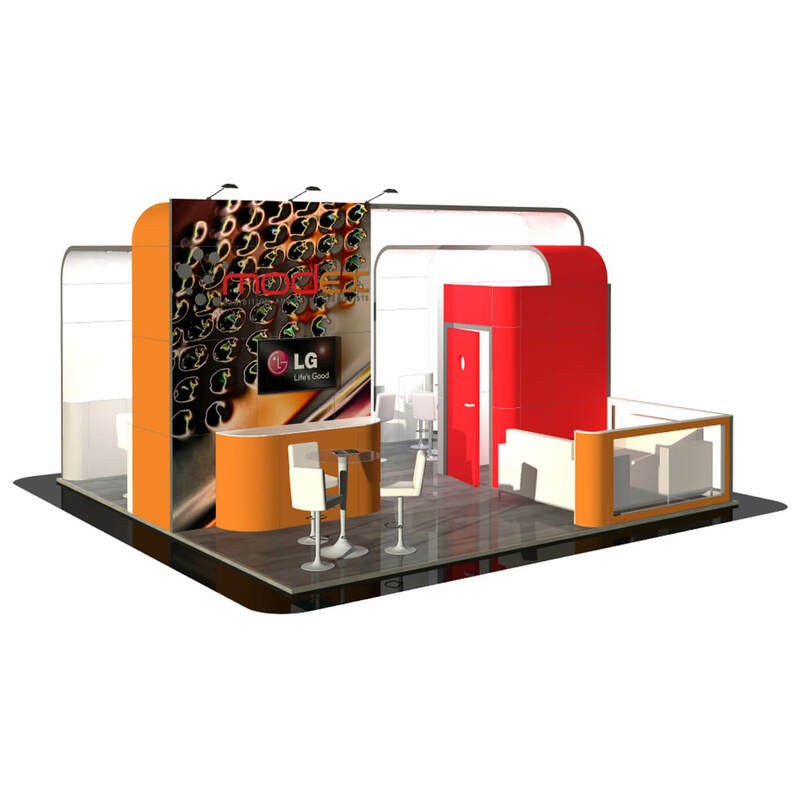 A simple 6 x 2 stand that utilises the space with multiple glass shelves for product showcasing. 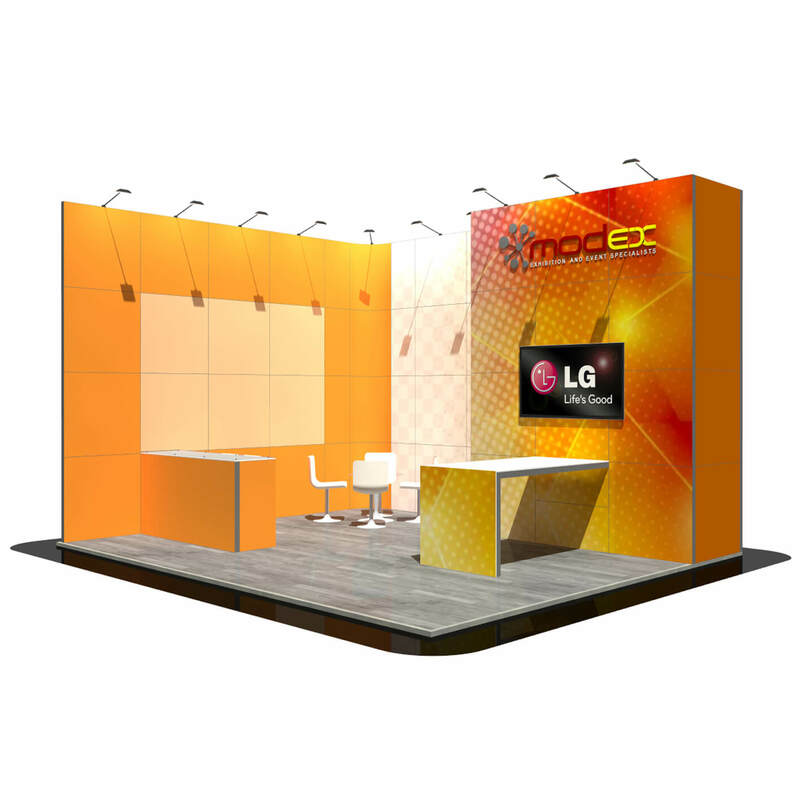 With a large back wall, this open 6 by 2 stand has space for customer interaction, a dedicated area for product showcasing and even a fridge to entertain customers also. Open one side this six by 2 stand is simple and effective with lockable cupboards for storage, glass shelves and multiple counters easier business presentations. 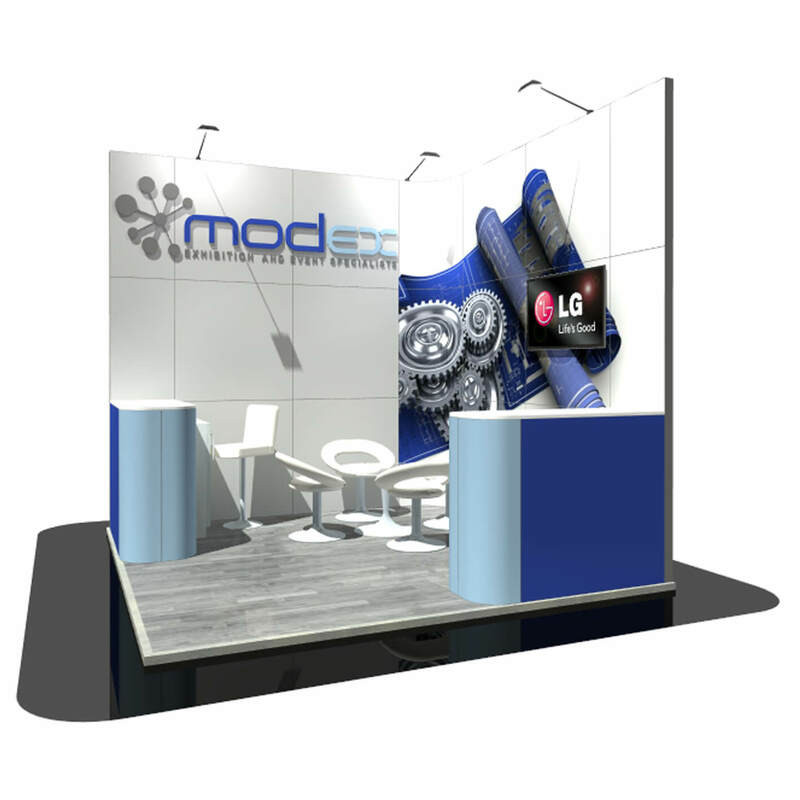 This 5 x 4 stand has multiple areas to showcase different products, furniture for more personal business to customer interactions and a lockable cupboard for extra storage and security. 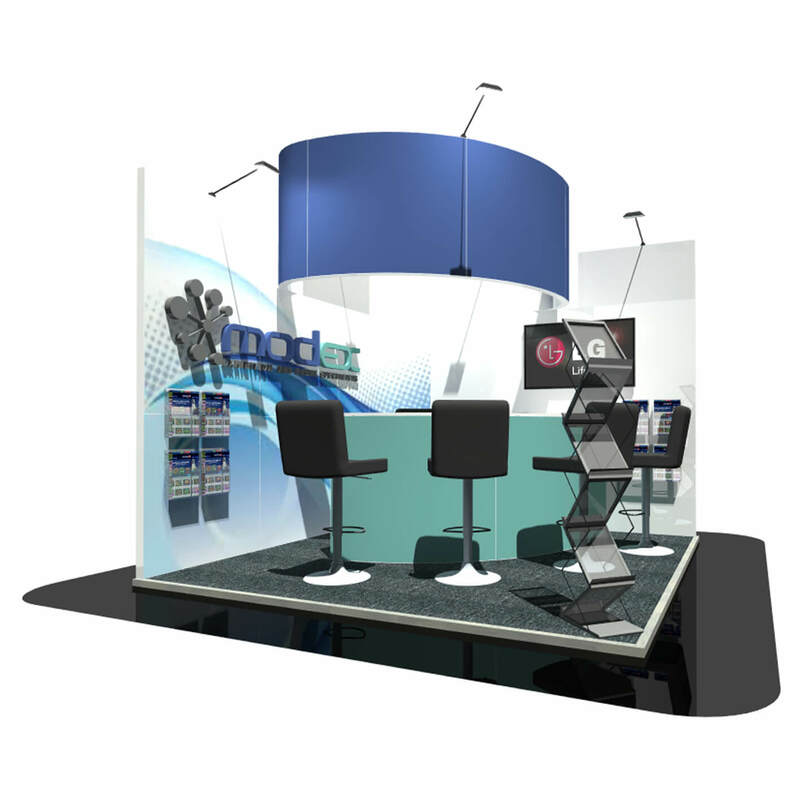 With its island stand design this five by 4 stand uses spotlights and recessed sections for AV and product showcasing to attract customers from all angles. 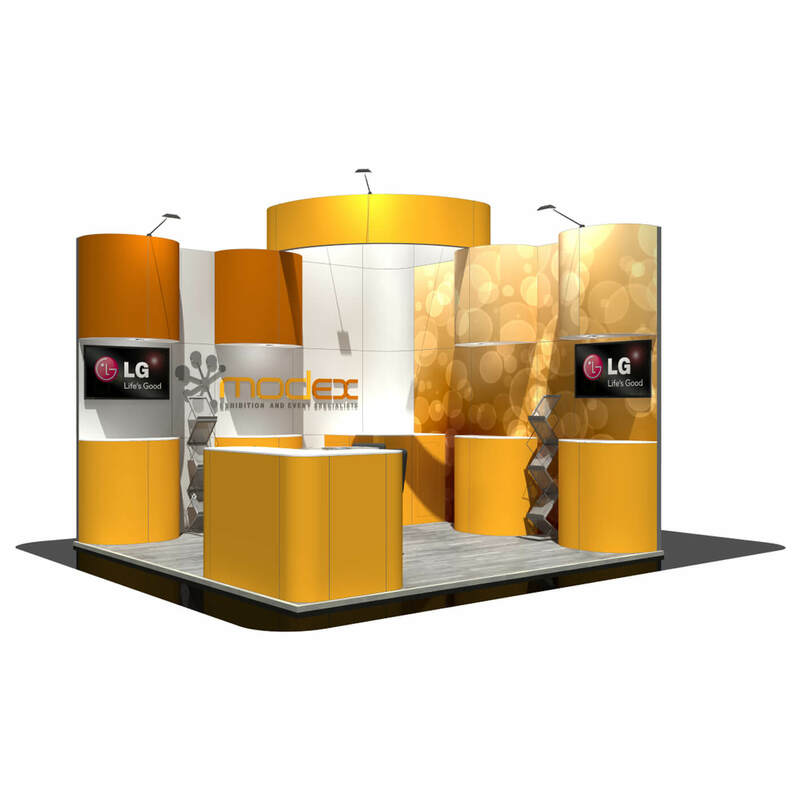 A spectacular 13×7 stand that focuses on entertaining, interacting and securing the next sale with a customer. 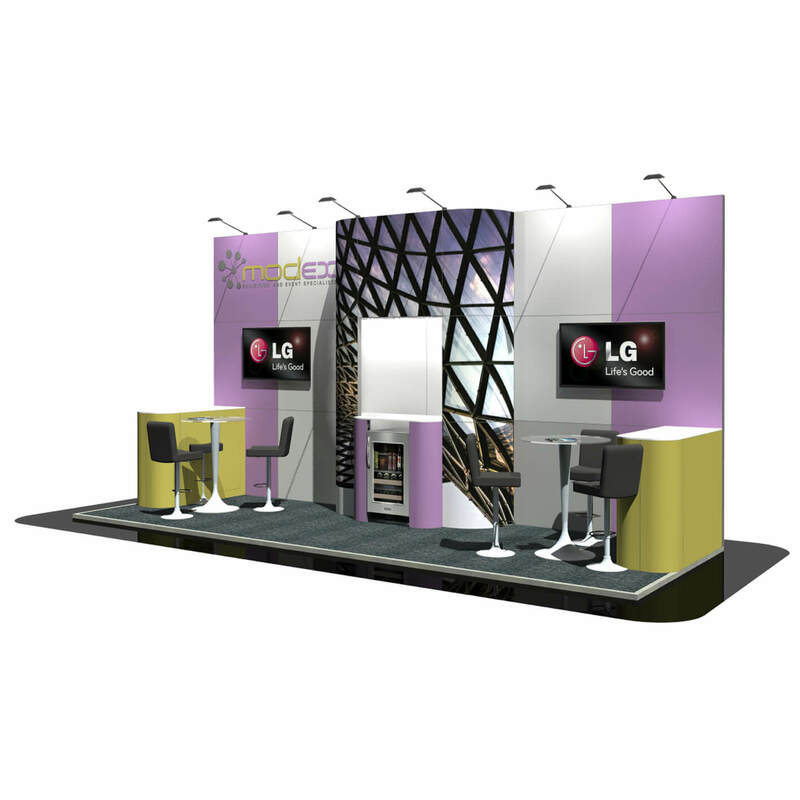 With two dedicated meeting room areas and a curved bar, this stand really is a showstopper. 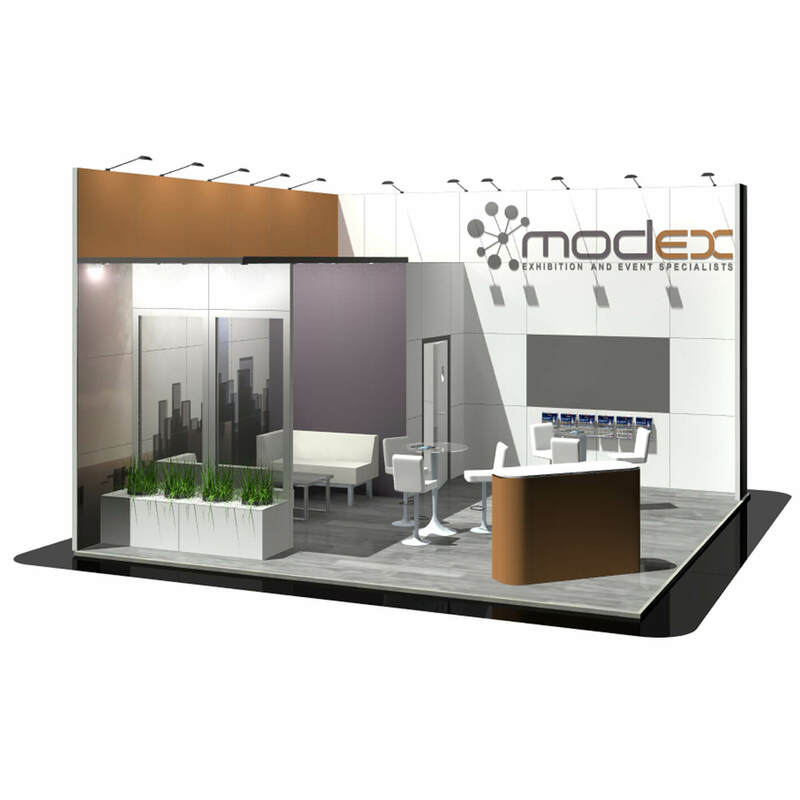 An open and welcoming 10 x 5 stand with multiple meeting and demonstration areas and a large diagonally offset wall to invite the passer-by on for a conversation. 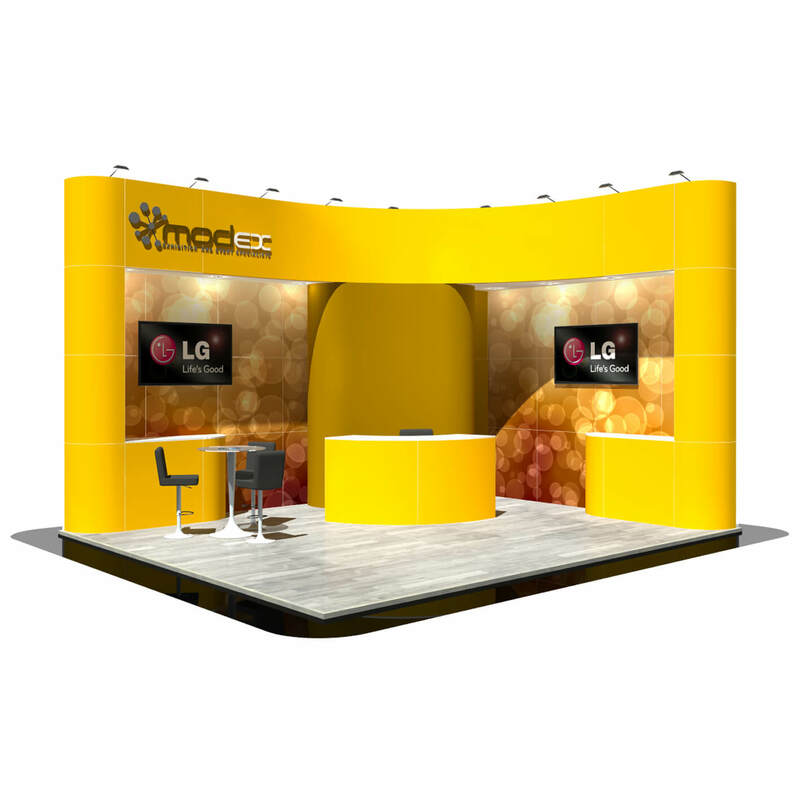 This grand 9×6 island stand dedicates the large space to multiple meeting areas with freestanding counters and a series of columns with an oval header above to display attractive graphics and AV. 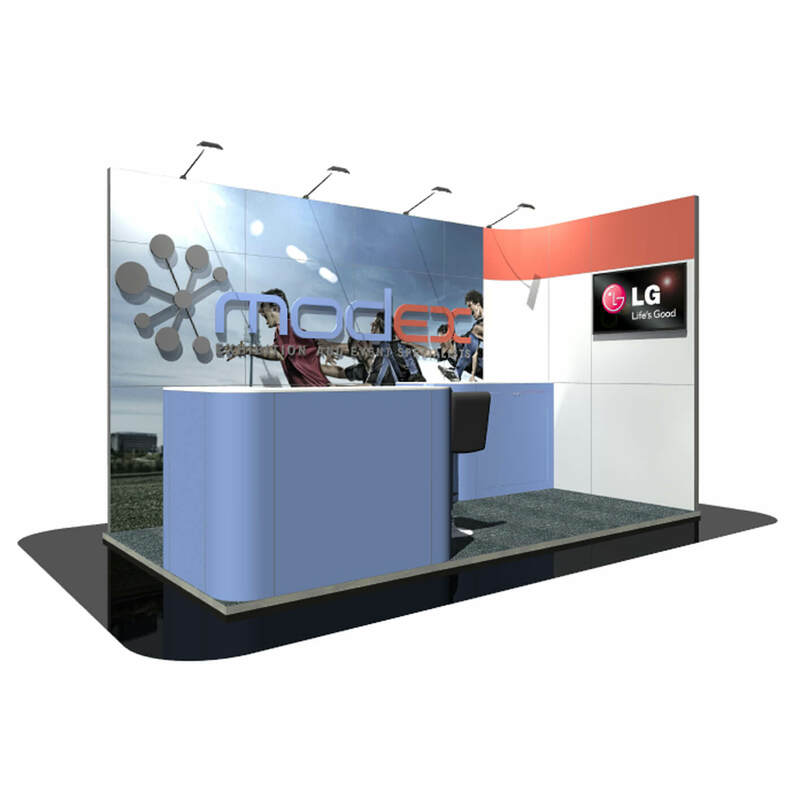 An open 6 by 5 stand perfect for product showcasing with a number of counters for meetings and product demonstrations and a lockable storage room also. 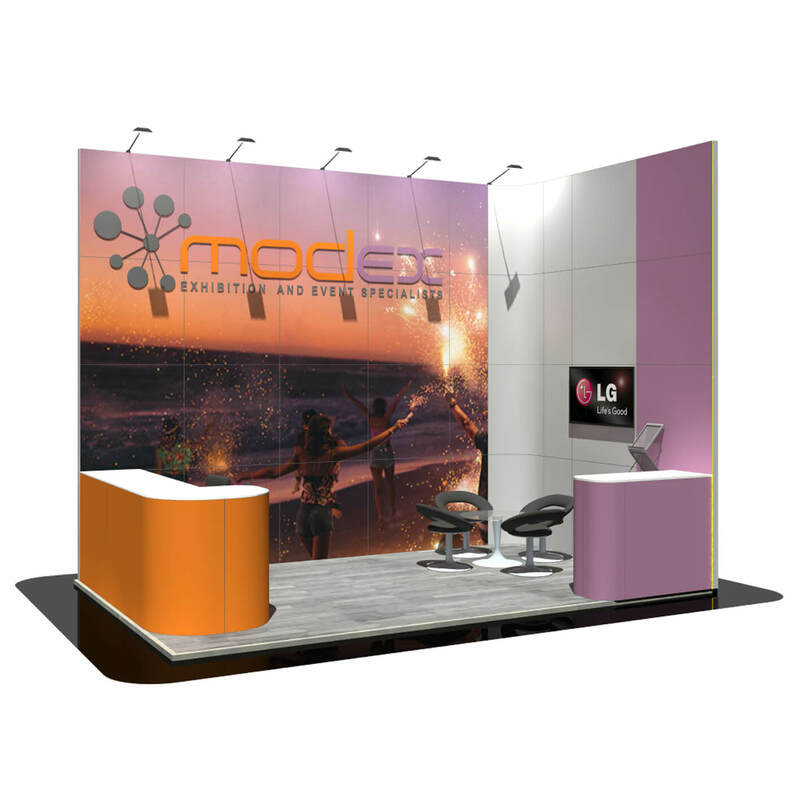 A large six by five island stand with a curved bar for entertainment and a tall structure to let the graphics do the talking when it comes to attracting the next customer. An intriguing island-design 4 by 3 stand that aims to capture your customers’ attention from all angles with its curved arches and spotlights. 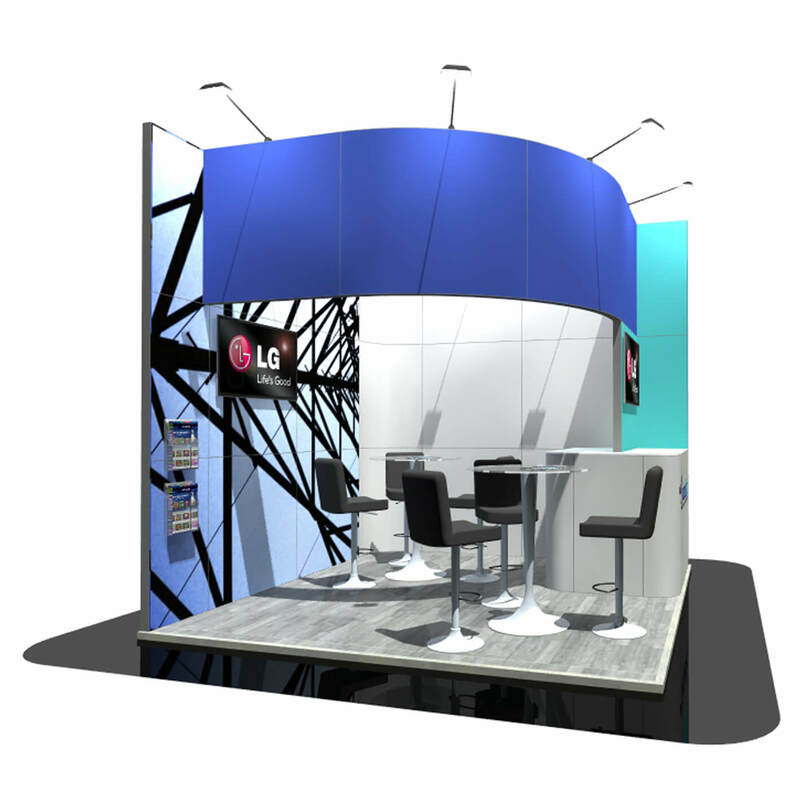 A unique and intriguing 5 x 5 stand design that focuses on product showcasing with its large offset circular frame with internal spotlights and multiple areas dedicated to product demonstrations. 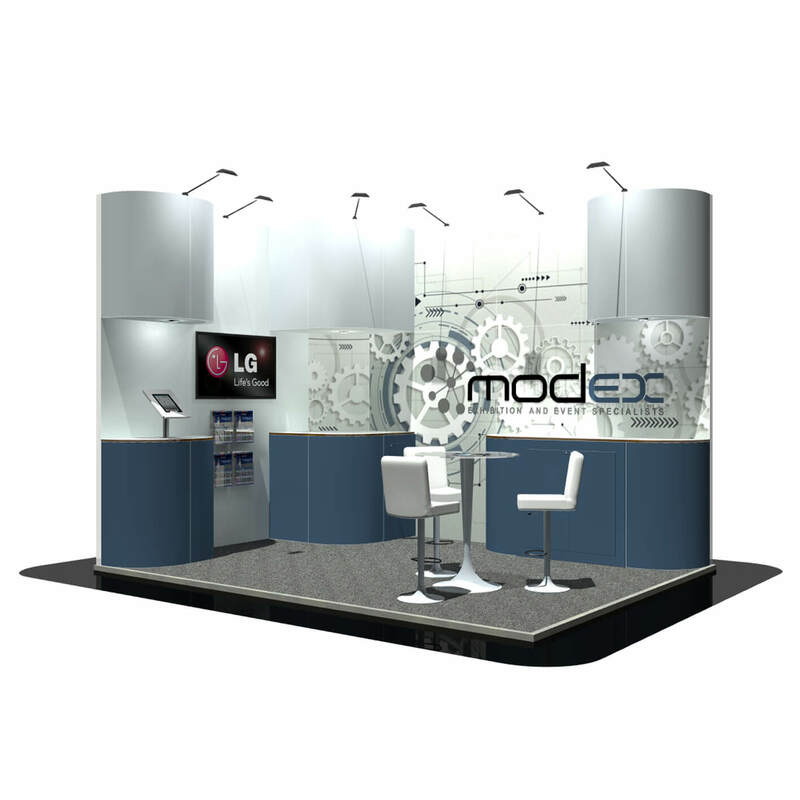 This 3×3 stand is simple but effective with two countertops for product demonstrations and customer interactions and a further seating area for those all-important meetings. 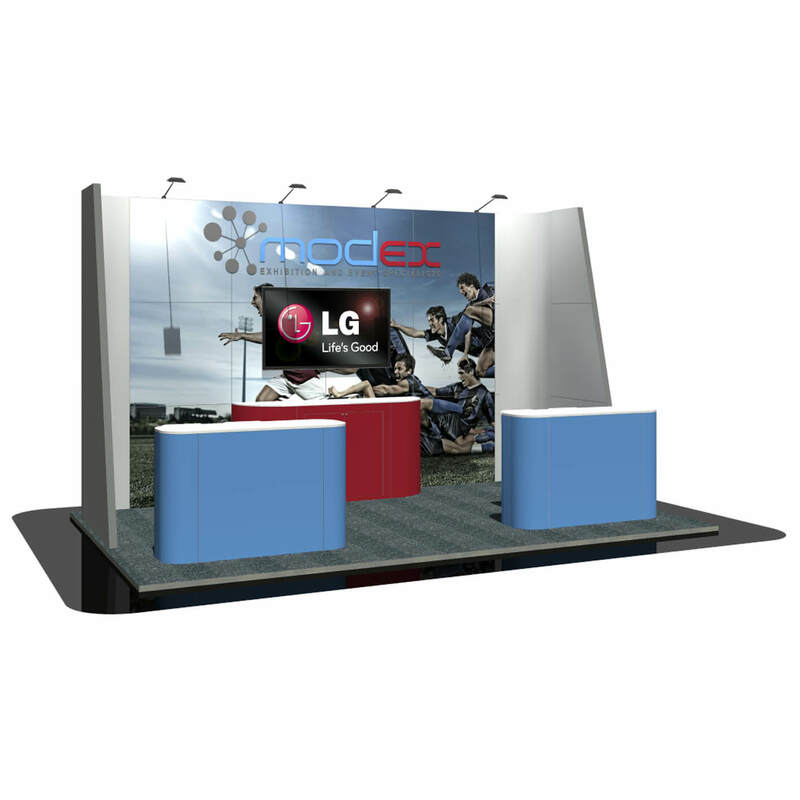 A simple and open 5 x 4 stand that focuses on showcasing products and customer engagement. 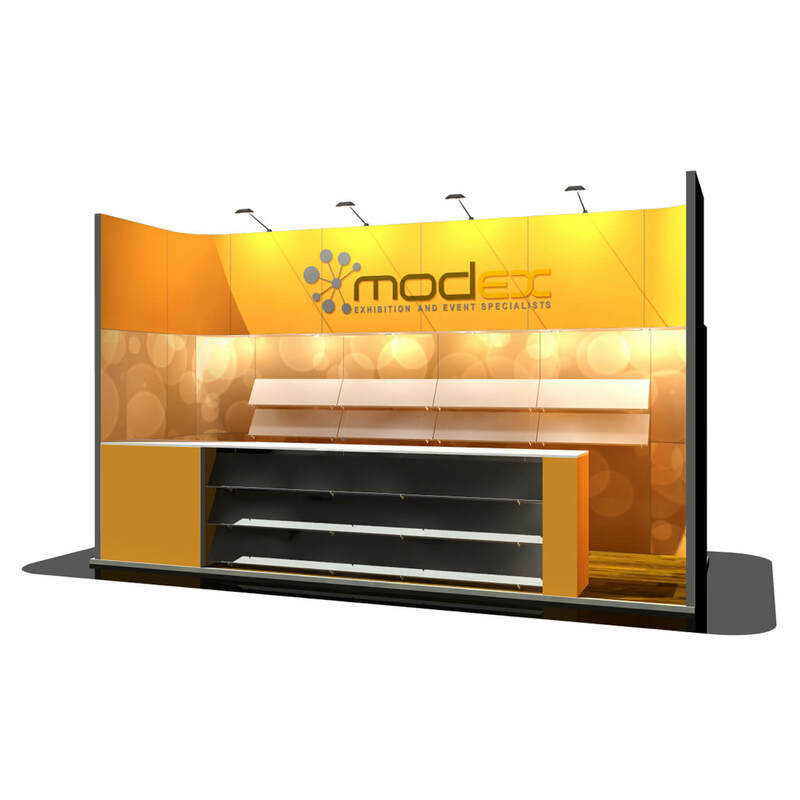 With plenty of shelving space and a number of spotlights under the header section this 4 x 3 stand allows you to showcase your best products and entertain customers while you deliver your best sales pitches. 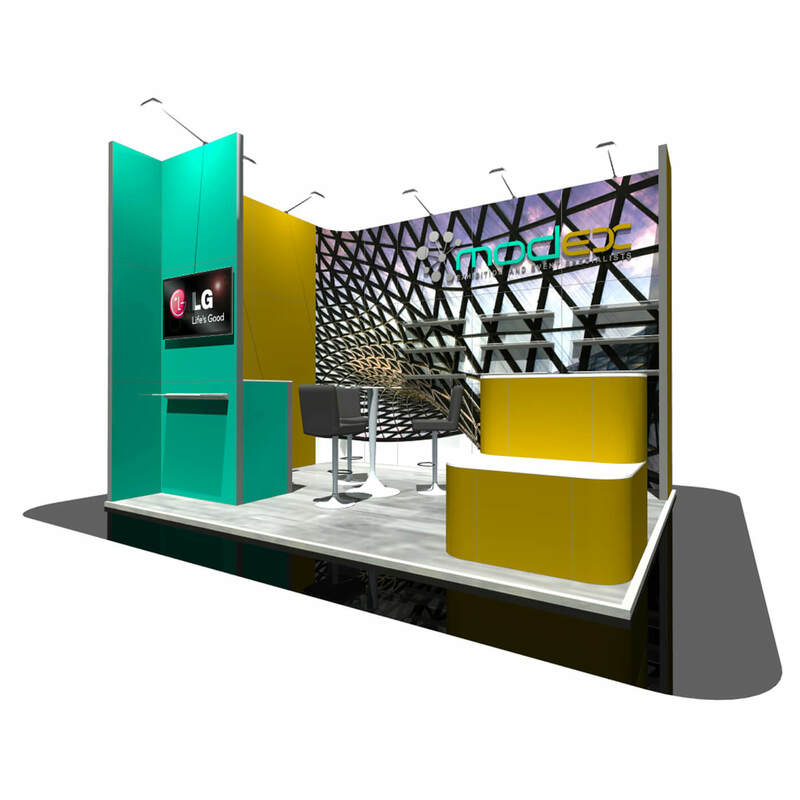 A two metre spotlighted header section, an archway meeting area and two display screens to show off your business to its full potential, this four by three stand utilises the space and focuses on the important bits. 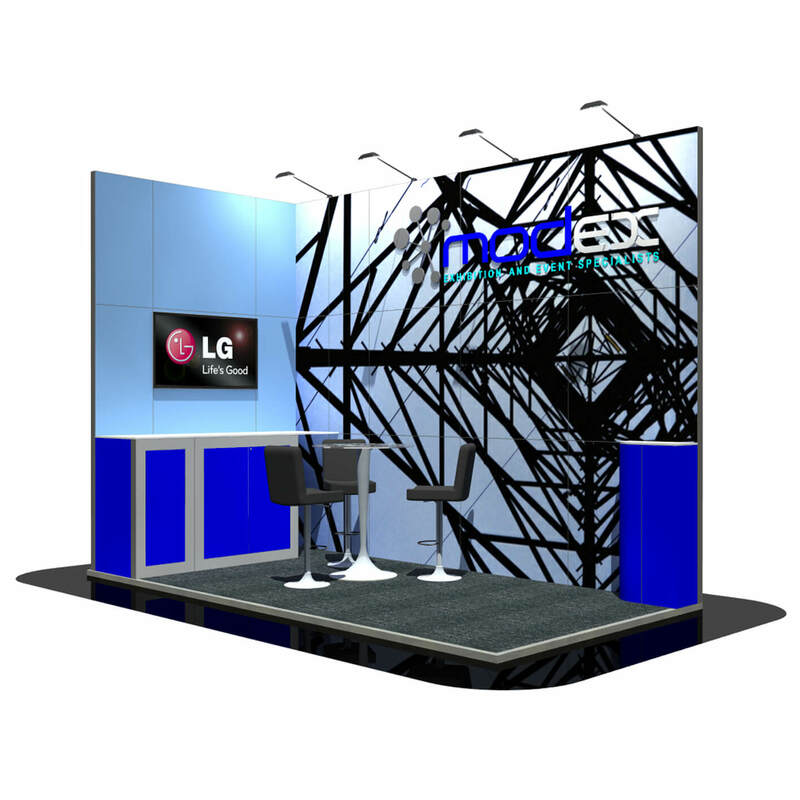 An inviting five by five stand with a number of spotlights and a large graphic banner structure that attracts nearby customers onto the stand. 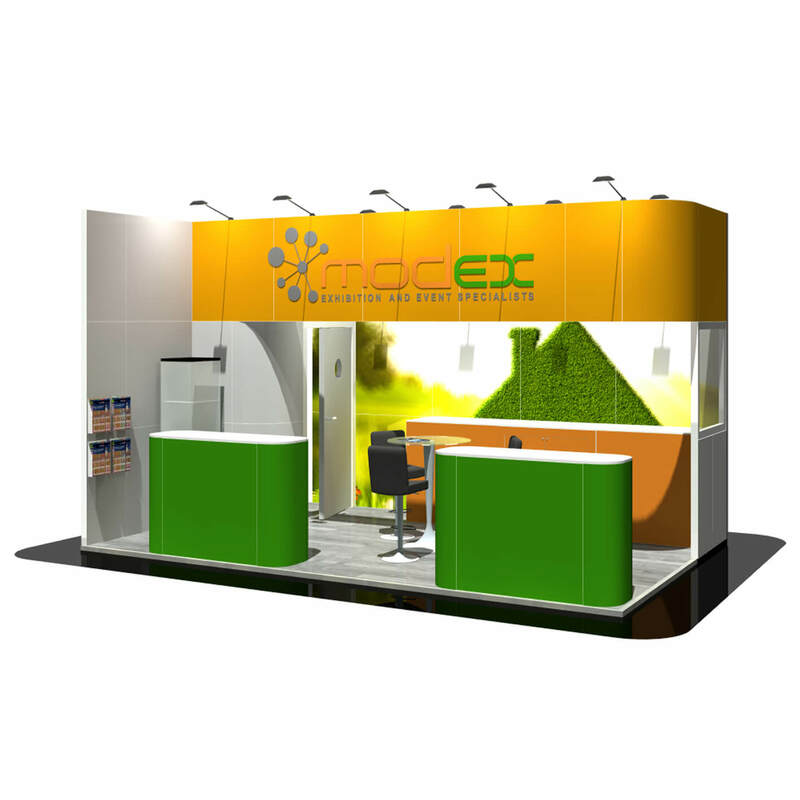 This welcoming 7×3 stand uses LED lights and spotlights to attract the passer by and have those important private meetings in a separate meeting room with an acrylic panel finish. 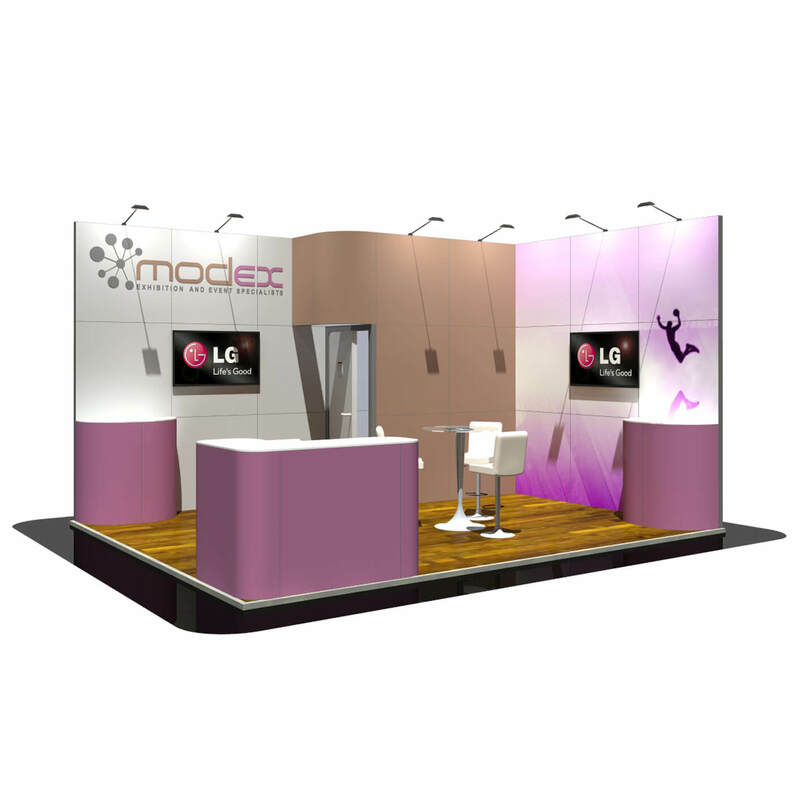 An outstanding hanging banner, an state-of-the-art LED video wall and all still with the space to have those important meetings, this 13×8 stand focuses on business to customer interaction and helps to make your business stand out above the rest. 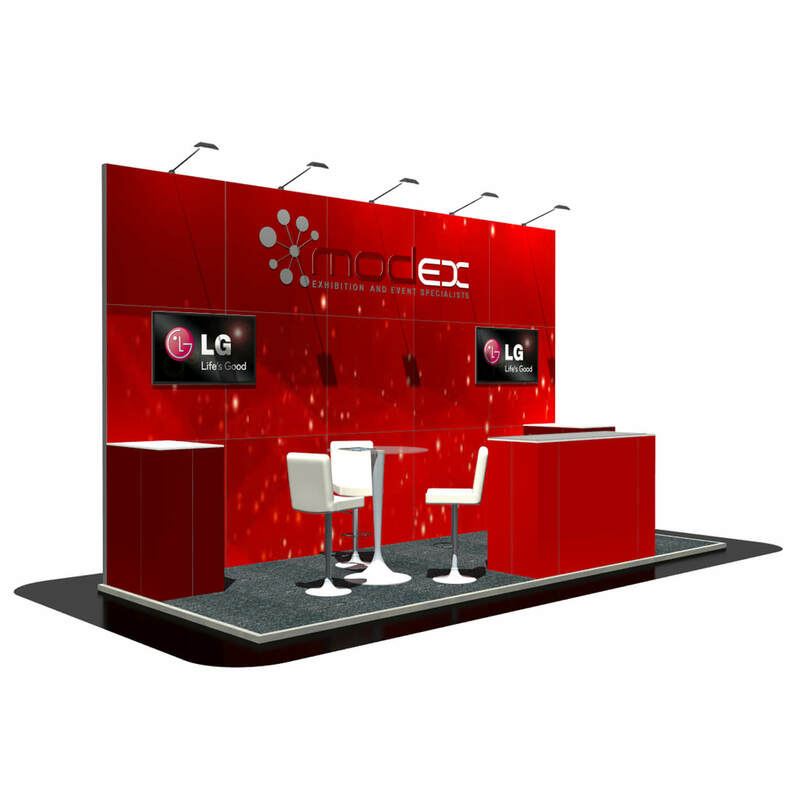 his clean and simple 3 x 2 metre exhibition stand has plenty of branding space for your graphics. 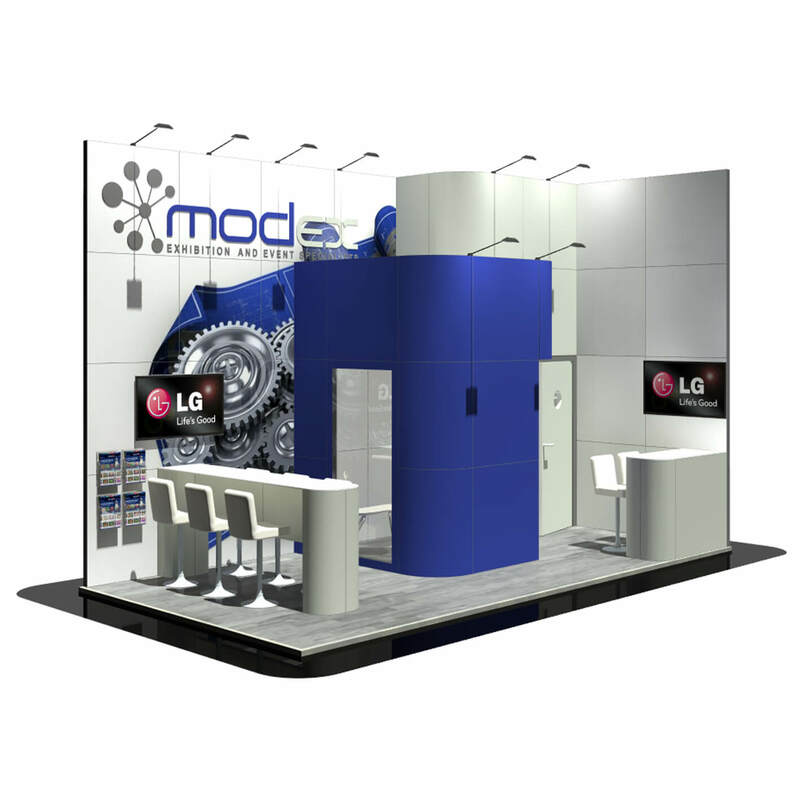 With a lockable cupboard positioned neatly at the front of the stand to interact with customers. 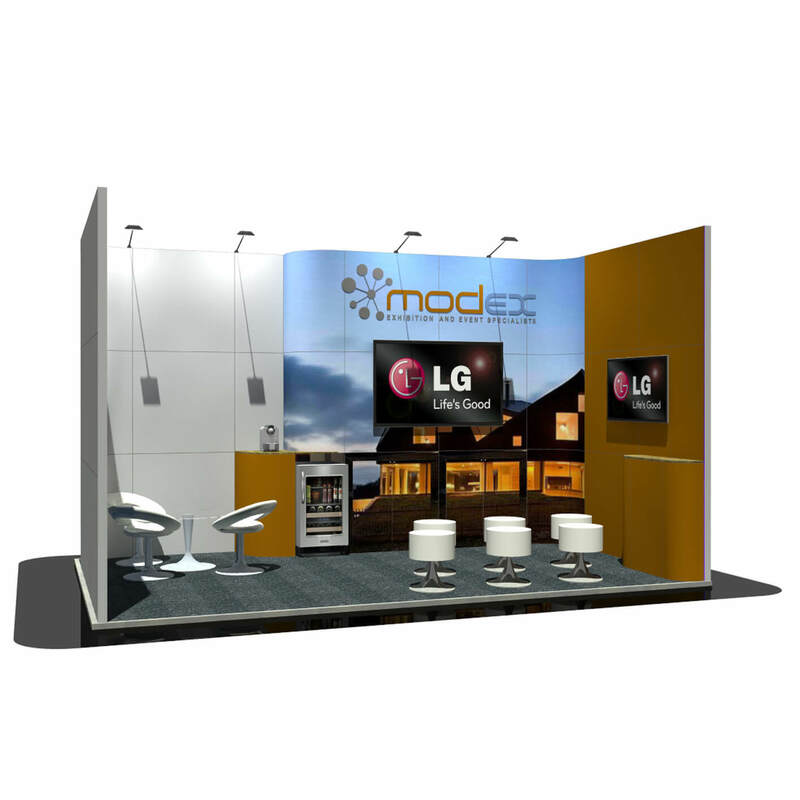 A three by three metre exhibition stand which is perfect for overhead branding. Complete with a screen, lockable cupboard and seating area for you to interact with customers. 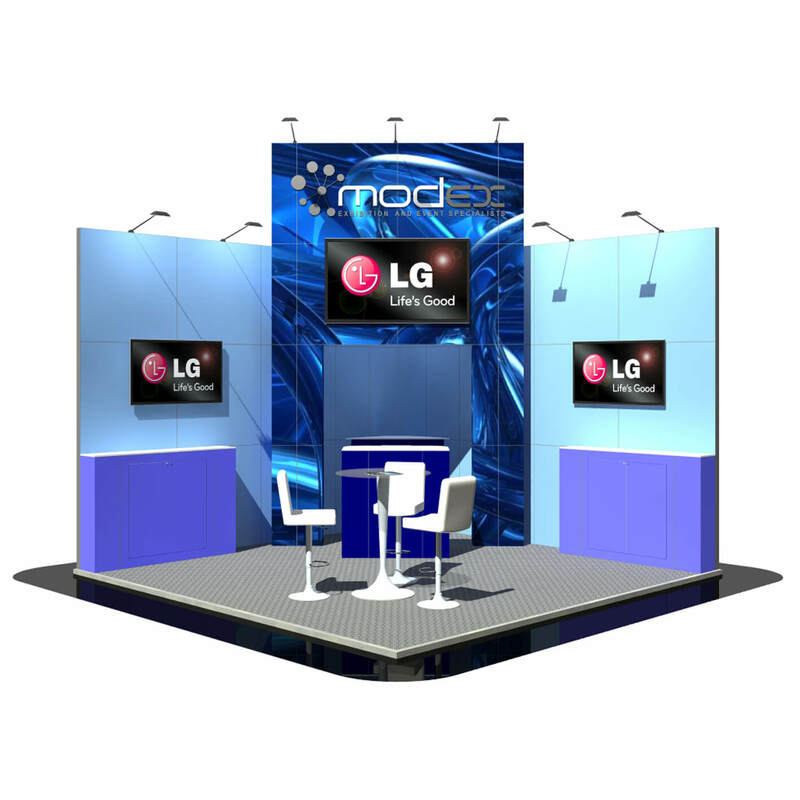 This 4 x 2 exhibition stand has a large prominent LED edge lit display board on the main back wall, perfect for product promotion or company branding. A lockable cupboard sits below a display screen with a meeting table placed neatly in the centre for customer interaction. At the side of the stand there is also a counter that holds 3 raised ipad stands. 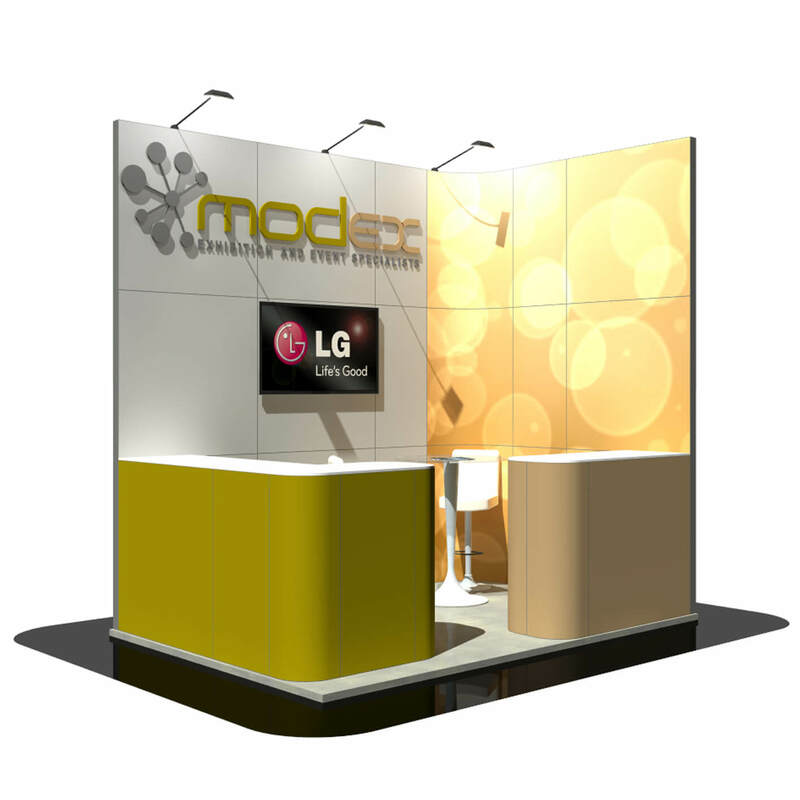 A four by two metre exhibition stand with an under lit header section. 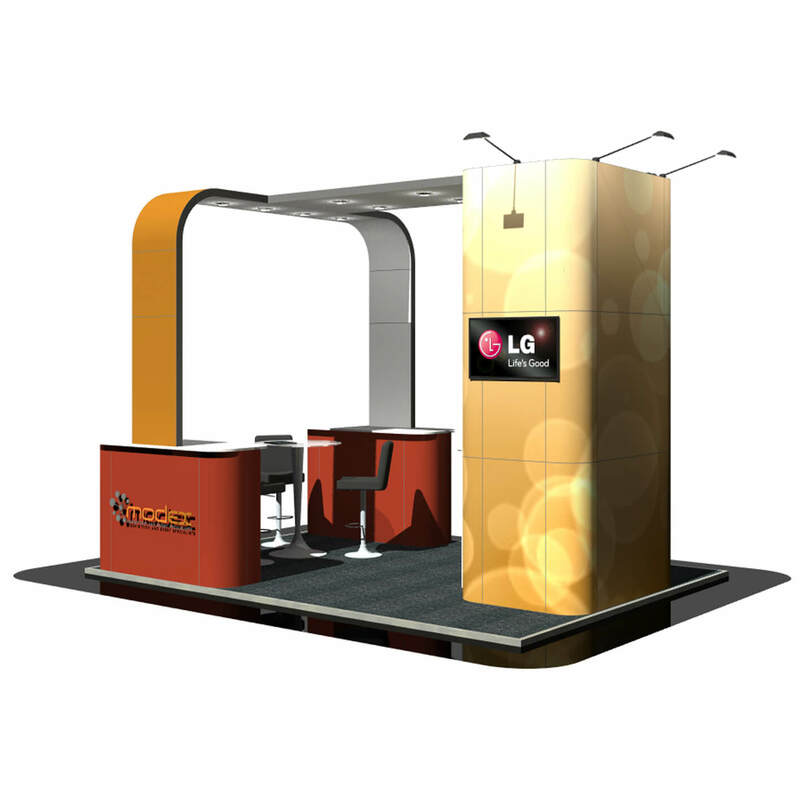 This stand also has a raised panel that sits just above the header section, which is perfect for your company branding. A freestanding counter with a lockable cupboard and high stools placed at the front completes the stand. 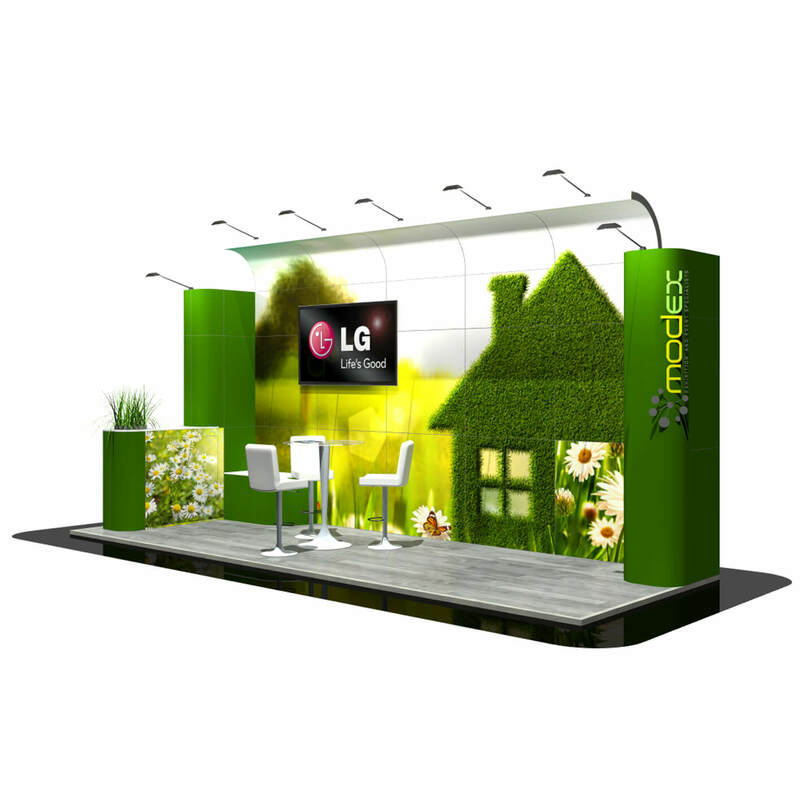 A large display wall that lends to branded graphics adds impact to this four x two metre stand. A lockable cupboard sits below a display screen with a table and chair set to meet and greet clients. A large four by four metre stand consists of a high back wall, prominent centre column that includes an under lit plinth and hidden lockable cupboard. This stand also includes a freestanding counter with lockable cupboard at the front to catch potential customers as they walk by. 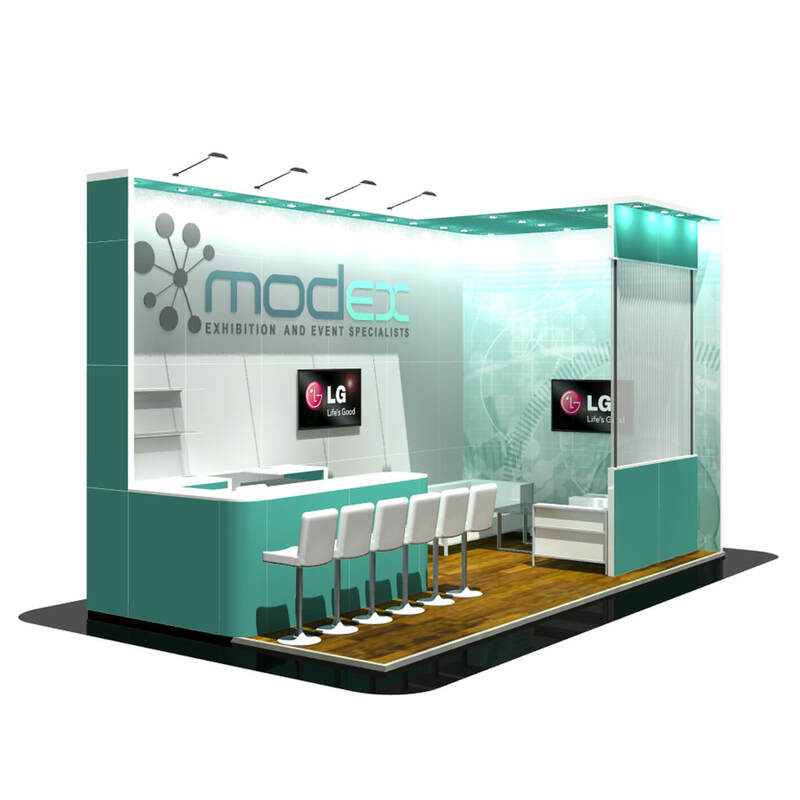 A meeting table for customer interaction completes this striking exhibition stand, just add your company branding for that wow factor. 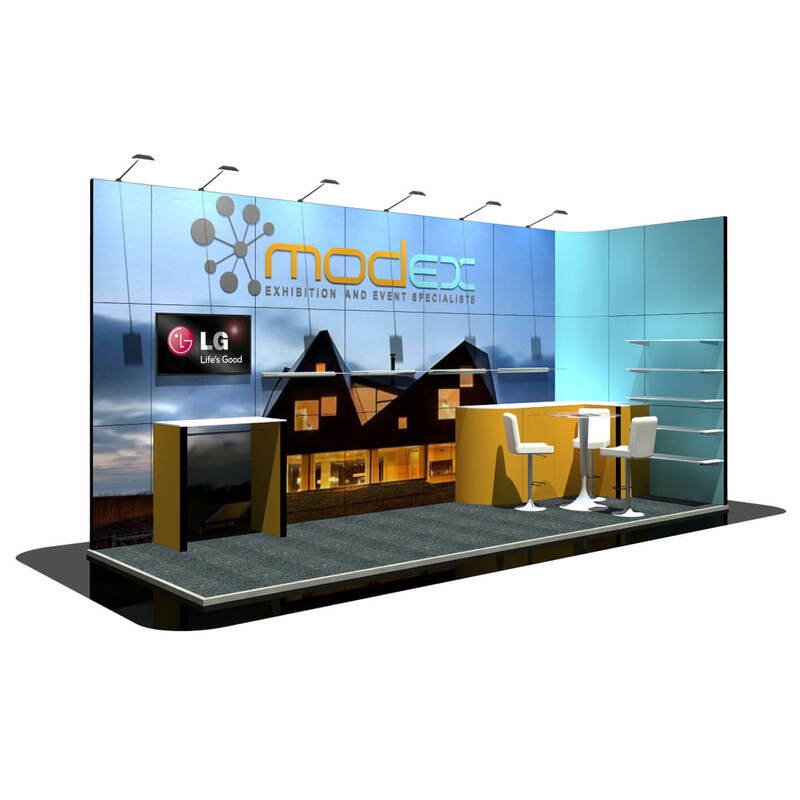 A five by two metre exhibition stand with an under lit header section. 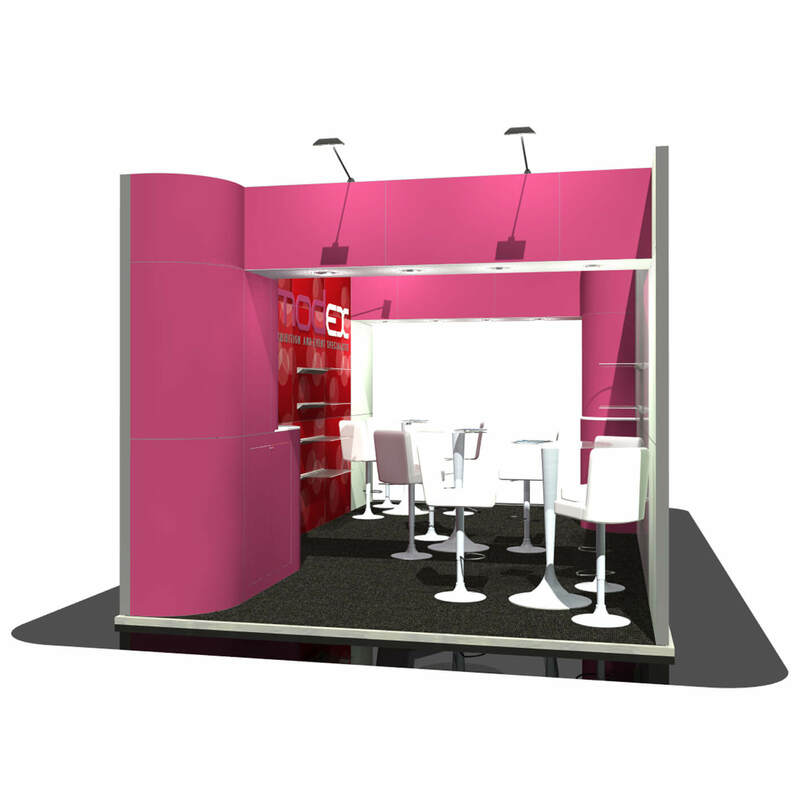 The stand also includes a meeting table, 2 lockable cupboards, a literature rack and large display screen. 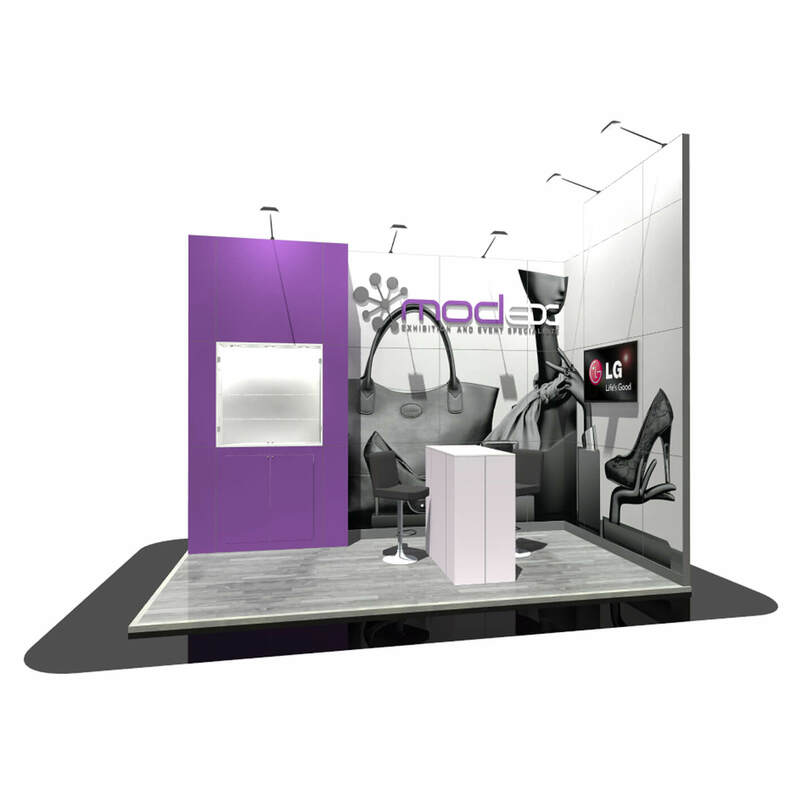 A 5 x 2 metre exhibition stand with endless shelving for all of your product literature. This stand also features an over and under led lit header section. 1 lockable cupboard behind the front counter and 3 stools for meeting and greeting potential clients. 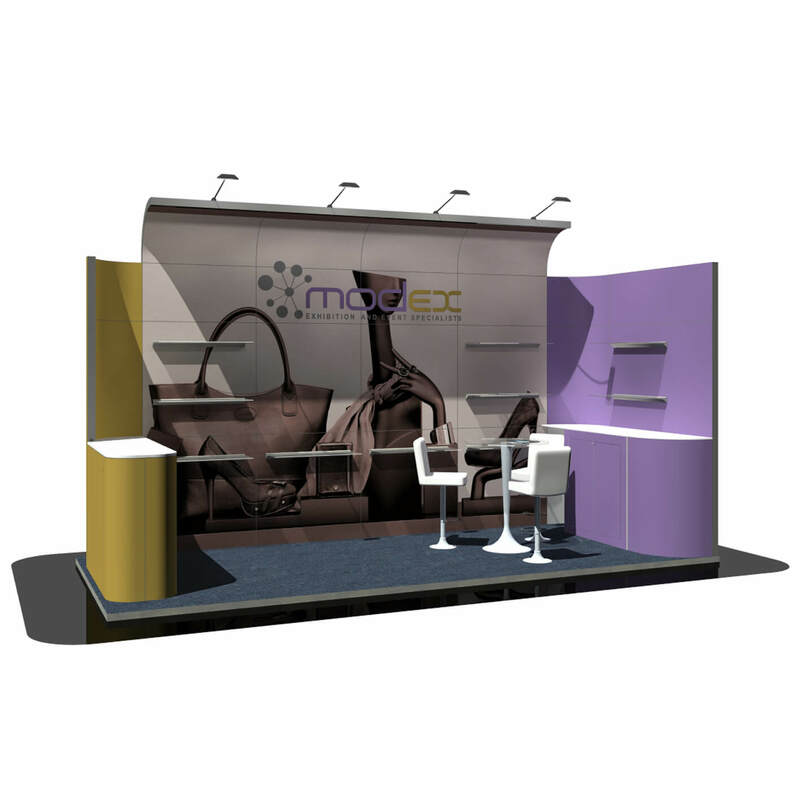 This five by two metre exhibition stand features an archway with a small meeting area underneath, a small lockable cupboard and a display screen attached to the front. 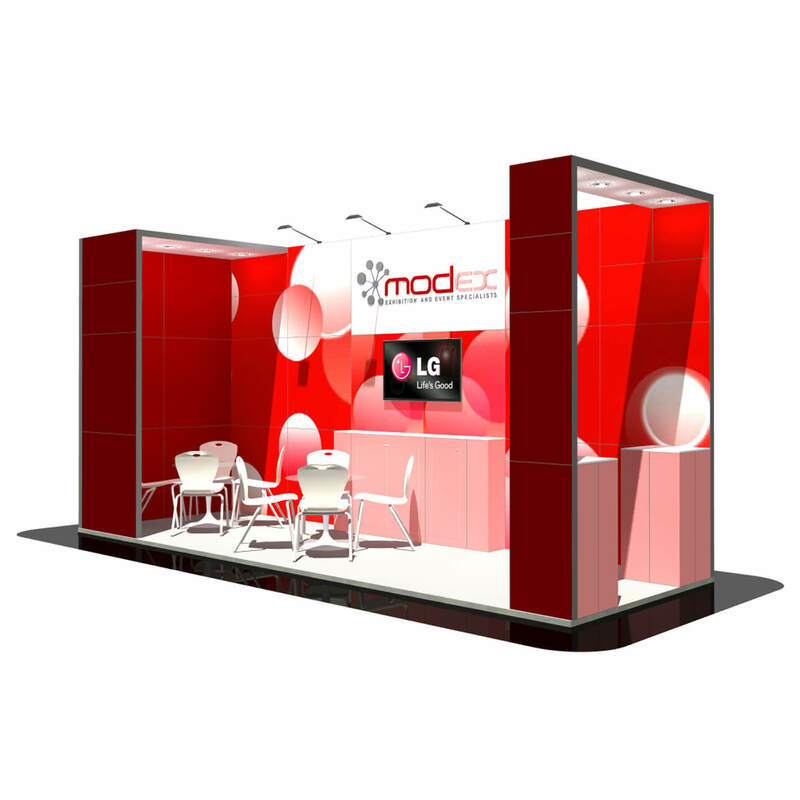 The main back wall is perfect for advertising your products/company. There is also a reception desk to meet and greet potential clients which includes 2 lockable cupboards. The whole stand has overhead led lighting and spotlights positioned neatly under the archway. 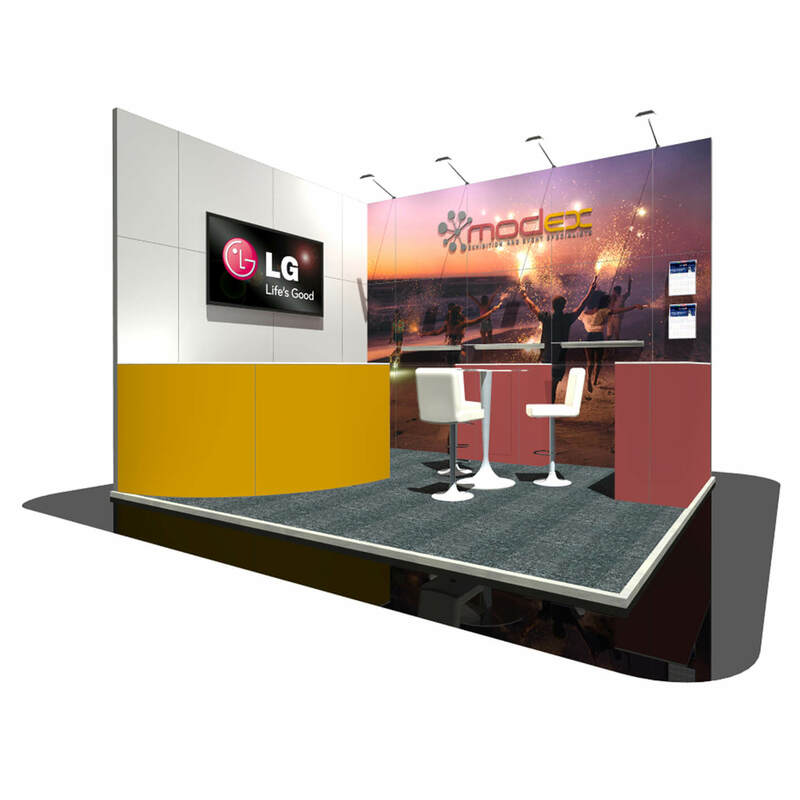 A corporate styled exhibition stand that includes 2 desk areas to sit and chat with customers. With a centralised counter, including lockable cupboards, coffee station and under counter fridge this five by four metre stand feels like an office without being closed in. 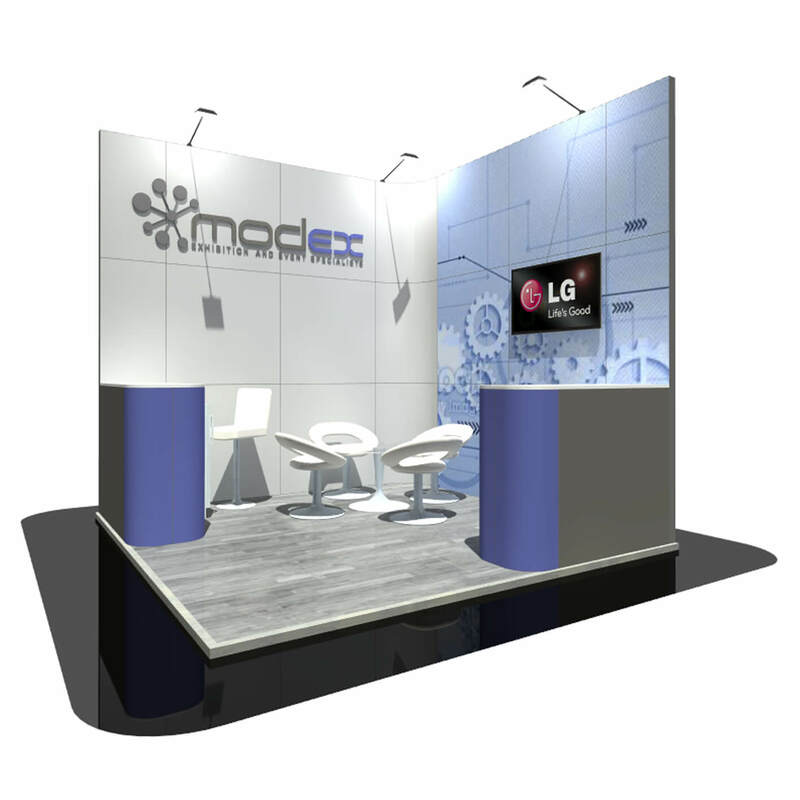 This five by four metre exhibition stand features 2 meeting areas neatly positioned under 2 arches which include under lit led lights. 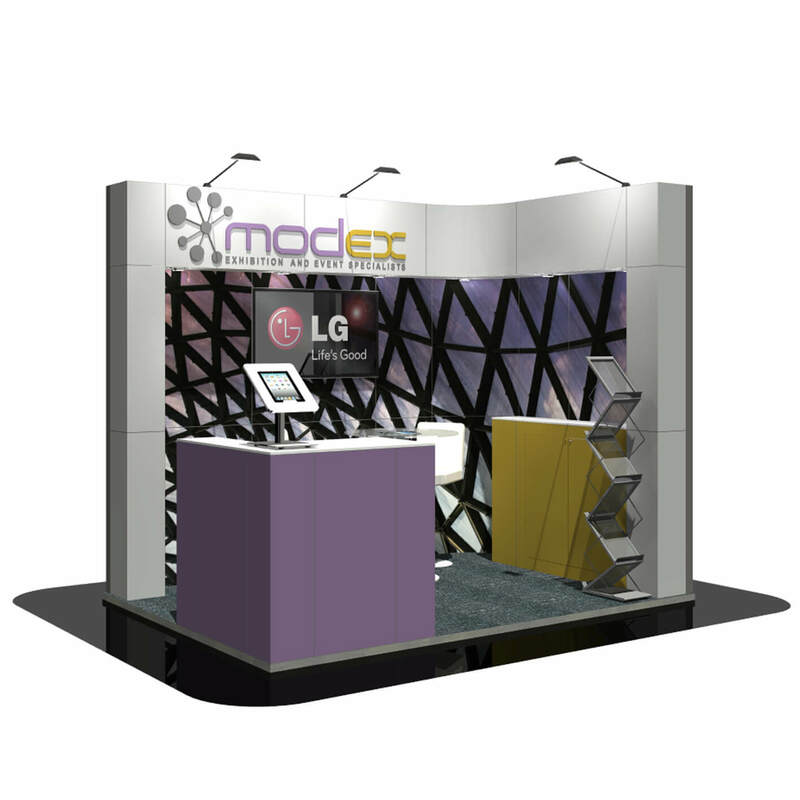 To complete the stand it has a store cupboard at the back, a lockable cupboard at the front and 2 large display screens. The whole stand is then lit with overhead lighting to make it stand out from the crowd. This open 6 x 2 metre stand has everything. 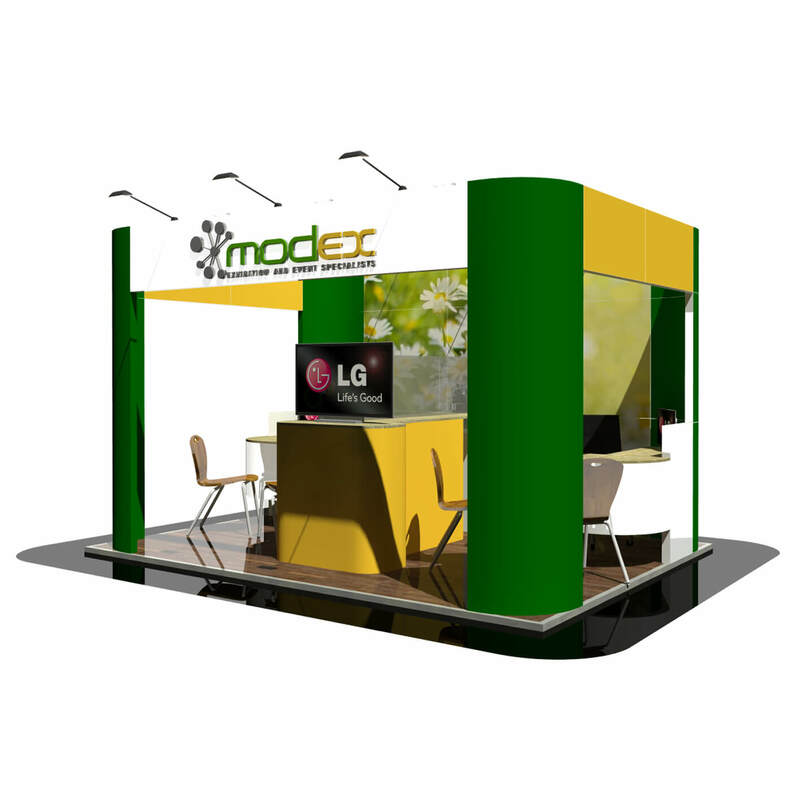 Corporate branding above a large display screen, a seating area set to one side for formal chats and 3 counters with lockable cupboards underneath. This stand also includes a undercounter fridge for any drinks required. 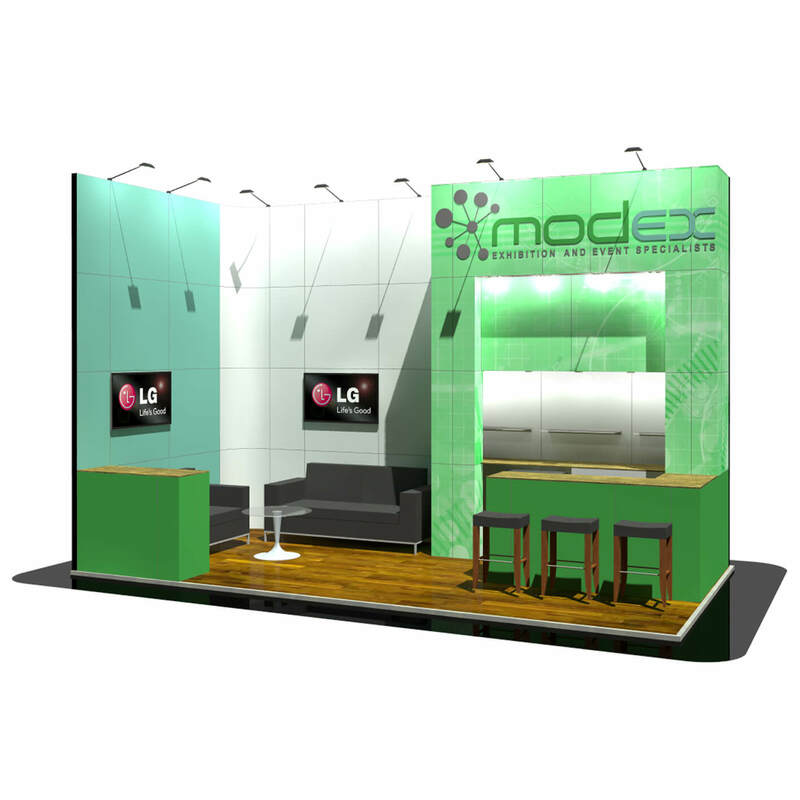 The large wall behind the seating area is perfect to print graphics for that extra impact. 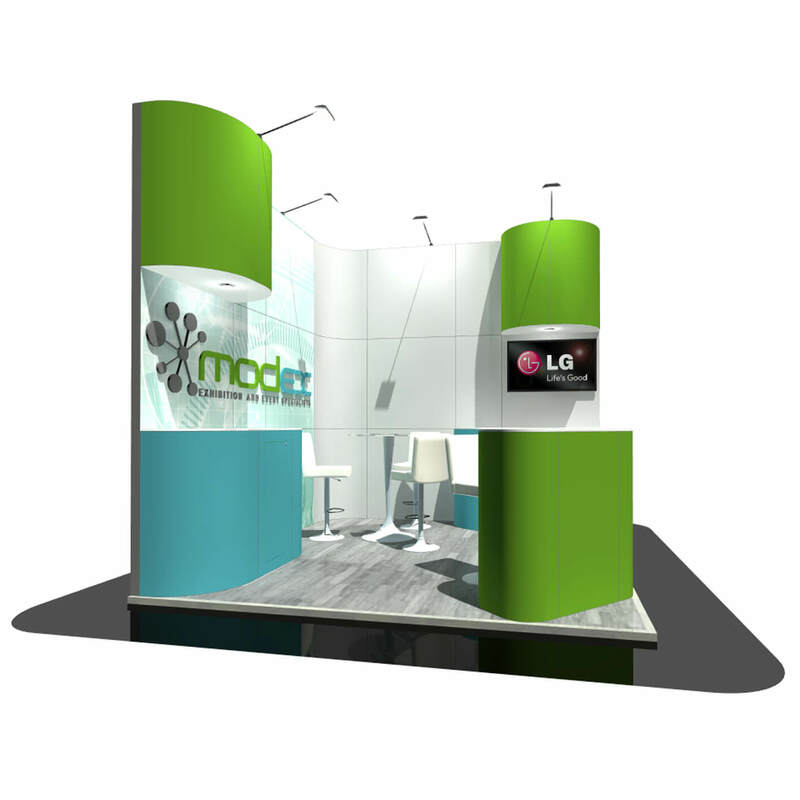 A six by two metre exhibition stand with a curved overhang on the top wall, flanked by 2 columns either side. A lockable cupboard at the side of the stand, low product display area and plenty of room at the back for freestanding products. 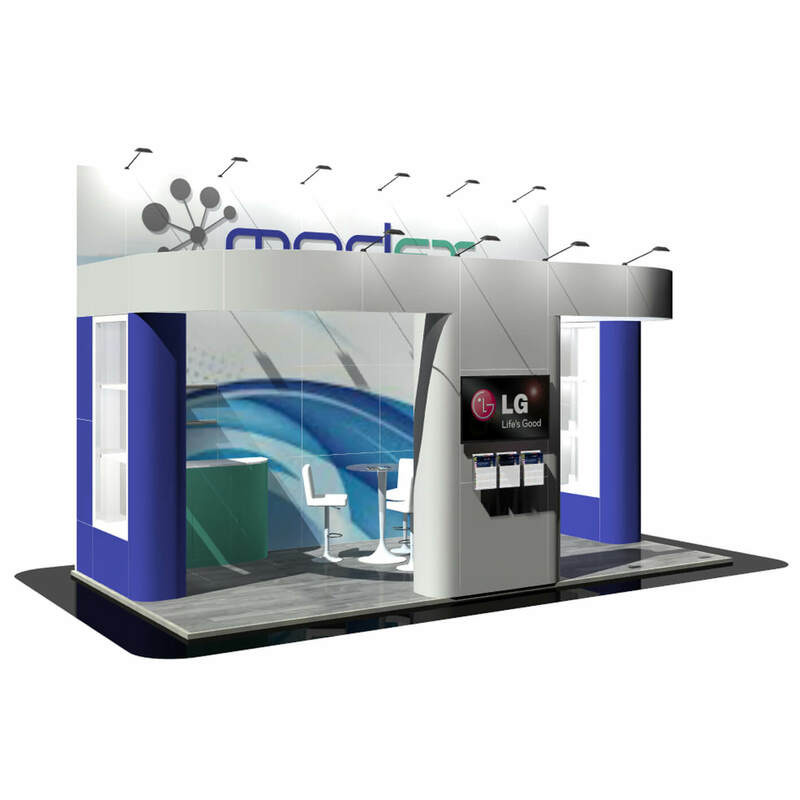 This stand also has a meeting table for customer interaction. 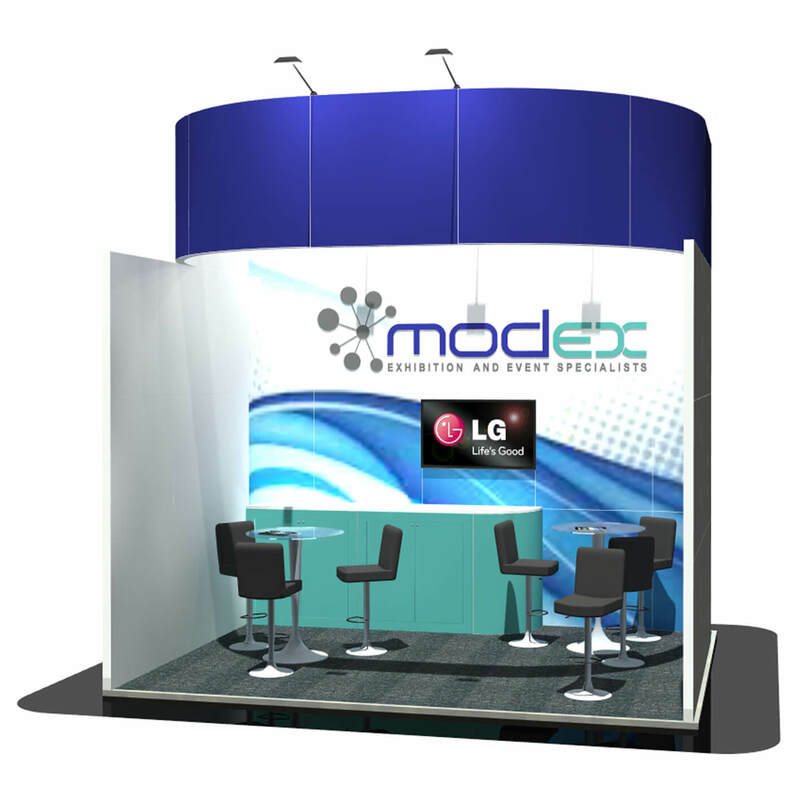 This 6 x 2 metre stand features 2 arches which are under lit with led lights at both sides of the stand. It also features a lockable cupboard, 2 small counters for products and 2 seated areas for customer interaction. 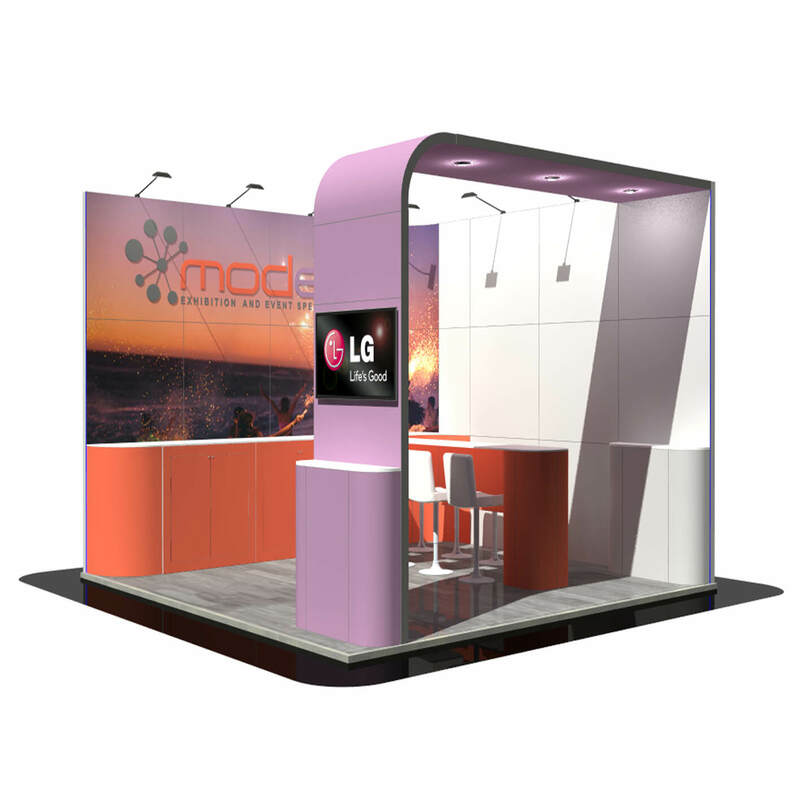 The main back wall is perfect for large graphics/company branding to promote your business and includes a large display screen for a rolling video. A six by two metre stand that combines the back and side wall with a store room – this contains shelving and a chair. 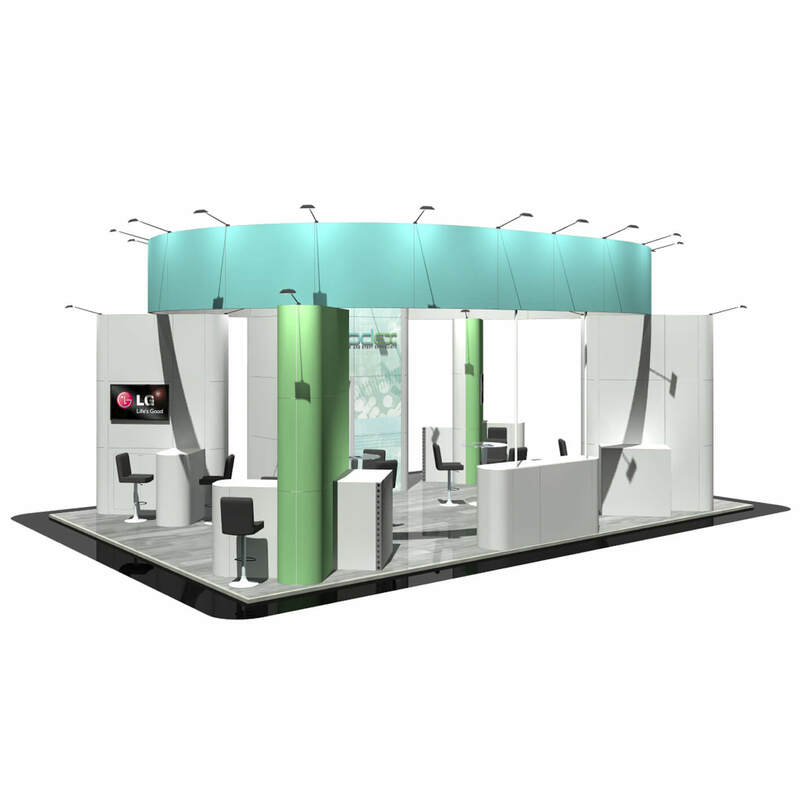 Also featuring on this stand are two front counters with lockable cupboards and a meeting table for customer interaction. 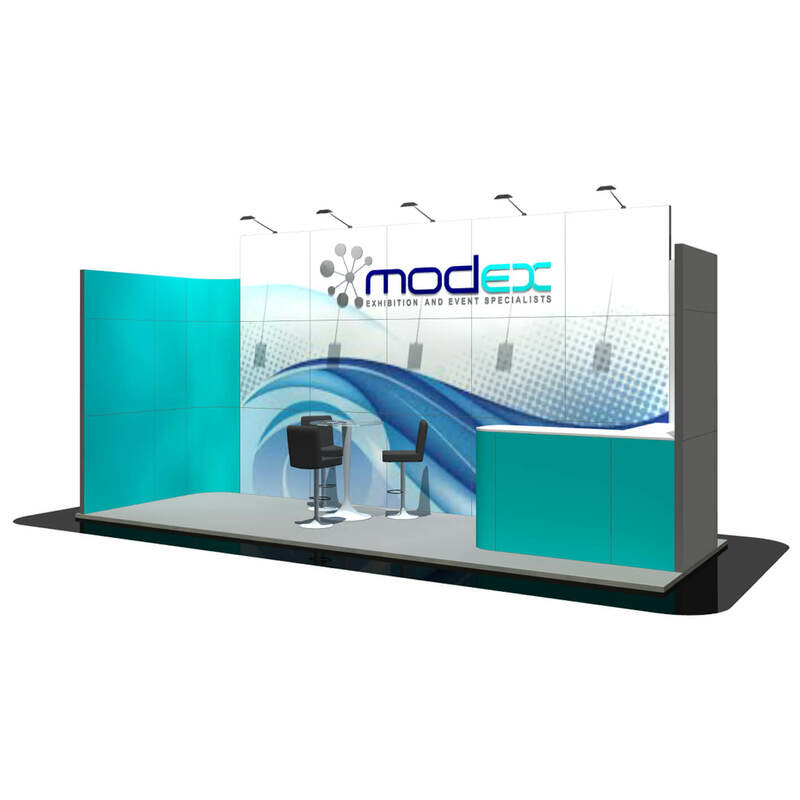 There is a large display screen placed on the back wall which is perfect for showing graphics from your laptop. 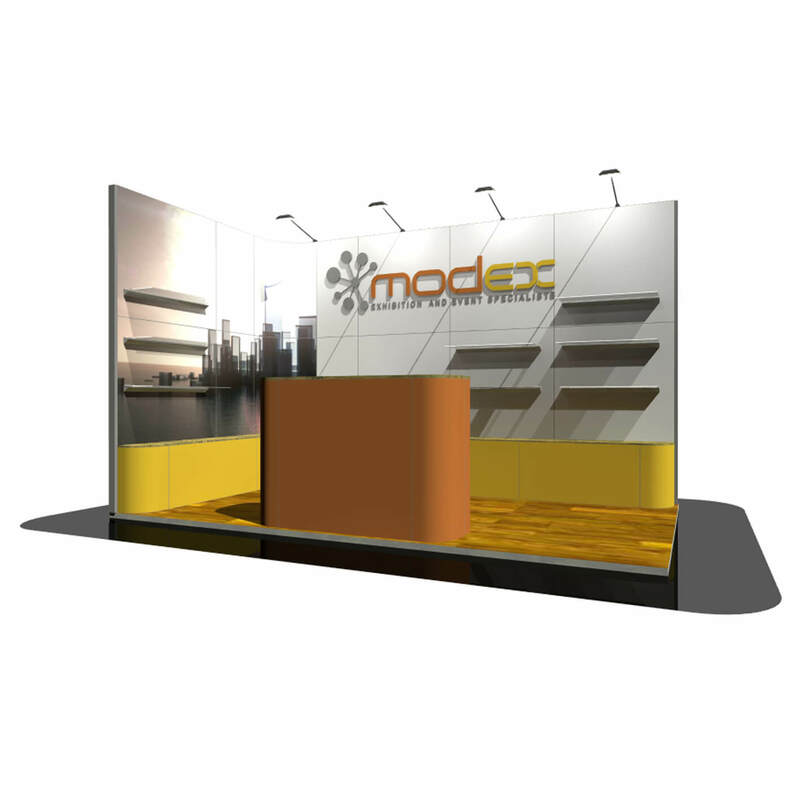 A simple 6 x 2 metre exhibition stand that lets the graphics do the talking. The large back wall is slightly higher than the 2 side walls for prominent company branding. 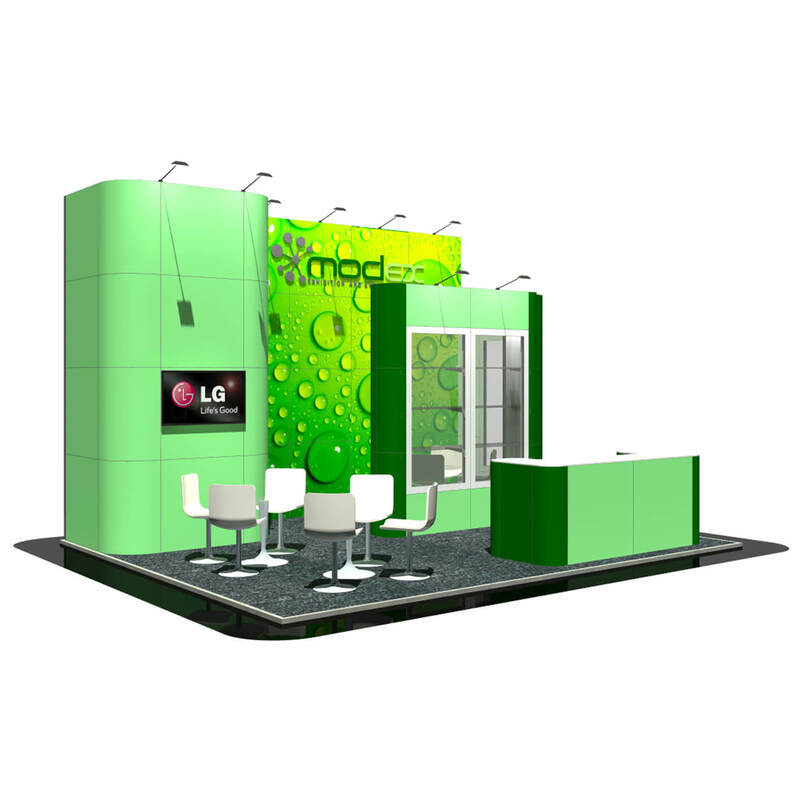 The stand features a meeting area for customer interaction and reception counter with a fridge and lockable cupboard. 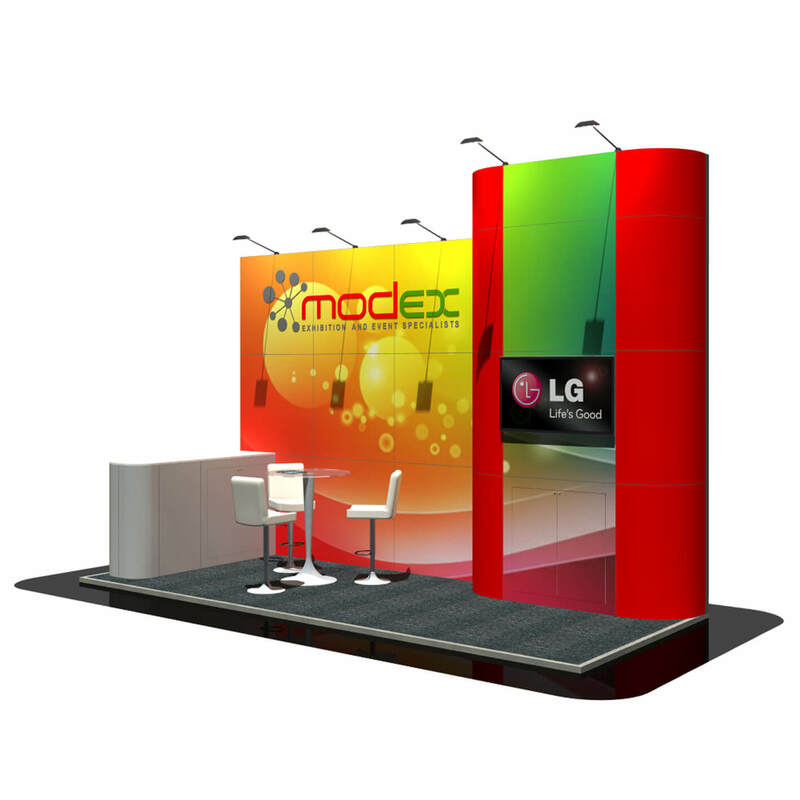 This six by five metre stand has 2 large LED lit display stands for all your merchandise. One is a main feature of the stand set on the front corner at an angle. 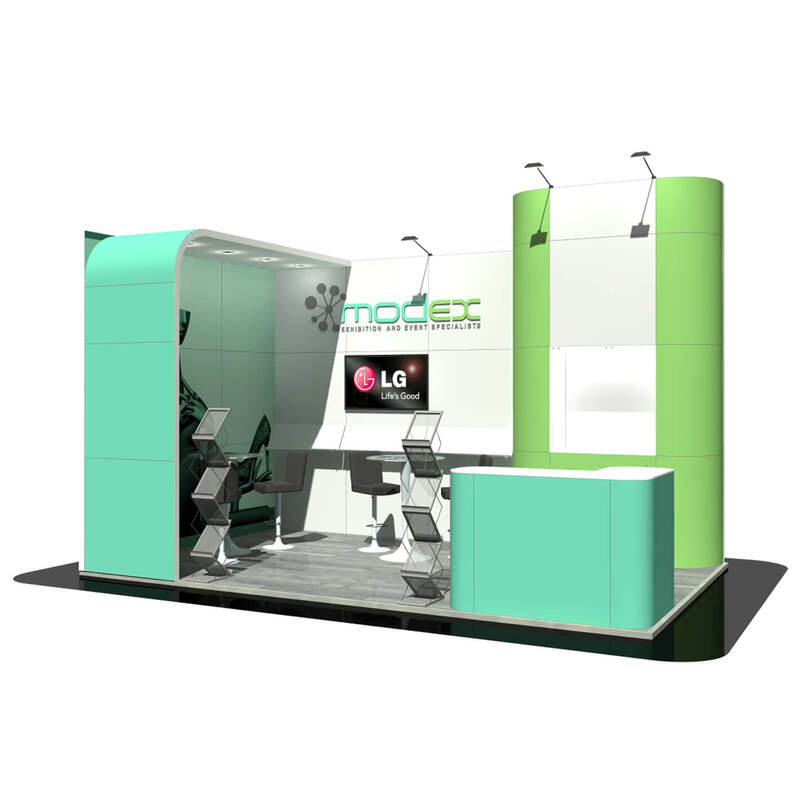 There are 2 seating areas to meet with potential customers and a corner storage room at the back of the stand along with a lockable cupboard at the front. 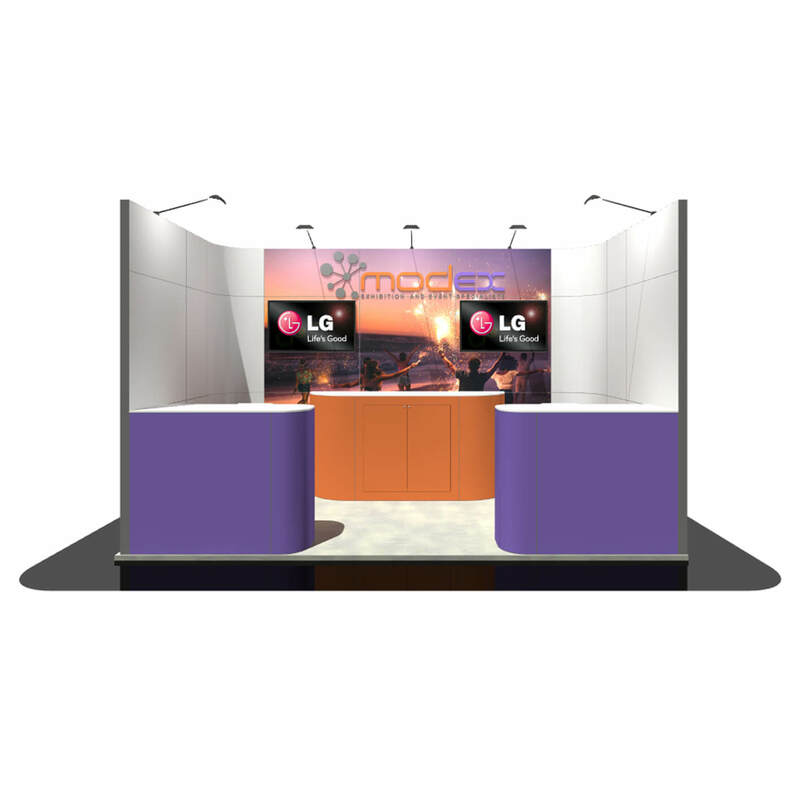 This 6 x 5 metre stand has two store rooms on either side which have been joined in the middle to create an arch across the top from left to right, both featuring a display screen for video media to be viewed. To enclose the stand there are acrylic panels on the front corners and to the rear of the stand. In the centre of the arch there is a meeting area for potential clients to sit and discuss business and a bar style counter with stools and lockable cupboards. This 6 x 5 metre stand incorporates a large store room and a comfortable lounge area with sofas and a coffee table on the main wall. 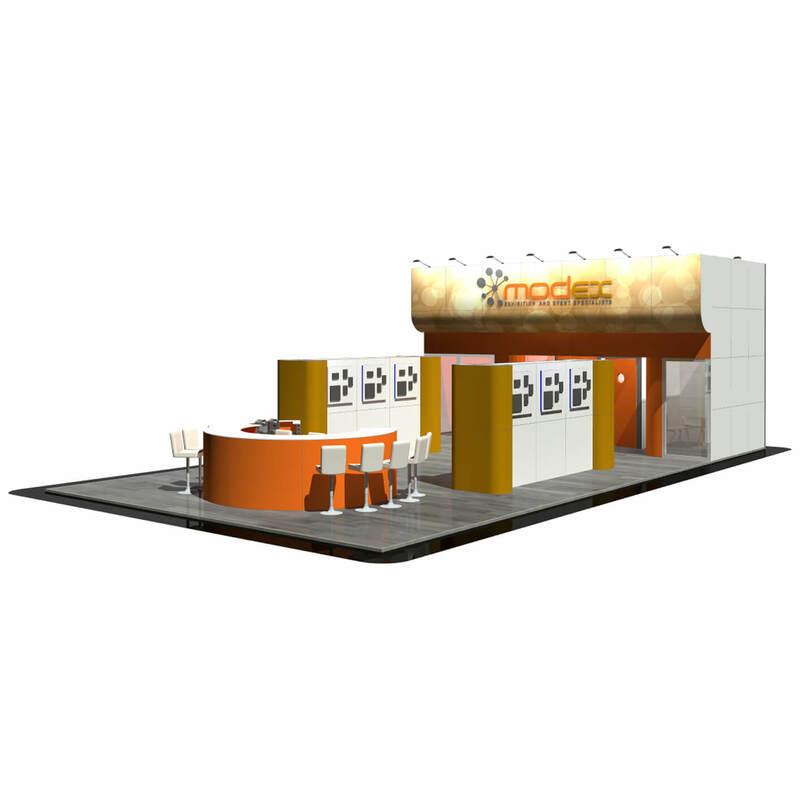 At the front of the stand there are even more meeting tables for customer interaction. Positioned in front of the store room there is a large reception counter with lockable cupboards. 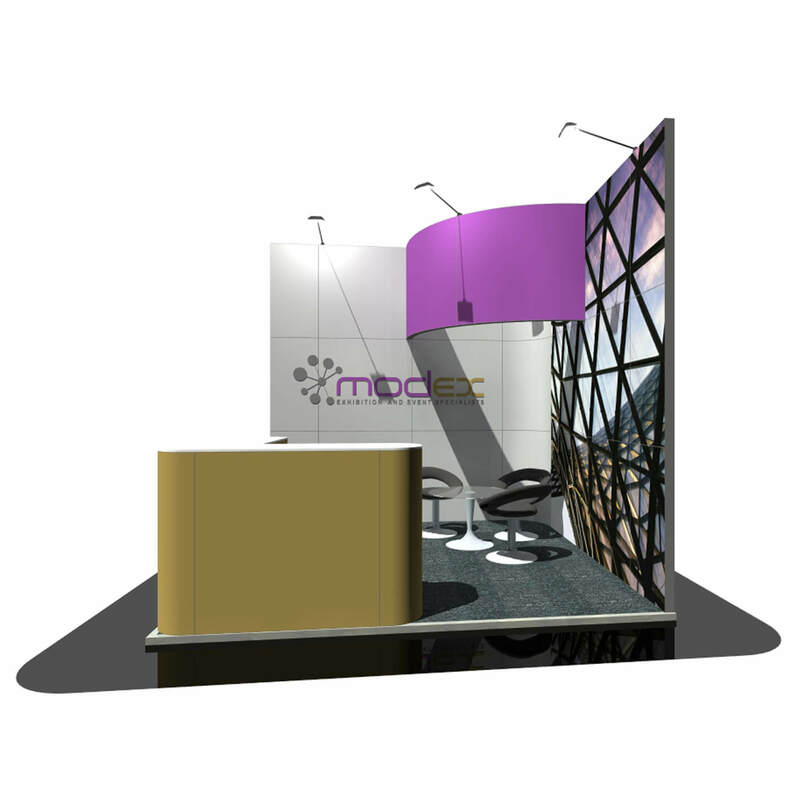 This six by five metre exhibition stand has a secluded meeting area to interact with customers, and 2 open meeting areas. The stand also features a large store room and a reception counter to catch passers-by.